The Girl in the Illusionary World is unable to continue on her journey, having failed to construct an operational aircraft and the robot regrets having encouraged her in this undertaking. She reveals that they knew one another in a previous world, and as she hums Dango Daikazoku, the world begins fading away. Tomoya appears on the hillside road lined with cherry blossoms and chases after Nagisa, promising that he’ll never let go. 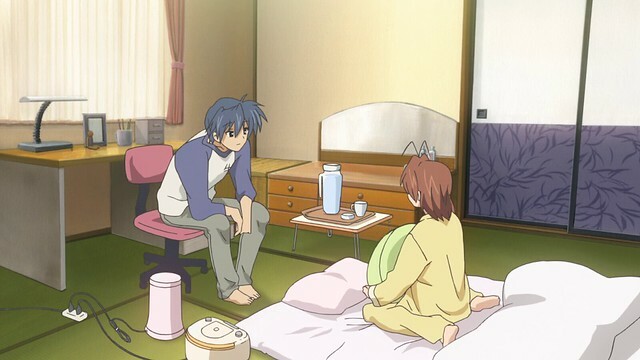 Nagisa is glad that he’d called out to her, and Tomoya reawakens prior to Ushio’s birth. Nagisa has survived delivering Ushio, and Tomoya prepares to bathe her for the first time. Outside, a miraculous phenomenon can be seen – orbs of light are floating into the sky. The couple sing Dango Daikazoku to Ushio, and begin their journey of raising her together as a family no longer bound to their doom. Five years later, Kyouko is taking Fuuko to the hospital for a check-up, but Fuuko runs off into the nearby woods, where she encounters Ushio sleeping peacefully under the shade of a tree. This marks the end to a journey spanning a year and five months: from CLANNAD‘s first episode, where Tomoya and Nagisa met, to the conclusion resulting from a well-deserved miracle that allows the Okazakis to finally find happiness, CLANNAD has come to an end, and with it, my own journey of revisiting the series ten years after its original airing. In this seventeen-month long journey spanning a total of forty-four episodes, CLANNAD has explored an incredible range of themes, encapsulating this in a story that is engaging, humourous and poignant manner. 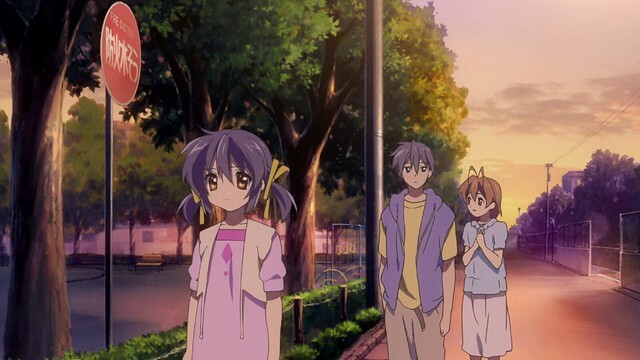 The characters are multi-dimensional, complex and human; in conjunction with a vividly-portrayed world where attention is paid to detail, weather and lighting that augments every emotion and a sublime soundtrack, CLANNAD represents anime at its very best, telling a compelling and genuine story that viewers of all backgrounds and experiences can connect with. For me, CLANNAD is a veritable masterpiece among masterpieces for its exceptional execution and presentation of life lessons essential for most everyone. 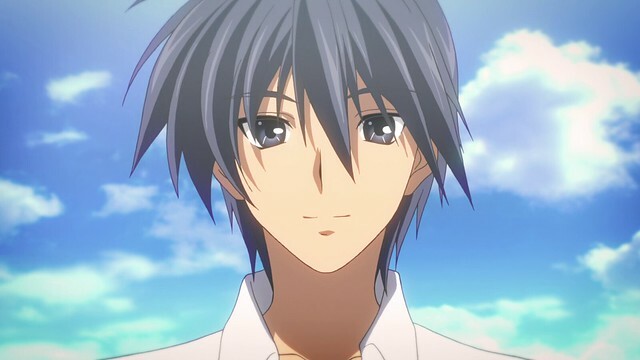 However, the series has not impacted all viewers quite to the same extent, and in particular, the finale left viewers feeling that deus ex machina was employed to provide Tomoya with a happy ending. In effect, these individuals contend, Tomoya is given a free pass and it would take a considerable suspension of disbelief to accept such an ending. Such a reaction can only arise from individuals who’d perhaps forgotten the presence of the light orbs and their function as a visual representation of the strength of individuals’ wishes: ~After Story~ is a very lengthy story, after all, and there are numerous details that foreshadow the possibility of Tomoya being given a second chance. 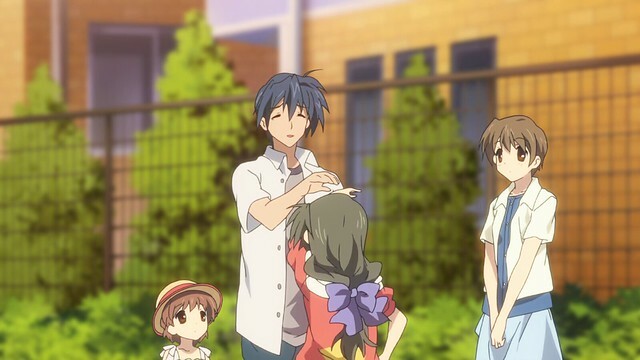 To deny Tomoya this happiness is to contradict the expectations that ~After Story~ have set; Tomoya’s acts of kindness permeate the whole of CLANNAD, and the series does, on top of its other themes, strive to convey that 好心得好報 (jyutping hou2 sam1 dak1 hou2 bou3, literally “good heart, good repayment”, and most similar to the English expression “what goes around comes around”). 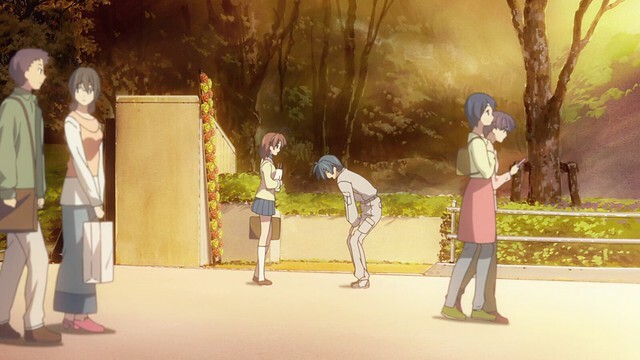 Having been made to suffer, and in spite of all this, coming out stronger and a better man for it, Tomoya has earned a happy ending with Nagisa and Ushio ten times over for having put everyone ahead of himself throughout CLANNAD. His selflessness and altruism cost him, but Tomoya never complains, never expects repayment and simply does his best for those around him, even when faced with his own challenges, and as such, the forces that are recognise this. 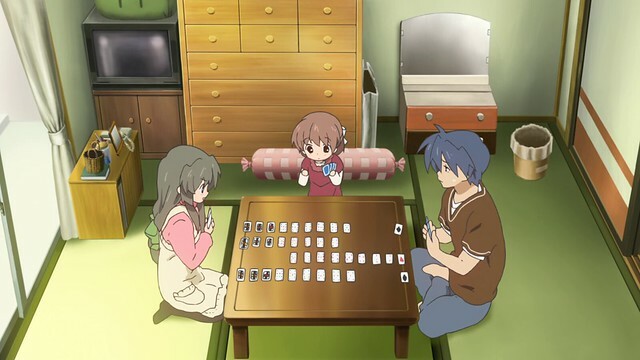 Leaving a trail of mended dreams and lives in his wake, even as he struggles to find happiness for Nagisa and Ushio, to deny Tomoya a happy ending would be the epitome of cynicism – the visual novel provides a more detailed explanation of why this is allowed to occur, and in the anime, the end result is identical. 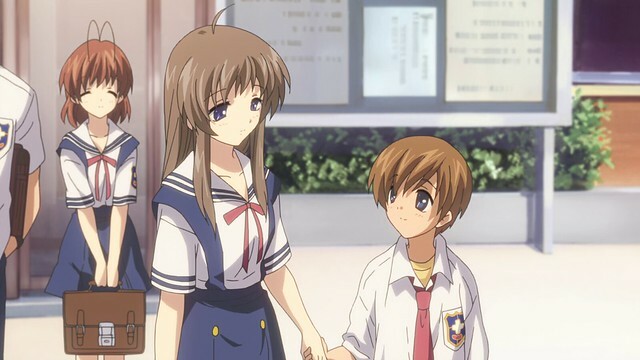 Viewers are treated with closure to a very lengthy and very rewarding journey; there is no doubt that Tomoya and Nagisa can share a peaceful and normal future with Ushio. This is the ending that viewers deserve and needed for such a powerful series which indubitably left a profound change in my life. We come to it at last, the ending of a great journey that spanned seventeen months. The page quote is an extended version of Nagisa’s words to Tomoya after they meet again on the path to school; Tomoya had come to regret meeting Nagisa and bringing suffering upon them both, but she found the limited time they’d spent together to be the happiest she’d known. Naigsa and Tomoya here still retain their memories, having been transported into a pocket universe of sorts where they come to terms with everything that’s happened. After cashing in on the wishes carried in each light orb, Tomoya reunites with Nagisa and his consciousness is transported back to the real world. In this reality, Nagisa survives labour and successfully gives birth to Ushio without any complications, bringing an end to the curse that had lingered. When I first watched this, I found that even in the absence of a complete understanding of the light orbs, the outcome still followed logically from the sum of the acts of kindness Tomoya carried out. To Tomoya, the stress of labour would have dulled his sense of time, and he might have experienced five years’ worth of events in his mind’s eye while tensely waiting for Nagisa to give birth. 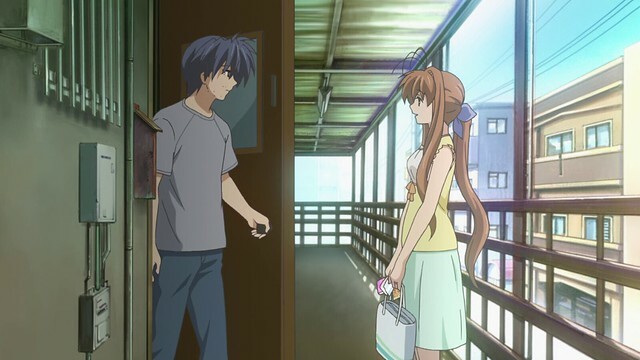 Of course, this is the scientific approach to things that disregards the light orbs, and the fact is that the light orbs very much have a tangible presence in CLANNAD, acting as the catalyst that allows Ushio to wish for a happy, normal life with her parents. After bathing Ushio for the first time, Tomoya tenderly holds her while Nagisa, the Furukawas and the midwife looks on. The worst is clearly over, and we enter one of the longest, most well-executed dénouements to be shown in any anime I’ve seen. When I first watched CLANNAD seven years previously, the Marvel Cinematic Universe was gearing up for the first of its crossover films with The Avengers, and only two of the Infinity Stones were showcased. The reality and time stones were not introduced until later: of the Infinity Stones, these two could prove useful in creating the realm that Tomoya is returned to. The Infinity Gems were originally conceived in 1972 and since then, have been wielded by a variety of characters, with Thanos being a particularly notable user for having united them to wipe out half the life in the universe. A common joke is that the stones can be used for more mundane purposes, and CLANNAD definitely seems like one such instance. Having said this, the ending strictly does not count as deus ex machina as some have asserted: there is a very well-established basis in how the happy ending came to be. Here, the phenomenon of light orbs rising into the sky can be seen as a sign, a lifting of the curse. 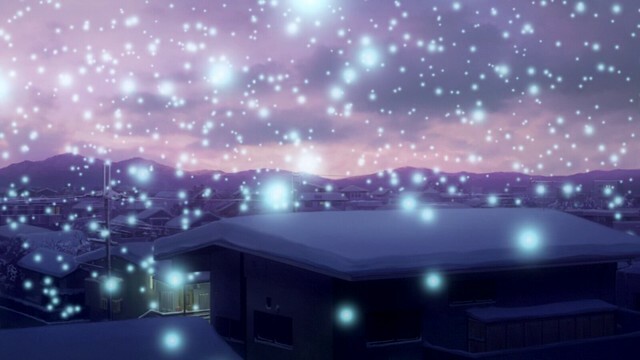 Large snowflakes resembling these light orbs are also seen in Kanon, Kyoto Animation’s precursor to CLANNAD. I would very much like to revisit Kanon at some point in the near future. 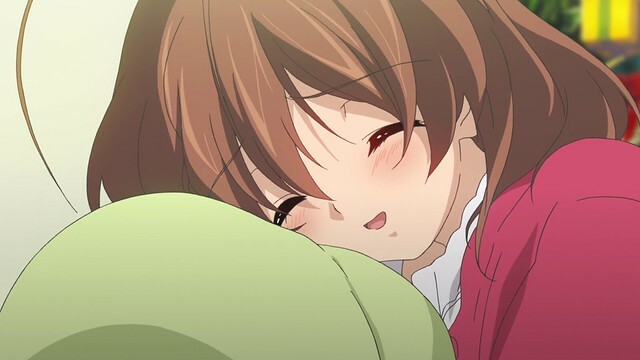 For the time being, as ~After Story~ wraps up, Nagisa and Tomoya sing “Dango Daikazoku” to a sleeping Ushio. The song transitions into Lia’s “Palm of a Tiny Hand”, a highly poignant, but optimistic and uplifting song that accompanies the montage of Ushio growing up. This song is one of the other songs in my library that I typically avoid listening to while out and about: besides “Natsukage” (also by Lia) and “Ichiban no Takaramono”, it’s one of the few songs that can make me cry. 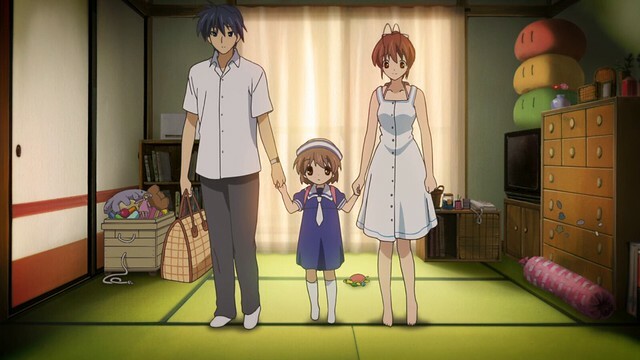 Moments of normalcy dominate the montage as viewers watch Ushio grow up with a loving family. 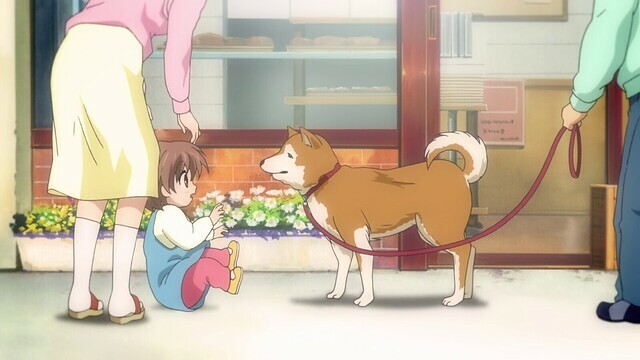 From being held, to learning to walk, the ending montage shows Ushio doing the sorts of things that young families do. My parents inform me that I learnt to talk before I could walk, and filled the house with babble before I was going all over the place. Some parents wonder about the correlation between talking early and intelligence, although there is a massive variation in when babies develop linguistic skills on account of things like their environment. For instance, babies who are talked to a great deal will learn to mimic speech earlier. Common, everyday events are a source of joy, and the montage goes through the effort of depicting these moments. Here, Ushio falls after being surprised by a shiba inu after trying to pet it: these spitz breeds are very independent, love being clean and were originally bred for hunting. One of my friends of old has a shiba inu, and I was able to play with this dog as a puppy. It may come as a surprise to some that I’m actually quite fond of smaller dogs, but then again, readers should not be so surprised, since I’ve often expressed that I would like to look after rabbits. 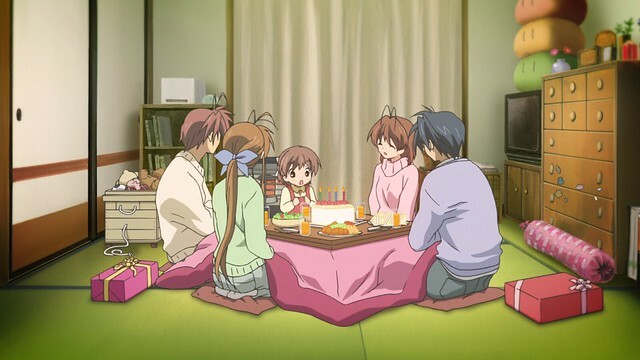 Ushio celebrates her fourth birthday at home. I have a photograph of me with a muffin and a candle stuck on it for my earlier birthdays: having celebrated with relatives ahead of time, my parents decided to do something simple on the actual day of my birthday. There’s actually a fairly funny story behind this – I’m told that at the age of two, I was afraid of candles and wouldn’t get near the flame to blow it out. Akio is an avid baseball player, and Tomoya managed to win Nagisa’s hand in marriage after succeeding in hitting a baseball: with the role that baseball has had on Tomoya, it stands to reason that Ushio also begins learning to play baseball. Here in Canada, ice hockey is the national pastime, although it’s an expensive one from a financial and time perspective, so I never got into it. Instead, I took swimming lessons and did karate: today, I still retain basic knowledge about swimming, and I’m a nidan. 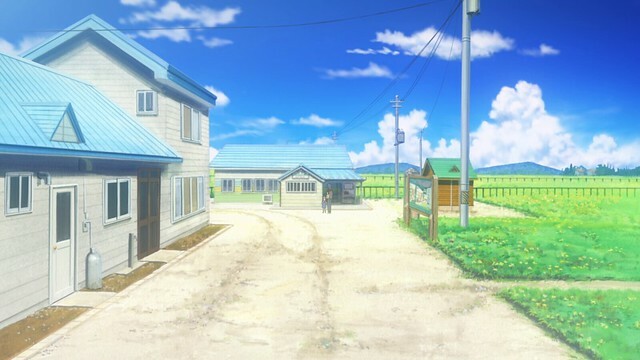 One summer, Tomoya and Nagisa decide to take Ushio out into the countryside for a vacation of the same one that Tomoya had done in the other timeline. The observant viewer will note that Tomoya is wearing a similar button-up shirt as he did in the Ushio arc, but here, said shirt is buttoned-up and ironed properly. Such a minor detail might easily be missed, but it plainly shows the difference between the Tomoyas seen in the different timelines. The key difference ~After Story~‘s finale shows is that with Nagisa present, Tomoya’s true nature is much more prominent as he devotes his energy towards raising Ushio with Nagisa. The two have differing personalities that complement one another, and having gone through so much together, Tomoya and Nagisa understand one another better than anyone else. The same trip they take with Ushio here is much more relaxed, and taken under much happier circumstances. After watching Super Sonico‘s “Star Rain” episode, I longed to explore somewhere that was nearby, and in the five years following, I have realised this particular dream in a manner of speaking, having capitalised on the summer weather to do hikes and other things. Having said this, I still can’t help but wish that there was a more extensive train and bus service that would allow me to reach the far corners of my province: while driving is fun, so is sitting back and admiring the scenery passing by. Under the same flower field, Ushio runs with a look of pure bliss on her face. There are no meadows where I live, but there are plenty of parks where children have space to hang out and run to their heart’s content. 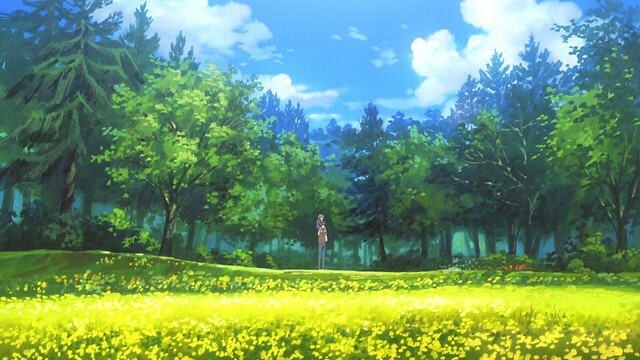 The countryside of CLANNAD is portrayed as a magical location far removed from the hustle and bustle of the city: in Japan, space is at a premium, and such locations are rare in cities. By comparison, Canada is the land of open spaces and beautiful parks are everywhere. Tomoya and Nagisa are probably my favourite anime couple. Despite the extraordinary events they experience, both are down-to-earth and pragmatic. Their relationship is characterised by finding happiness everyday things. If I had to pick a second-favourite couple, Ryuji Takasu and Taiga Aisaka tie for second with Your Lie in April‘s Kōsei Arima and Kaori Miyazono. I have indeed watched Toradora!, having finished the series three years ago and loved every second of it for its natural development of a love story, as I did the developments of Your Lie in April. My favourite love stories involve characters who discover an unexpected love for one another as a result of their objectives bringing them together over a period of time. While my age means that meeting that special someone underneath the cherry blossoms or in a classroom by evening is now relegated to little more than a distant dream, an impossibility, I know that love can come from anywhere, anytime. Rather than pursue something for the sake of being in a relationship, I am going to continue doing me, and then make the most of wherever that will take me. Life is a journey, and the folks who pace themselves for a marathon invariably will find their way in the world. 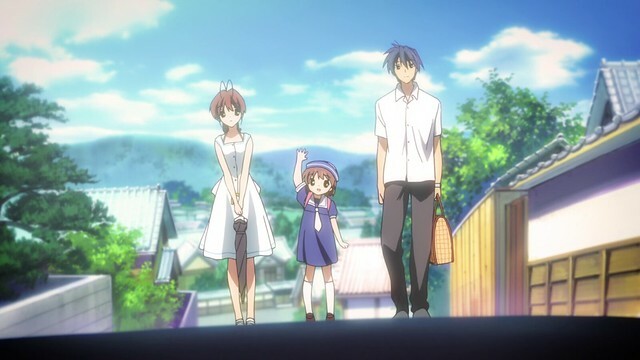 After Ushio is seen joyfully exploring the flower field while her parents look on, the montage transitions over to the what that the other characters have made of their time since graduation. These scenes are functionally similar to the “where are they now” segment of Animal House, which showcases the protagonist’s futures, and which was parodied in Futurama‘s “Mars University”, but in ~After Story~, serve to communicate to viewers that everyone’s found their own path following graduation. 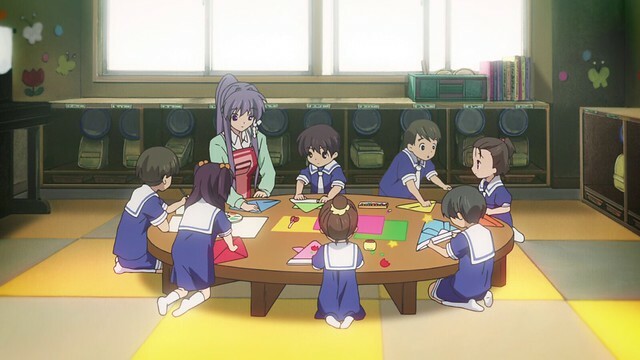 Audiences already know that Kyou has become a kindergarten teacher and gets along well with her students. Being able to work with groups of children, while prima facie a fun and joyful job, doubtlessly also has its challenges, and it takes a certain mentality to be successful in this career. I have nothing but respect for my kindergarten teacher, as well as all of my primary school teachers, who were made to put up with my curiosity and the attendant trouble that is supposed to have brought. Ryou is a nurse, and the visual novel further shows that she finds romance, as well. Nursing is a respectable profession, and I have a friend who’s in nursing. I encountered him while visiting a new health campus and was initially wondering if it was indeed him, but thought better of greeting him in case I was wrong. The next day, during karate class, it turns out it really was him, and he was wondering if I was really me, or someone else. 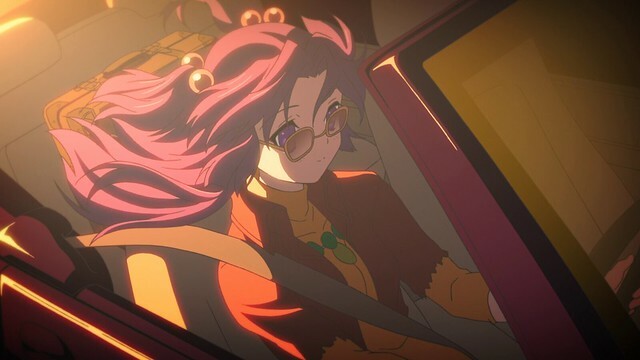 Kotomi went overseas to study cosmology in an American university, and is devoted to continuing her parents’ research in M-theory and higher dimensions, an integral part of parallel universes. Her work would likely put her in contact with research from giants like Steven Hawking and Brian Greene. Alternate realities did end up playing a role in CLANNAD ~After Story~, although their precise mechanisms are deliberately left unexplored because they are secondary to the narrative: what matters is that there does appear to be some elements that accommodate the ending that Tomoya ended up getting (and deserving). Youhei pursued a career in modelling, and has reverted to his natural hair colour, indicating a return to the right path. He’s shown screwing up in a road test, and after apologising to his instructor, focuses on continuing with the course. Because Youhei has found a path to pursue, Mei, also has become more cheerful; no longer worried about her older brother’s future, she is free to pursue her own dreams whole-heartedly and is seen hanging out with her friends here. 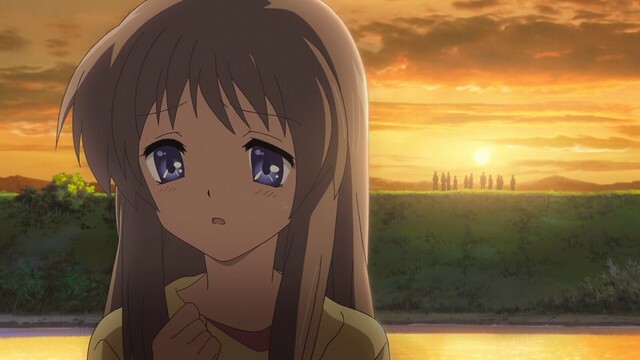 Tomoyo’s future is a bit more uncertain: she’s shown to be gazing out at a sunset on a beach. 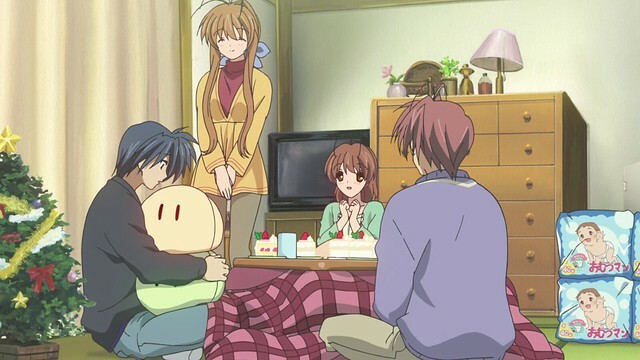 Many viewers associated this with melancholy and felt that Tomoyo’s future was less positive than they would have liked: in CLANNAD, her main objective was to preserve the cherry trees for her younger brother, and not much more about her aspirations were presented in ~After Story~, but supplementary materials suggests that she is able to realise other accomplishments and find happiness. One question that the epilogue does not explicitly cover, is whether or not Tomoya comes to terms with his father in this new timeline. 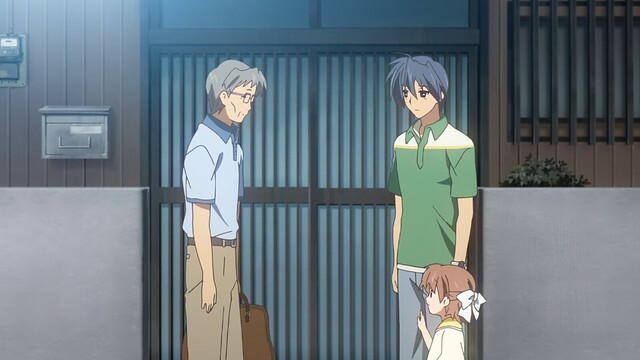 In the original timeline, Ushio’s presence eventually compels Tomoya to understand his father and make amends. I imagine that Nagisa’s continued presence, her gentle influence and desire to see Tomoya happy would eventually see her encourage Tomoya to make amends, allowing a similar outcome to be reached. 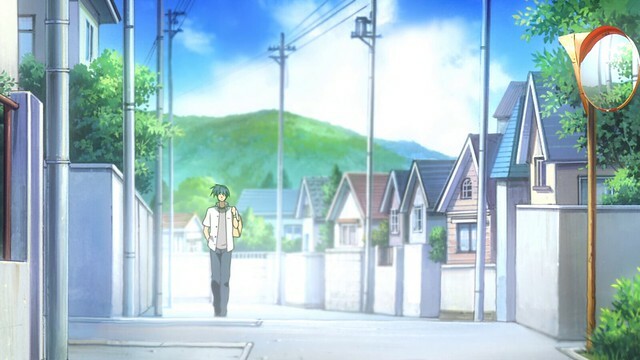 It is not inconceivable for a happier, more empathetic Tomoya to undertake such a course of action: they are visiting a town here close to where Tomoya originally met his grandmother, and it could be implied that the whole family is here to catch up with Tomoya’s father and grandmother. If and when I am asked, CLANNAD ~After Story~ is my favourite anime series. I have seen numerous series both before and after, but few have compelled me to care for the characters and their journeys quite to the same extent that CLANNAD ~After Story~ had. In conjunction with superb artwork that looks amazing even a decade later, strong writing, a colourful cast and a soundtrack that adds atmospherics to a scene sufficiently well so that the music itself might be considered a character, I have next to nothing negative to say about ~After Story~. The soundtrack in particular incorporates a range of instruments and composition styles: besides Dango Daikazoku and its variations, the pieces are all appropriate for different moments in the series. It worth mentioning that the incidental pieces in CLANNAD are not all found on the original soundtrack: a handful of pieces with a more distinctly Irish component is included with the Mabinogi soundtrack, itself named for a collection of Welsh prose known as the Mabinogion. The Mabinogi soundtrack is very heavily influenced by Irish elements, giving it a very distinct and unique sound, while the original soundtrack is more conventional in composition, making extensive use of piano to capture emotions. The name “Clannad” is derived off the Irish word for family, “Clann”, and was first used by a family band of the same name that was formed in 1970. Originally known as “Clann as Dobhar”, their name was later shortened to Clannad. Clannad is known for their eclectic musical style, performing folk music and rock with Celtic elements, smooth jazz and even Gregorian chants. Jun Maeda eventually saw this name while writing out the story for CLANNAD and imagined it to be the Irish word for family, giving the series its name. In the epilogue, Fuuko and Kyouko are headed to the hospital for Fuuko’s checkup. Fuuko’s unusual way of thinking gives rise to non sequiturs that make no sense even to Kyouko, and Kyouko can only play along. It’s a gentle ending to what was a highly poignant and emotional journey, and returning Fuuko briefly to the spotlight is a callback to the first season, where Fuuko ends up being the first individual Tomoya helps out, and the first person to feel that Tomoya and Nagisa was a couple. 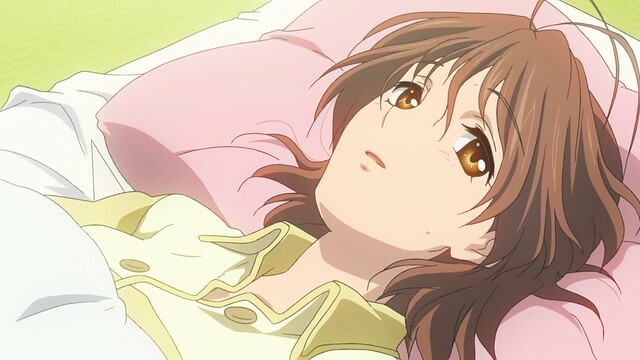 Folks wondering whether or not I will go back and write about the OVAs will be disappointed: I’ve already covered them in some capacity and admittedly, writing about CLANNAD is very taxing. 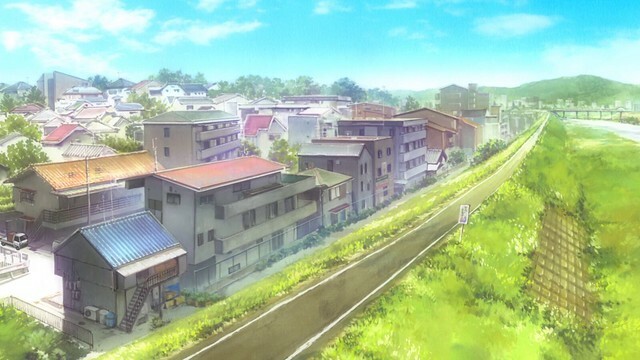 The settings of CLANNAD are based in Mizuho, a town located on the western edge of Tokyo. 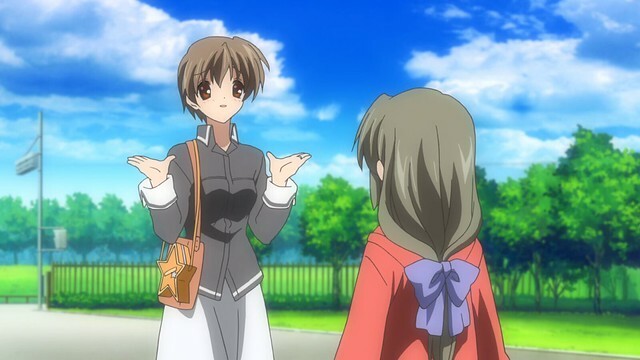 Its name is never given in CLANNAD, but the city is referred to as Hikarizaka (lit. “Hill of Light”) amongst the fans. As we draw to the close of a revisitation project that spanned seventeen months, I note that even in this time frame, a great deal has happened. CLANNAD captures the idea that the flow of time is relentless, and life is what we make of it: when I first began this journey, it was an October evening that coincided with a pleasant Mid-Autumn festival, I remarked that I would be curious to see whether or not my thoughts would change on this series. My verdict is that, like a fine wine, or a good steak, CLANNAD has become even more enjoyable with age. It’s a timeless series whose messages continue to remain relevant, and I am very glad to have revisited it. When I finished the revisitation for the first season, I asked readers if they would be interested in a continuation. One reader stands out to me for having made the request, and I continued into CLANNAD ~After Story~ for them: if even one reader wishes for me to explore something, I will do my best to honour their request. I understand that this particular is very busy at present, but I do hope that they would have the chance to take a look at these later posts when time allows them to: we both share commonalities in our background, and I greatly enjoyed hearing new perspectives on experiences I have also encountered. This is one of the joys of blogging that has given me the inspiration to continue writing: being able to really connect with readers and share experiences gives both me and the readers a sense that we’re not really alone in this vast world. On the flipside, I am admittedly a little curious to also hear from those who may have not found CLANNAD as moving as as I have; at the end of the day, mine is just an opinion (no matter how well-defined, thoughtful, insightful and detailed it may be), so I would like to see also why some folks did not enjoy CLANNAD. As ~After Story~ draws to a close, Fuuko runs off after feeling something special in the woods nearby: she encounters the Girl from The Imaginary World, who turns out to be Ushio, sleeping peacefully under the shade of a tree. 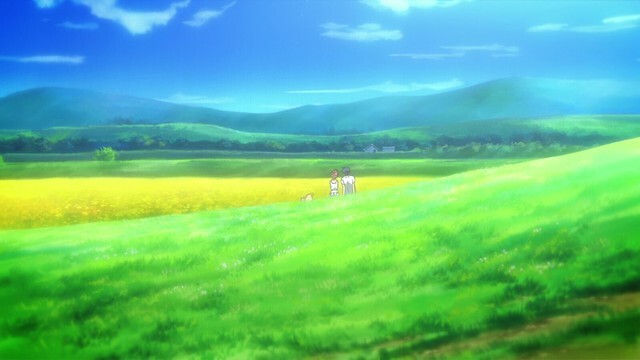 The final still of ~After Story~ shows that in the end, the sum of good deeds, genuine compassion and empathy in CLANNAD has allowed the very city itself to accept its citizens. 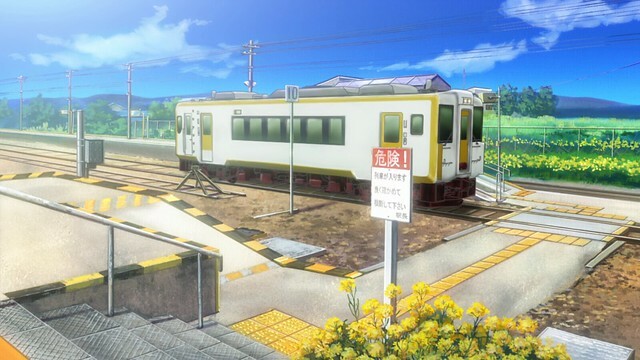 That Ushio is sleeping in an untouched grove adjacent to a modern hospital shows that humanity and nature can co-exist, much like how people of different backgrounds, experiences and station can co-exist. With this, I have fully finished my revisitation of CLANNAD and CLANNAD ~After Story~ in full. 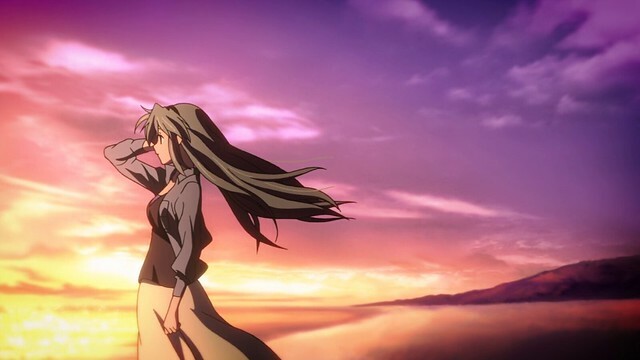 Even though these posts have been very difficult to write for, I think the journey itself was well worth it, and I hope that for the readers, these posts have clarified what CLANNAD means to me. 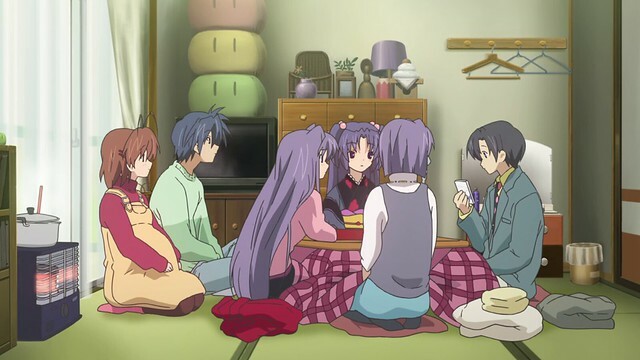 Everyone will have their own stories as to which series have had a profound impact on them, and for me, CLANNAD occupies a very special place in my heart, being something that lifted me through challenging times and also broadened my perspective on family. While a decade may have passed since CLANNAD and CLANNAD ~After Story~‘s airing, that the anime remains relevant, moving and engaging in the present is no small feat. 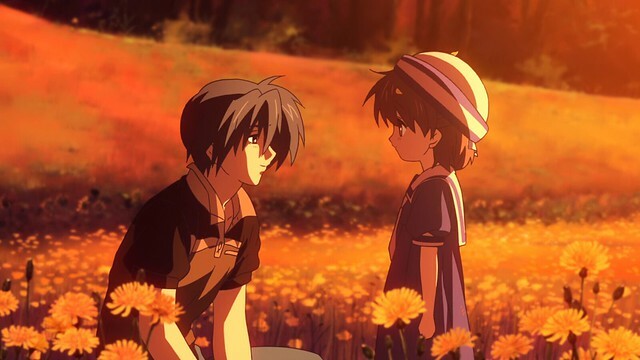 With its universal themes of family, friendship, kindness and resolve, CLANNAD is a timeless anime that deals in matters that are common to all of humanity. 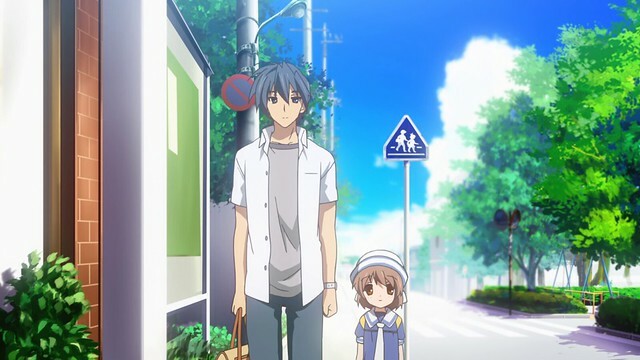 It is for this reason that CLANNAD is peerless as an anime – touching so many elements that are involved with being a decent human being, the sorts of thing I know in my tongue as 做人道理 (jyutping zou6 jan4 dou6 lei5, literally “principles of being human”), the series forces viewers to introspect and consider what matters most to them. 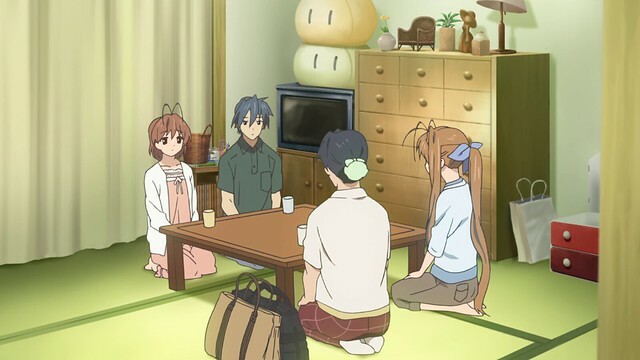 While CLANNAD may not deal with academic, social or philosophical matters that some echelons of the anime community feel to be more important in what counts as a “good” anime, I personally find that the anime that are most relatable and relevant, happen to be those that deal with life lessons ubiquitous to all people. At the end of the day, regardless of one’s station, education and occupation, everything boils down to how one treats those around them. 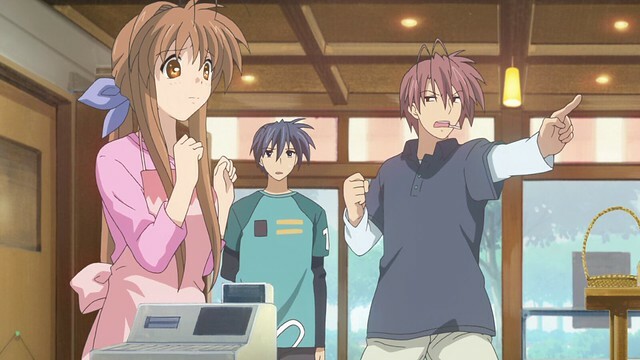 In the contemporary world, it is disappointing and disheartening that so many have forgotten these fundamentals: people no longer look out for one another and put themselves ahead of others with greater frequency, and as such, anime such as CLANNAD can act as very subtle reminders that life is more than the self; happiness is found in being there for others, for putting time into things far greater than oneself. 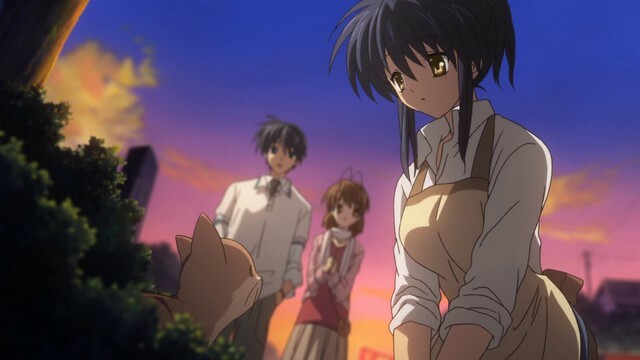 Despite its themes being at the forefront of most everything in CLANNAD, the series never preaches these messages to viewers, leaving them to draw their own conclusions after everything has wrapped up, and subtly inspiring audiences to do good, put in an honest effort and appreciate their blessings. 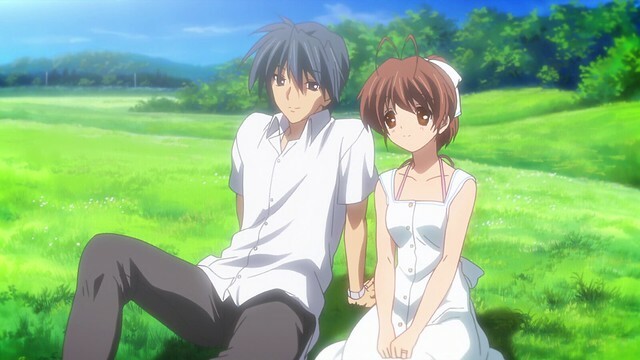 I am certainly glad to have watched CLANNAD: this is a series that pushed me to explore what love is and allowed me to find the strength to face down the MCAT. For everyone who’s been reading these posts every step of this seventeen-month-long journey, I would like to thank you from the bottom of my heart for having accompanied me all this way, as well as for putting up with what I would imagine to be increasingly sentimental and soppy posts. Five years after Nagisa’s death, Tomoya has fallen into a depression, spending his days working and down time drinking. Sanae decides to visit Tomoya one day, and after taking him on a date of sorts, strong-arms Tomoya into taking a vacation with her and Akio. However, on the day of their trip, the Furukawas are nowhere to be found, and Tomoya decides to take Ushio on the trip. 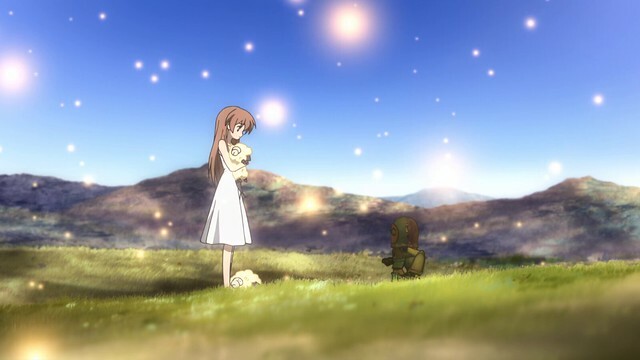 While having a difficult time getting closer to Ushio, he buys her a toy robot, and later takes her to a field of flowers. 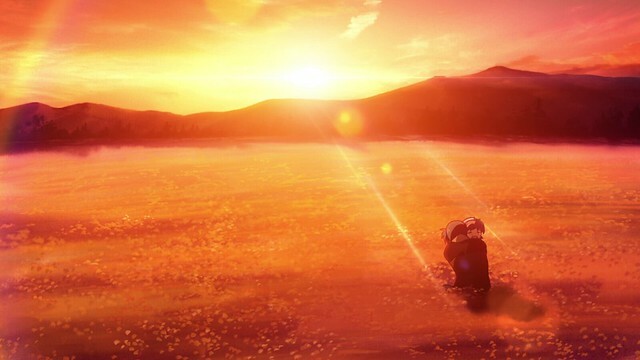 Tomoya realises that his father had once taken him here, and while Ushio searches for her robot, which she’d lost, Tomoya climbs a hill, running into his grandmother and learns that his father had poured his heart and soul into supporting Tomoya after his mother, Atsuko, died in a car accident. Realising that his father had done his best to look after him, and that he’s neglected to do the same for Ushio, Tomoya realises that his father had never stopped caring for him. 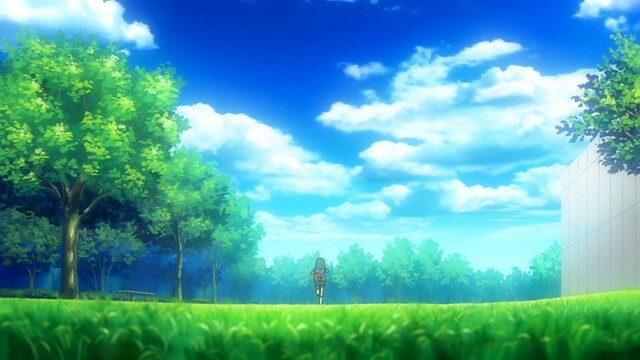 He returns to the field, where Ushio is still searching for the robot. She cherishes it because it’s the first thing her father’s ever bought for her, and Tomoya asks Ushio if she is willing to forgive him. On their way home, Tomoya tells Ushio about Nagisa. 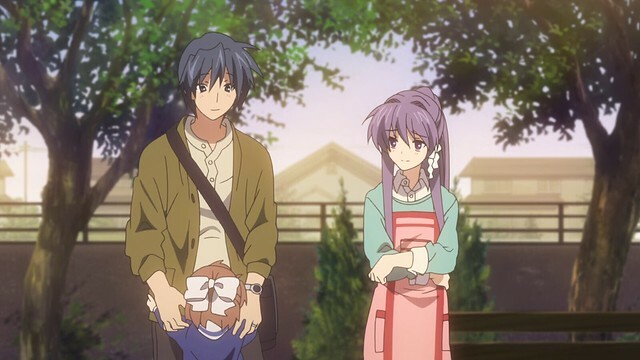 The father and daughter settle into their new life together: after convincing his father to rest and that his duties have been completed, that it’s okay to return home, Tomoya learns that Ushio’s kindergarten instructor is none other than Kyou. 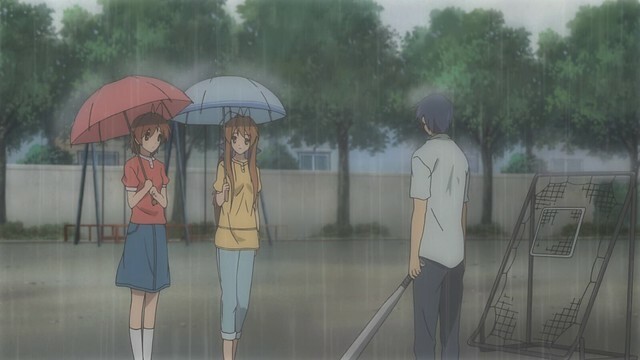 Ushio also befriends Fuuko, and Tomoya later agrees to visit Ushio for her school’s sports day. 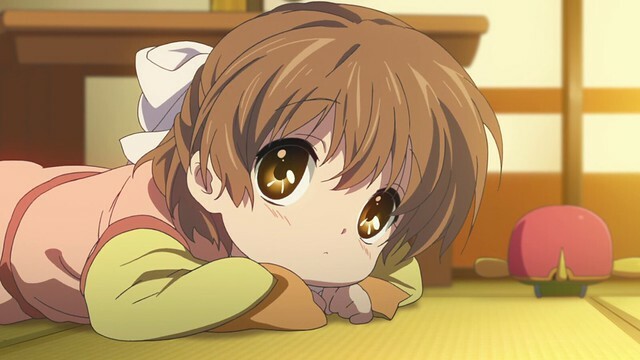 However, Ushio develops a fever and is bed-ridden. Tomoya stays by her side and asks the Furukawas to help out. 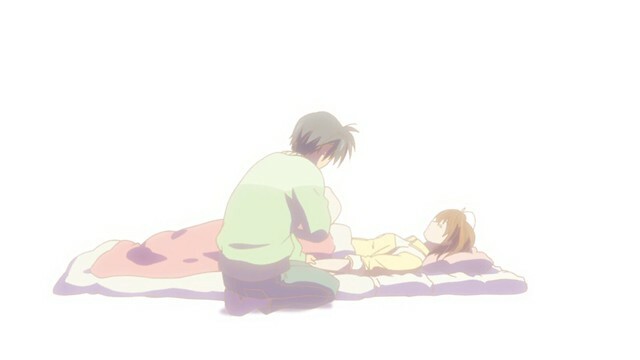 When her illness worsens, Ushio requests one final trip from Tomoya, who reluctantly agrees in spite of Ushio’s condition. As they set off, a snowfall sets in. Ushio collapses and dies soon after. 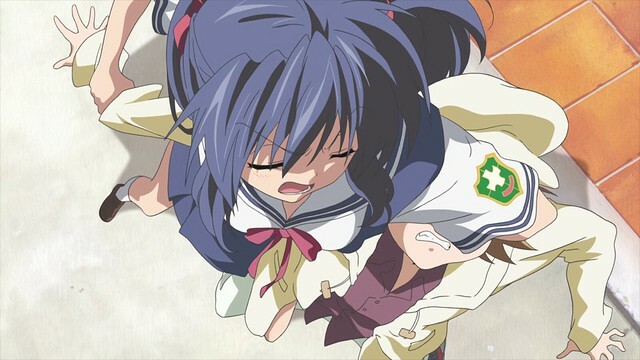 Consumed with agony and grief, Tomoya clings to Ushio and succumbs to death shortly after. 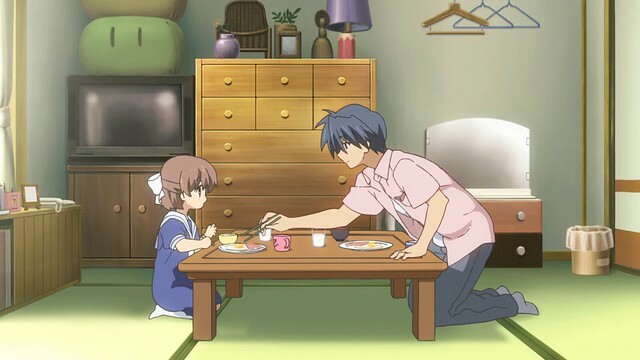 Ushio’s story in ~After Story~ remains an iconic centrepiece that is integral to the themes and messages of CLANNAD; despite only spanning five episodes, numerous life lessons are elegantly fit into the narrative, and each of these lessons hold weight in real life. With its exceptionally strong and moving story, Ushio’s arc represents the culmination of every discovery, triumph and setback in CLANNAD. 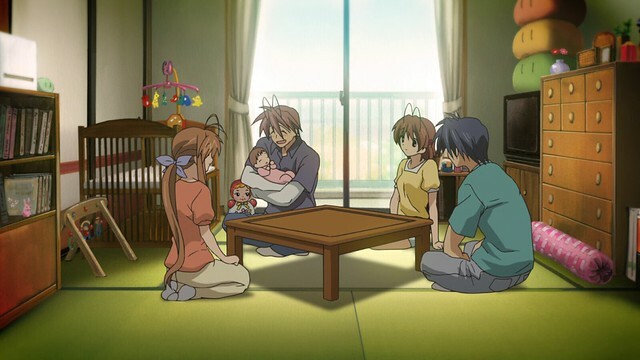 Notions of family have always been at the heart of CLANNAD, and in the beginning, the sharp contrasts between Tomoya and Nagisa’s families served to set the stage for what Tomoya comes to value in his family. Through the warmth and support Tomoya sees in Nagisa’s family, a part of Tomoya falls in love with Nagisa because she comes to embody the precise sort of person who would be able to pass this sense of family along to the next generation. However, when she dies, the concepts of family that Nagisa came to represent would die with her. 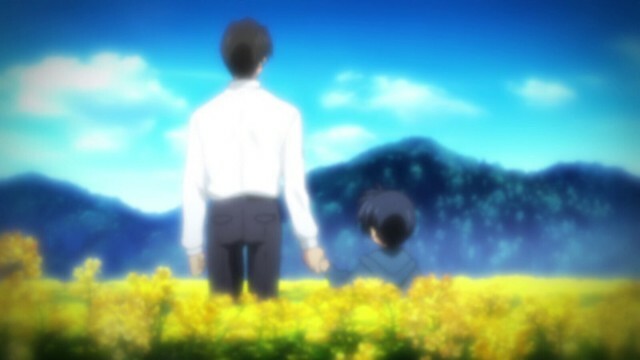 However, these concepts continued to endure in Ushio, and Tomoya’s subconscious decision to travel into the countryside, mirroring what his father had done for him many years previously, shows that Tomoya resembles his father in many ways. Tomoya himself comes to realise this after speaking with his grandmother; from her recollections, Tomoya’s neglect of Ushio for the past five year is more despicable than his own father, who, despite his numerous faults, always strove to put Tomoya first. This revelation, and the fact that Ushio is a very visceral, tangible representation of his own past, forces Tomoya to open his eyes. Despite his past actions, Tomoya accepts responsibility for his actions and owns his mistakes, resolving to turn over a new leaf. 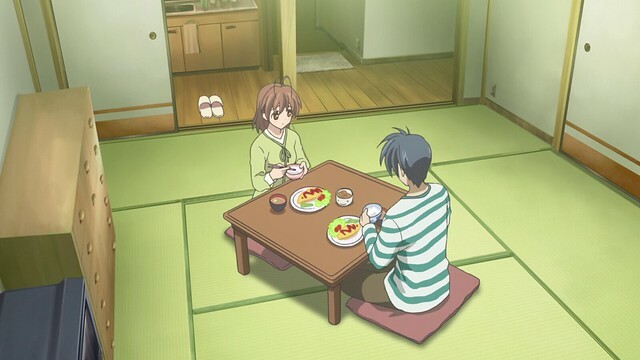 Tomoya’s change of heart here is a touching moment: by asking Ushio to come live with him and forgive his mistakes, and Ushio accepting Tomoya as her father openly, ~After Story~ suggests that it is never too late to redress past mistakes and make good on the future. These revelations, however, can take some manoeuvring to reach. In ~After Story~, a Tomoya’s intrinsic kindness, in conjunction with a bit of fate, allows him to enter the future a far better man and father. In addition to notions of family, CLANNAD also explores the concept of cycles, of how traits slowly move through generations and how history can repeat itself if one is blind to its consequences. 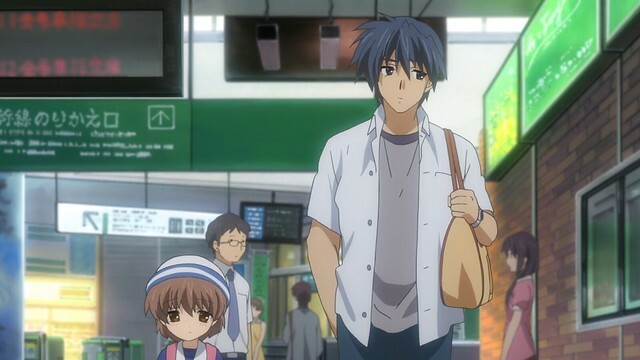 Throughout CLANNAD, audiences have the impression of Tomoya’s father as an irresponsible alcoholic whose callousness results in Tomoya’s shoulder injury and loss of a new career opportunity. 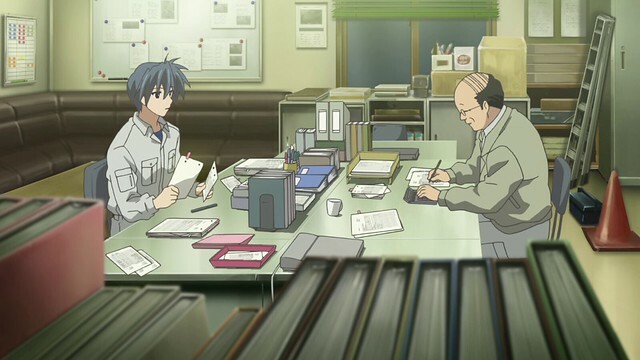 However, when it is shown that his father also struggled to make ends meet while simultaneously looking after Tomoya, the audience’s image of him change drastically; Tomoya’s father can now be seen as dealing with very difficult circumstances that led him to low points, and despite Tomoya’s determination to escape this, he is initially forced along the same path. To further accentuate the likeness, Atsuko is suggested as being quite similar to Nagisa in both manner and appearance, also dying early. Because Tomoya had earlier been so consumed with a desire to escape his past, he failed to understand the circumstances that resulted in his own experiences. 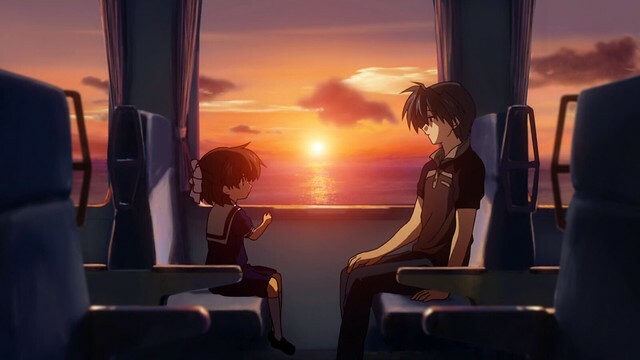 Through dramatic examples, Tomoya is shaken out of this; he resolves to make amends and look after Ushio, as well as expressing his gratitude for his father and informing him that at long last, his father’s responsibilities and efforts can come to an end. Being able to see and understand his past more clearly enables Tomoya to own his actions, and so, it is quite fitting that Ushio is named after the tides, which endlessly come and go along the coast, ebbing and flowing each and everyday regardless of the weather or whatever challenges the inhabitants of the planet endure. Because Tomoya ultimately sees the errors of his own ways, he is able to finally come to terms with the relationship he shared with his father. Grateful for his father’s support despite the great cost his father paid to keep Tomoya happy, he is finally able to put these feelings into words, and with his father’s job finally done, he is able to move back home. By facing his past as a man, and ultimately making peace with it, the curse that haunts Tomoya is lifted: Tomoya is able to step into the future at last, whereas before, he would have been weighted back by his resentment of the past, and thus, never would have been able to properly embrace the future. The gap between the Tomoya here and the Tomoya who encouraged a shy Nagisa to follow her dreams is apparent: Tomoya’s happiness is more genuine than it has ever been, and with this new outlook on life, Tomoya is the kind, gentle individual towards everyone as Nagisa had originally seen him to be. Whereas Tomoya’s actions for the past five years might be seen as being disrespectful towards Nagisa’s memory, the changes in him after meeting Ushio and his grandmother show that Tomoya has begun to move on, while being mindful of the past. Looking after Ushio to the best of his ability and making amends clearly show Tomoya as living in respect of Nagisa’s memory, and the days that follow are the happiest Tomoya’s experienced since meeting Nagisa. From picking up Ushio from school to spending time with the Furukawas, Tomoya’s days are filled with discovery and normalcy. While most stories would be content to end here, ~After Story~ seems to suggest that everything has a cost: the same disease that claimed Nagisa’s life now comes knocking on Ushio’s door. 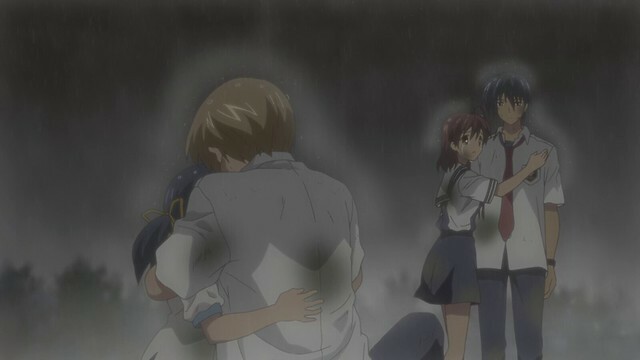 Tomoya’s last act, to fulfil Ushio’s wish, shows just how far he’s matured, and when both succumb to death, audiences are left to wonder what kind of universe would so cruel as to wrest away all happiness from a family that has endured and given viewers much to root for. When things resume five years later, the toll of despair and his efforts to forget have had a very visible impact on Tomoya’s life. His scruffy appearance and unkempt apartment reflect on this, and time relentlessly passes. In the five years since, the town has undergone dramatic changes, with new constructions altering the cityscape. Because Tomoya’s become trapped in his past, he fails to notice these changes until one summer’s day, when Sanae shows up out of the blue and visits him. 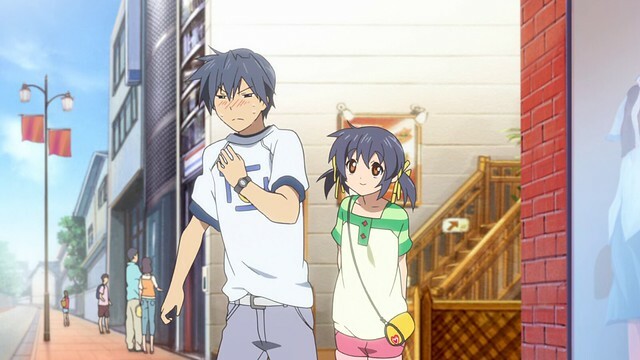 Tomoya reluctantly decides to accompany her into town. With a bit of convincing, Tomoya agrees to travel with Sanae and Akio. A lot can change in five years – five years ago, I was set to enter graduate school and had not yet been invited to work on the Giant Walkthrough Brain, nor had I suffered heartbreak of the sort I’d not experienced up until that point. Since then, I finished my graduate degree, became a second-degree black belt and began my career. Despite the extraordinary events within CLANNAD, the series’ focus in dealing with everyday life is first and foremost, and as such, I will be reminiscing quite a bit in this post, which has forty screenshots and accompanying figure captions. The choice to set Tomoya’s turnaround during the summer is deliberate; ~After Story~ had previously made extensive use of the seasons to convey very specific ideas. 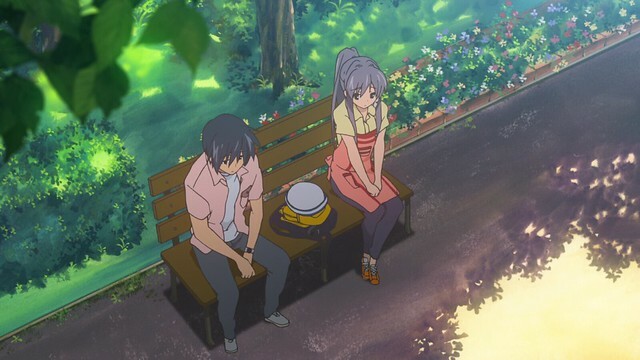 Summer is a time of hope, and of change: Tomoya proposed to Nagisa in the summer, decided with Nagisa on their child’s name in the summer, and so, audiences cannot help but feel a sense of foreshadowing here. In the long, hot days of summer under blue skies that beacon for adventure, something is going to happen now that Tomoya’s decided to take a step into the world he turned his back on years previously. It turns out that Akio and Sanae punk’d Tomoya, but this choice is a calculated, well-chosen one on their part. Tomoya meets Ushio for the first time, and at the age of five, Ushio is polite, perceptive and a spitting image of her mother. 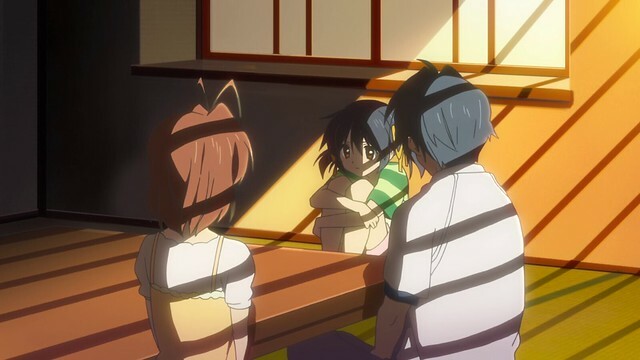 In the presence of her father, Ushio is quite shy, having not met with him: Tomoya was reminded of Nagisa and distanced himself, leaving the Furukawas to raise Ushio. 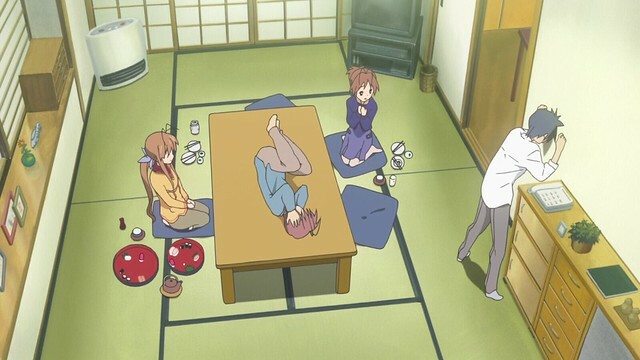 The blunt, despairing Tomoya has no idea how to connect with Ushio, but the Furukawas have raised Ushio well, and she defaults to her own activities while Tomoya struggles to work out what to do now. 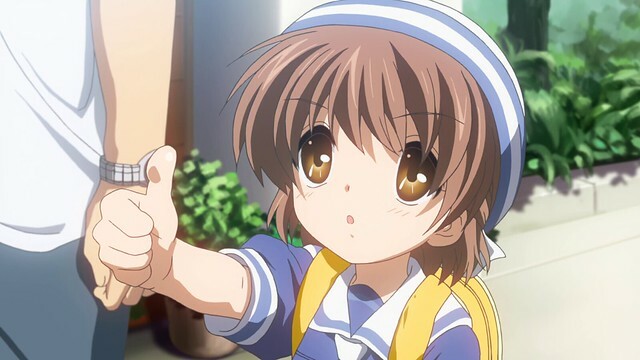 When Ushio accidentally totals her turtle toy, Tomoya fixes it for her. Having neglected Ushio for five years to dampen the pain of having lost Nagisa, Tomoya’s decision can be seen as being selfish. However, it is important to note that these can be seen as extenuating circumstances, and Tomoya’s lack of a support network would have only made things more difficult for him. Parents would doubtlessly see Tomoya as irresponsible in the absence of a greater context, and this is ~After Story~‘s subtle way of reminding viewers not to be so hasty in dealing out judgement, especially when stories behind others are not fully known. From a narrative perspective, Tomoya’s actions create a situation that he must redeem himself from. The changes in Tomoya are apparent, and he is content to leave Ushio to her own devices. 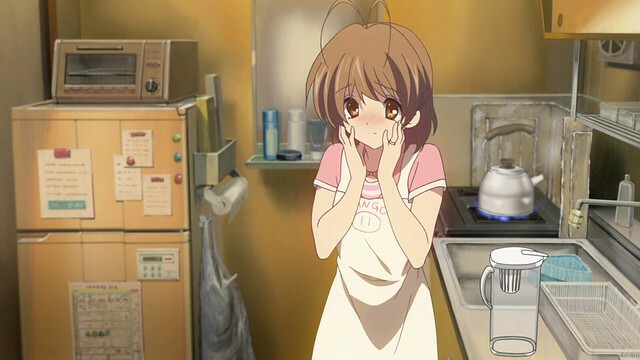 Being raised in the Furukawa household, Ushio is very independent, and when Tomoya cooks lunch for the two, Ushio decides to add seasoning of sorts to the rice, being unaccustomed to the way Tomoya cooks. After realising that he probably should make good on his promise to Sanae and Akio, Tomoya decides to take Ushio on a trip into the countryside. Sullen and ill-tempered, Tomoya inadvertently frightens Ushio when he yells at a mother and her child for being excessively noisy on the train. 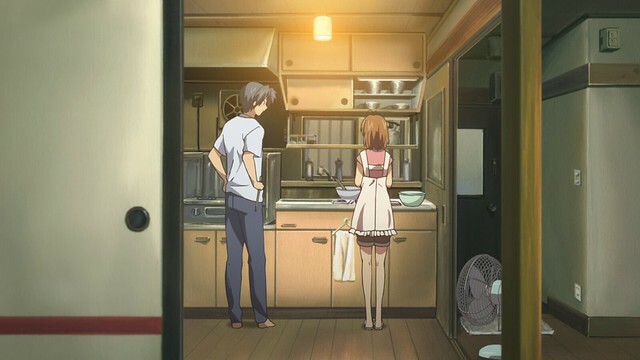 With five years of unfamiliarity between them, Tomoya finds it very difficult to connect with his daughter, while Ushio initially is hesitant to open up to Tomoya as her father. A part of parenthood is being close to one’s children and being there for them, so despite being related by blood, father and daughter feel exceedingly distant at the start of their journey. The choice of an outing to the countryside thus acts as a visual metaphor for the journey the two undertake within. 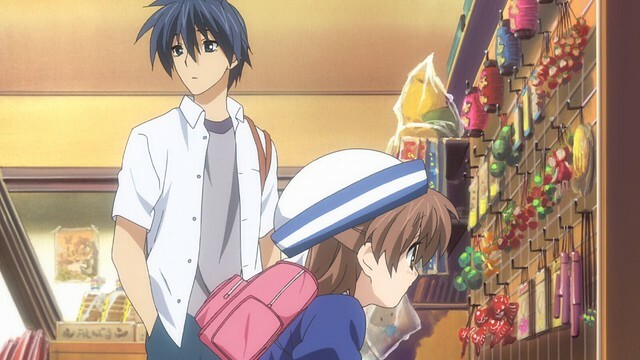 While browsing around a store, Ushio asks for a toy robot from Tomoya, who buys it for her despite his remarks that it’s an unusual choice of toy. While Tomoya’s world has since reverted to the dull monochromes it was prior to meeting Nagisa, ~After Story~ presents the world as being exceedingly colourful when Ushio is introduced. 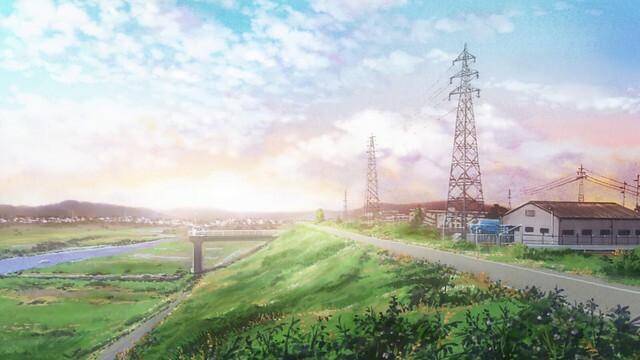 The disconnect between Tomoya’s mood and the colours of the world are a first in CLANNAD: it is meant to show that this arc is less about Tomoya, and more about Ushio, whose universe is one of exploration, taking things in stride and discoveries. 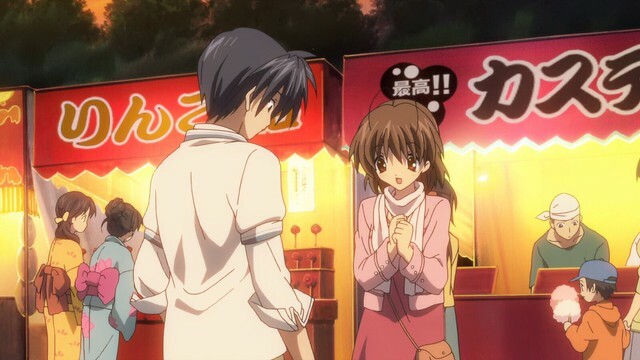 Having helped so many people in CLANNAD, Tomoya’s now receiving help from Ushio in a manner of speaking, and the colours of the world seem to mirror her thoughts and feelings. Thus, when the two step off a train into the vast blue skies and expanse of fields on a hot summer’s day, the highly-saturated landscapes indicate new possibility. There is a certain mystique and allure about a far distant countryside by summer; the environment invites exploration. It is under the long days of summer where discoveries are made: when there are many hours of daylight, there is opportunity to remain outdoors longer, and as such, the hottest days of year are also my favourite. 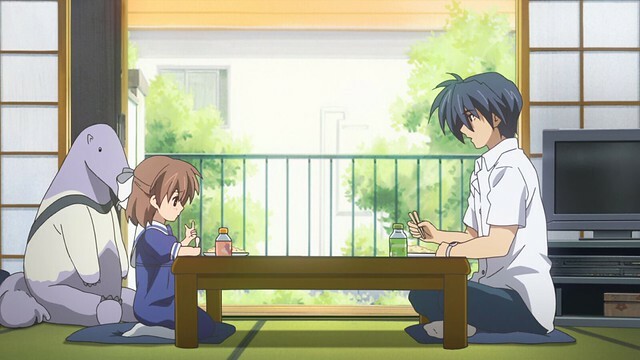 Under such conditions, the world gives Ushio and Tomoya plenty of chances to catch up and learn about one another. By my admission, I would love to meet a girl in a sundress and wide-brim hat while waiting for a train in a remote station on a beautiful summer morning. There is a tranquility in the countryside by summer, although as I’ve remarked previously, a lack of train stations in my area. The closest I would have is driving along highways cutting through endless canola fields, and upon closer inspection, that isn’t a bad substitute: summers here at home are beautiful, and there’s a charm about the southern province with its blue skies, foothills and canola fields. Upon arriving at a field of yellow flowers, Tomoya and Ushio genuinely feel like father and daughter for the first time; to give Ushio a better look, he gives her a piggyback ride. She later runs off into the flowers while Tomoya rests under the shade of a tree, seemingly blissful and content for the first time. Afternoon soon gives way to evening, and Tomoya has a sudden flashback. Despite the field being somewhere seemingly new, shadows of a memory manifest in his mind: he realises he’s been here before. While the area’s apparent familiarity lingers in Tomoya’s mind, Ushio’s lost her robot. 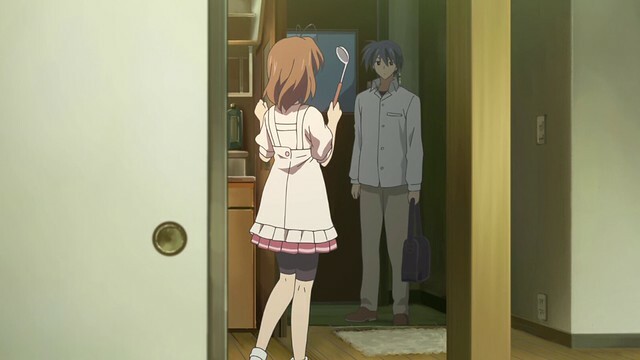 Tomoya gives her permission to keep looking for it, and sets off to confirm his suspicions. Tomoya’s trip to the area is likely subconscious decision, and the fact that his father once took him here is an indicator that history is repeating itself. When I was much younger, my father was fond of driving my brother and I around the country roads surrounding the city after eating lunch at a restaurant. We were always thrilled to go on these excursions, and they were cost-effective ways of relaxing. Being able to relax takes many forms, he told me, and it is not necessary to break the bank in order to have a good time. 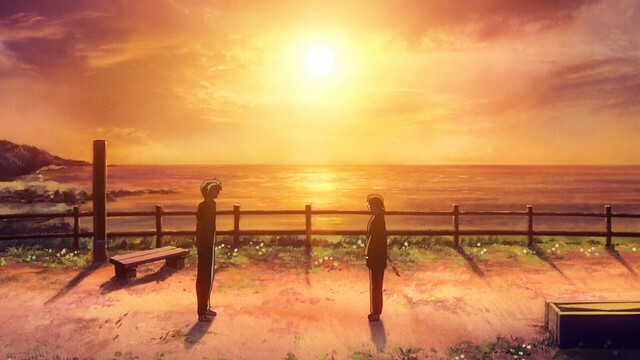 After climbing onto a bluff overlooking the coast, Tomoya runs into his grandmother. Under the oranges and golds of a sunset, the colours of a day’s end, Tomoya hears from his grandmother the journey his father had taken in raising him. Standing in sharp contrast with Tomoya, who’d turned his back on Ushio after Nagisa’s death, Tomoya’s father decided to push on ahead and raise Tomoya on his own after his wife’s death. Despite his own shortcomings and failures, that Tomoya’s father stuck to his promise as best as he could is honourable – Tomoya realises that for all of his own promises to raise Ushio, he had completely and totally failed Ushio by leaving her to the Furukawas. What makes Tomoya an honourable man, then, is the fact that he is able to see his mistakes and own them. The worst kind of person is blind to their own failures, defending themselves even when there is no position to defend. It is true that Tomoya has made poor choices, and it is true that his neglect for Ushio is appalling. However, he accepts that he has made a mistake and also understands that it is not too late to begin setting things right. Learning about his father’s history helps Tomoya put things in perspective, and realising this, Tomoya is determined to make amends for Ushio’s sake. 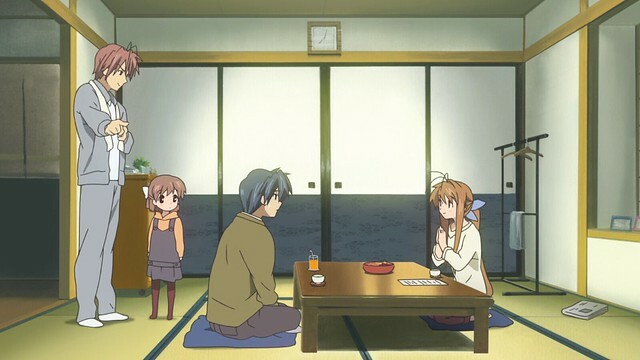 Having inherited her mother’s perceptiveness, Ushio accepts Tomoya’s apology and his invitation to be a proper family. This turning point is set deep into the evening, as the reds become more pronounced. Signifying the end of a day, of a time when things close off, the emotional buildup comes to a gentle but significant close. 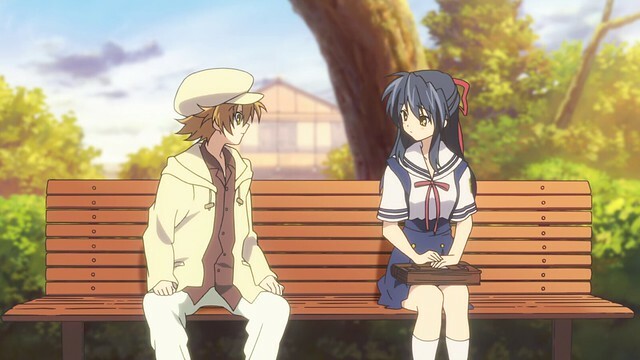 Watching Tomoya come to terms with his past, and watching Ushio connect with her father for the first time in unison was a very moving moment because shows that people can indeed look past their prior experiences and be willing to accept their circumstances. 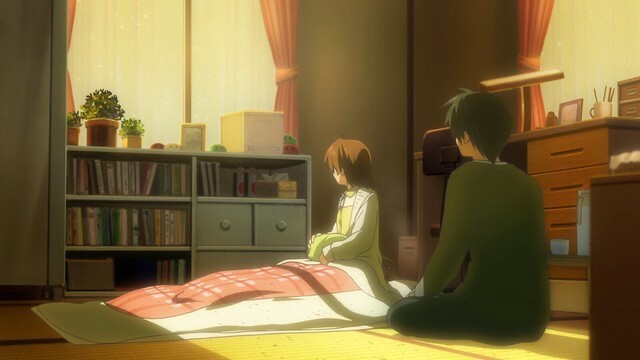 CLANNAD is sublime because of how every element comes together to convey a very specific, powerful message: from the dialogue between Tomoya and Ushio, to the choice of incidental music, the deliberate use of lighting and time of day, all of these components come together to completely immerse audiences in a moment. I do not feel that any other anime I’ve watched comes close: CLANNAD stands alone even among the series I’ve counted as a masterpiece, and such moments are more effective than my own writings in conveying what about CLANNAD makes it so enjoyable to watch. After opening up to Ushio, Tomoya finally speaks about Nagisa for the first time in five years. He accepts her death, recounts her as beautiful, frail but above all, kind. Understandably, speaking about Nagisa brings tears to Tomoya’s eyes, but by talking it out to Ushio, he releases the stress of five years. 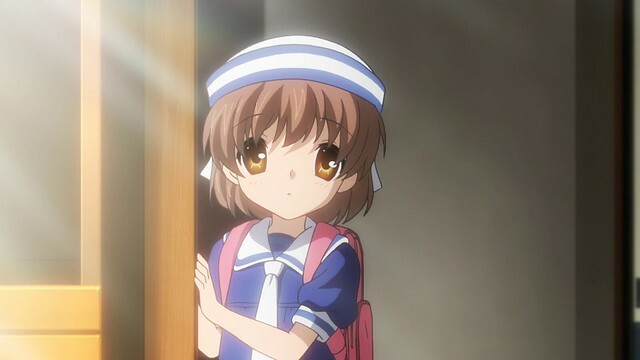 Ushio has inherited an interesting thought about tears; being quite strong-willed like Nagisa, the Furukawas told her that there are two places where it’s okay to cry. I believe most translations give the first as the toilet, but I’ve always known facilities as bathrooms, hence my own take on the quote. 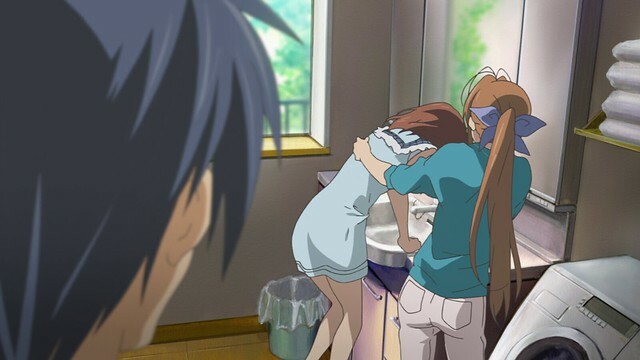 The second location is in a parent’s arms, and so, by crying in Tomoya’s presence, audiences are left with no doubt that Ushio accepts Tomoya. 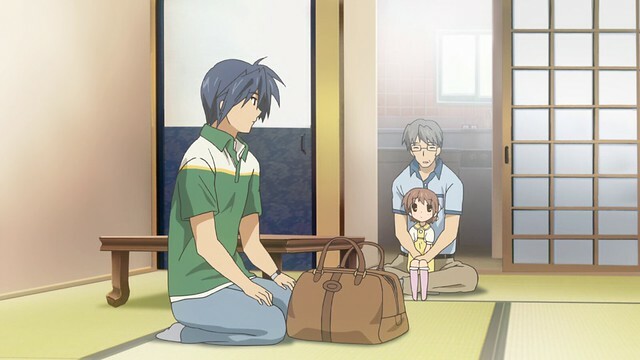 Upon returning from their trip, Tomoya visits the Furukawas and prepares to move Ushio’s belongings over to his place. The night before, Sanae finally cries for Nagisa, having stayed her emotions after all this time so she could be strong for Ushio. With one journey over, another begins – despite their rocky start, Tomoya and Ushio bond very quickly, and in no time at all, the two feel like a proper family. Preparing to head off after thanking the Furuakawas for everything they’ve done, Tomoya and Ushio set off under a beautiful summer day. The vivid saturation in the skies, despite Tomoya and Ushio’s return home, show that another adventure is just around the corner; on a long day such as this, the possibilities are as endless as the sky itself. I recall the weather of summers past where the days were precisely like this – whether it be the weight of an MCAT or a flood-stricken city, summers in Alberta are persistently pleasant for the most part, reminding residents that the world will go on regardless of the troubles one might have, and that it’s okay to live in the moment. Traces of the Furukawa’s upbringing are visible in Ushio, who boldly gives a thumbs-up to Akio after he asks if she’ll be alright with her new life. Ushio is voiced by Satomi Kōrogi – Kōrogi delivers Ushio’s lines in a very realistic manner, capturing the vocabulary and manner of an inquisitive five-year-old. Ushio’s sentences are short and succinct; she answers questions with brevity. When she’s enjoying a moment and laughing, Kōrogi manages to sound precisely as a five-year-old would, as well, attesting to her talent. I’m actually not too familiar with Kōrogi’s other works, and the only other role I’ve seen is her performance as Please Teacher!‘s Maho Kazami. Mizuho’s younger sister, Maho is absolutely opposed to Kei’s marriage to Mizhuho and is a brat, but she’s also mischievous, resembling GochiUsa‘s Maya Jouga in appearance and manner. 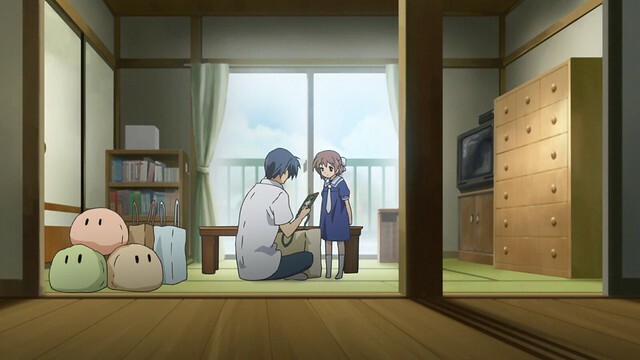 After moving some of Ushio’s belongings from the Furukawas’ place, Tomoya shows Ushio a picture of Nagisa. The return of the Dango plushies gives Tomoya’s apartment a sense of home; this is a feeling we’ve not seen since Tomoya and Nagisa had lived here together. While Tomoya goes to work, Ushio demonstrates her independence: she explores the empty house on her own and then takes to her own activities. Despite being quite accustomed to solitude, Ushio is very well-behaved. Tomoya catches up with Kouko and Fuuko one day: Fuuko’s finally been discharged from the hospital and despite the considerable amount of time that has passed since her last appearance, Fuuko looks and acts very much as she did previously. Tomoya immediately takes to trolling her: evidently, being older and having experienced the difficulties that he did has not completely diminished Tomoya’s more playful side. 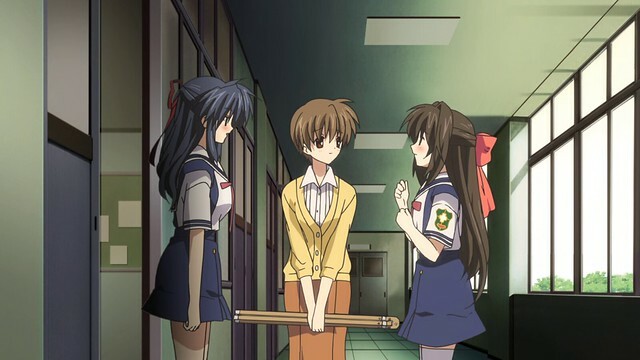 Upon seeing Ushio, Fuuko immediately desires to keep her, and while both Kouko and Tomoya are against this, Tomoya does allow Fuuko to play with Ushio; the two get along very well. Having come to terms with his father, Tomoya takes Ushio to visit him. They clean up his place, and Tomoya helps him pack, saying that it’s now okay to step back. Seeing his daughter, Tomoya’s father consents, and the two part ways on amicable terms. Having come to appreciate and understand his father’s decisions, Tomoya has now properly faced his past and accepts it. 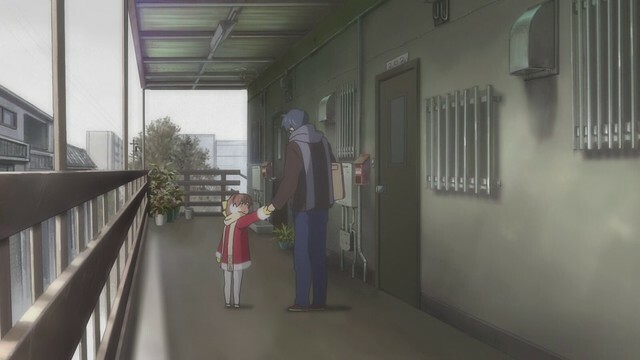 While Ushio may not have had an active role in accomplishing this, she reminded Tomoya of his own past, and drove him towards being a better man. With his past addressed in full, Tomoya is now able to move into the future without anything holding him back: his desire to make things better for Ushio now stems from a genuine love for her, rather than his previous goal of putting as much distance between him and the past. In this moment, a light orb appears, but only Ushio notices it rise into the skies. Despite being a benign moment, watching Tomoya and his father separate for the present was an emotional moment. I note that originally, I intended to write about this particular arc in February: this post would have coincided with the ten year anniversary to the twentieth episode and ended with Ushio developing a fever, but looking at the ~After Story~‘s progression, it ended up being more prudent to extend this post and then fully cover things right up to the penultimate episode. Doing so also allowed me some breathing room to focus on the other drafts I had lined up. When Tomoya and Kyou meet for the first time in over five years, he’s surprised that she’s become an elementary teacher. 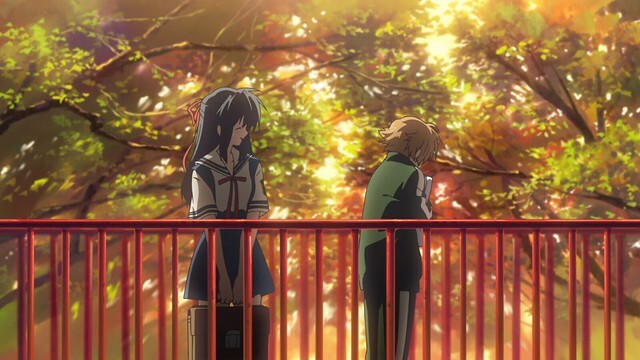 In spite of this, their old friendship remains as strong and familiar as ever: Tomoya reacts to Kyou’s introduction, and is immediately reminded of their time in the drama club. Tomoya remarks to Ushio that despite Kyou being kind and friendly as a teacher, she was once violent and put him through a great deal of trouble. Despite this, they were very much friends. Tomoya’s description of Kyou is not untrue, and it exemplifies Tomoya’s character to get the negatives out of the way first and then focus on the positives, speaking volumes of his character. Kyou remarks that after Nagisa’s death, Youhei and the others wondered if they should get in touch with him to offer support, but ended up deciding that it was better for Tomoya to work out his problems. This always struck me as being a little difficult to accept: during difficult times, support from peers is precisely what people might need, and one cannot help but wonder if Tomoya might’ve fared better were his friends there for him. 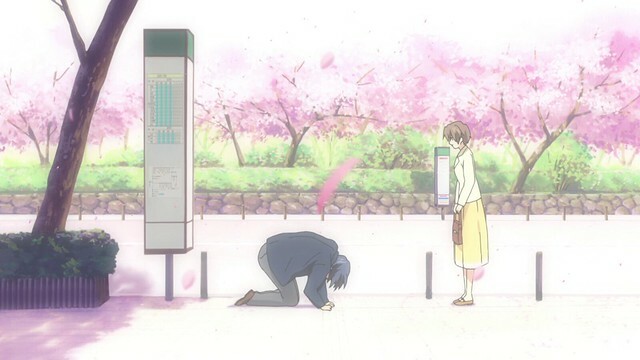 On the flip-side, Tomoya manages to overcome that particular stage of his life following his fateful decision to take Ushio on a trip; in being able to own his mistakes and then regroup, viewers come to rally behind Tomoya. 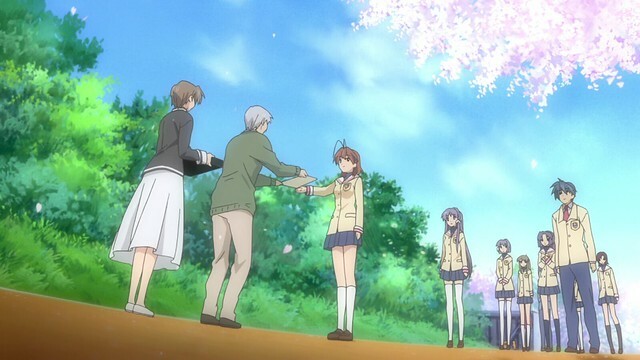 CLANNAD, and ~After Story~ in particular, deals with the ups and downs of life, of comings and goings. 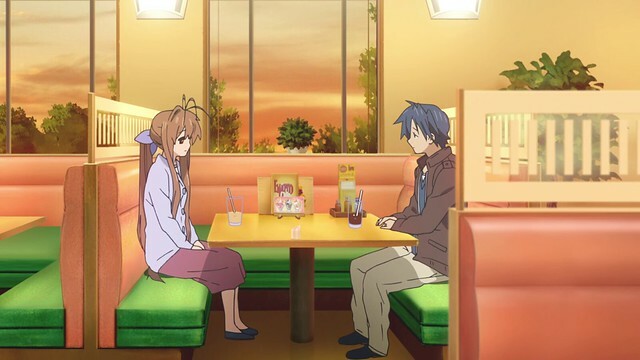 Moments of great tragedy are offset by the bliss of normalcy, and the anime presents happiness as being something to be at its most profound during the most ordinary of moments, whether it be sharing a meal together or picking up one’s children from school after work. The world that CLANNAD was first released in 2004 was a very different place: the internet, smartphones and social media were not ubiquitous, but even then, advancing technology and the increasing expectations people had meant that the more subtle things in life were being forgotten and taken for granted. By deliberately focussing on these messages, CLANNAD can be seen has having an ancillary theme – genuine happiness is not found in material possessions, personal success or social status, but through appreciation of the simpler things in life. Tomoya is able to create a profound memory and bond with Ushio by taking a trip into the countryside, and he is at his happiest doing ordinary, everyday things: this is the sort of stability that families need to mature. There is not one way to live life, and while some of my peers may disagree with me, I feel that the happiness one might gain by backpacking in Thailand and Vietnam for a year is not so different than the happiness found from taking an afternoon stroll in a hill overlooking the city. 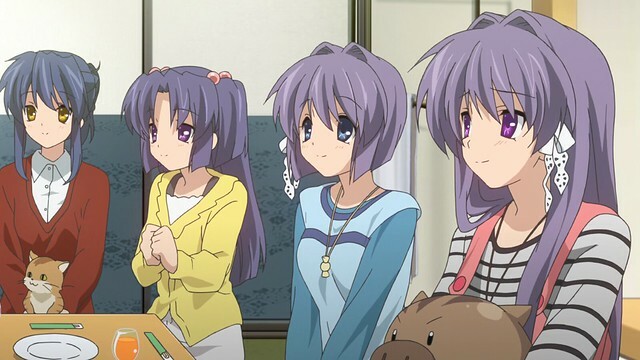 Kyou remarks that Ushio is brimming with energy and optimism, being the splitting image of her mother. When the elementary school’s sports festival arrives, Tomoya is initially reluctant to attend until Ushio convinces him to do so. He subsequently displays his old determination, exercising during his lunch breaks at work so that he’s able to keep up with her. 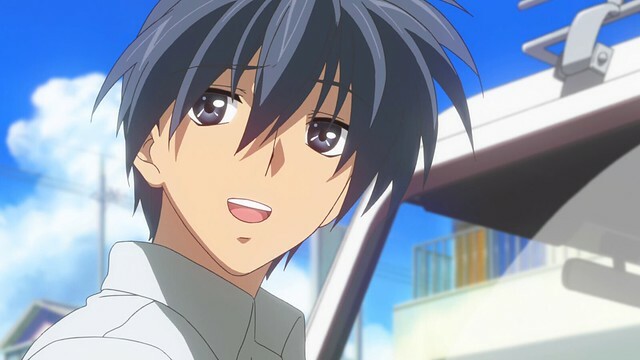 After reuniting with Ushio, Tomoya’s old personality begins manifesting again, indicating that Tomoya’s begun living life anew. A new status quo is reached, and it would appear that Tomoya has once again managed to build happiness for himself and Ushio. 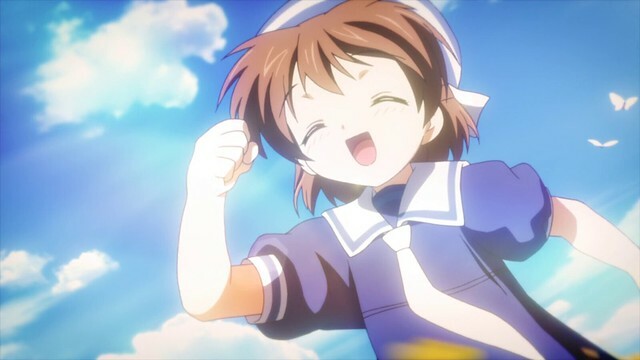 Seeing the energy and enthusiasm in youth, such as when Ushio expresses that she’ll be doing her best during the sports festival, is always a breath of fresh air for me. A few weeks ago, I volunteered as a judge for a science fair being held at the top private school in the city: one of the instructors there was my old biology instructor back when I was in high school, and I attribute my successes in university a result of his inspirational teaching approach. This year, I judged some of the best projects I’ve seen yet. I assessed several projects as being more than qualified for the city-wide science fair in April. I am always happy to see what the best minds are working on, and their youthful optimism. The world of late is as pessimistic and cynical as I’ve ever seen it, and it is for this reason that I always strive to surround myself with positivity. Ushio embodies everything about children that I get along with: I have no trouble getting along with children, and during my days as an undergrad, I worked with small children in a Chinese school. They seem to gravitate towards me for help and support. With this being said, I am not qualified to be a parent in any way. I’ve heard that most parents feel this way about their first child: beyond some cursory materials to help them along, it’s mostly touch-and-go. While visiting a new hospital in the far southern quadrant of my city, I remarked that the best hospital is a near-empty one, as it would imply that the citizens are healthy and well. 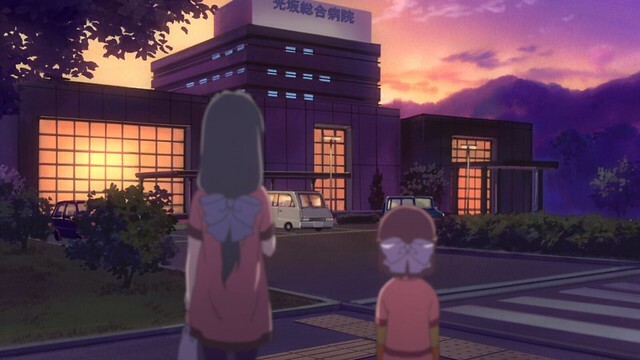 One evening, Ushio is taking a walk on her own and finds herself near the hospital, being unable to answer Fuuko when the latter asks why she’s in the area. The supernatural aspects of CLANNAD are subtle, and it is implied that there’s a curse that manifested after Akio begged for Nagisa’s life long ago. 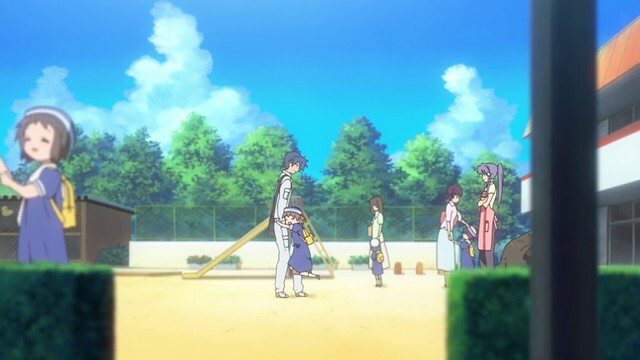 Shortly after, Ushio develops a fever and is unable to participate in the sports festival. 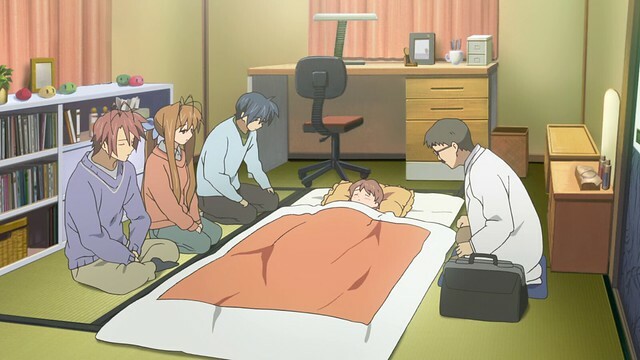 Tomoya remains by her side as doctors struggle to find a cause for Ushio’s illness. Themes that lessons of the past can haunt the present carry over into Ushio’s illness: it turns out Ushio’s inherited her mother’s enigmatic condition, and despite having been in excellent health, this illness has returned with a frightening finality. 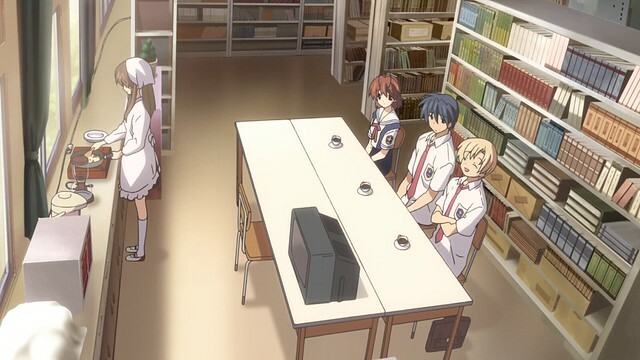 The normalcy that Tomoya had experienced is slipping away again, creating a lingering sense of doubt in the viewers. To have concluded the discussion here as I originally intended to would have created an unnatural break; I decided to push this post back and include the penultimate episode so that Ushio’s arc was covered in its entirety. As Ushio’s condition worsens, he decides to resign from his job to look after her full-time, signifying his dedication and love for Ushio. 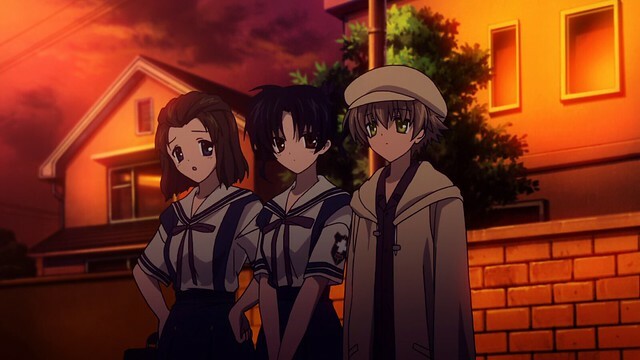 Again, Tomoya is seen as taking an action that might seem brash or ill-conceived: Akio and Sanae have already offered to look after Ushio wherever Tomoya is busy, and a lack of income invariably means being unable to afford the healthcare and materials needed to lessen the severity of Ushio’s illness. 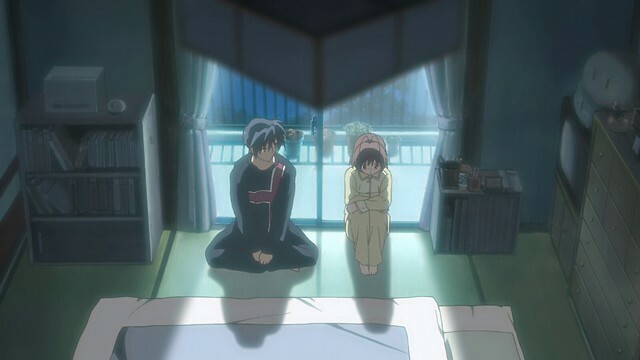 However, CLANNAD manages to frame this as being honourable – while quite irrational as a decision in reality, fiction allows Tomoya’s decision to be an honourable one in that he is willing to give his all for Ushio. My remarks about Tomoya’s actions in both a fictional and real context are intended to show that some narrative decisions that seem poor in real life can be relaxed in fiction, as they serve to strengthen a message. Not everything needs to be realistic, and realism can sometimes be detrimental to a work’s ability to convey its theme. 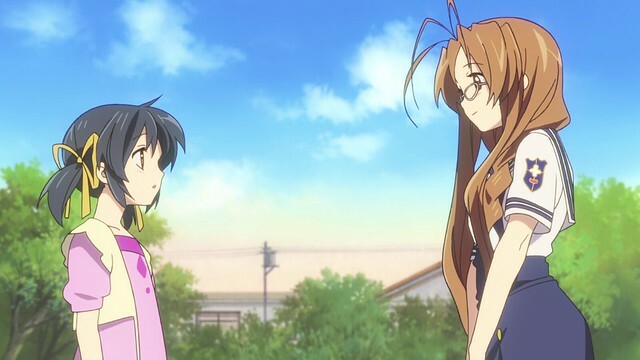 Here, Tomoya and Akio share a conversation: Tomoya declines Akio’s assistance and wonders if the changes in the city might be affecting Ushio strongly. It certainly does feel that, as more developments appear, the city extracts a toll from its citizens to expand, and in CLANNAD, both Nagisa and Ushio are made to pay this toll. The months pass, and soon, the cold of winter returns. 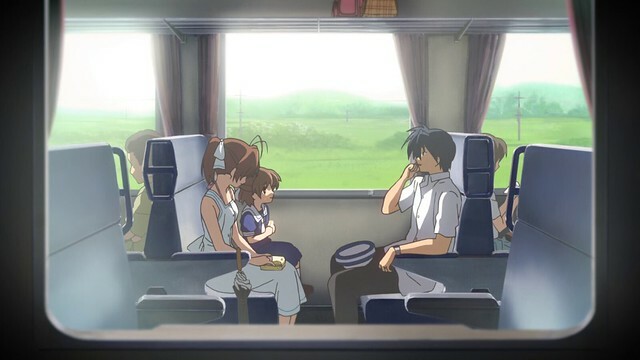 With Ushio showing no indication of recovering, Tomoya decides to fulfill her wish of going on another trip with him. Under melancholy, grey skies, the two step out and prepare to head for the train station. 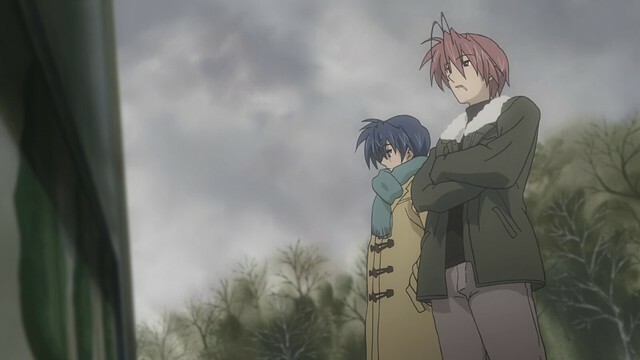 The weather foreshadows what is to happen, and when snow begins falling, viewers brace for the inevitable – CLANNAD had long excelled at using weather and time of day as visual indicators for emotions and story progression, so the grim mood at the penultimate episode’s end is felt long before viewers see anything occur. 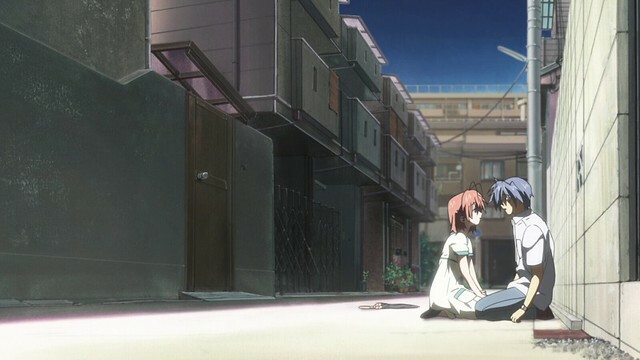 With her remaining energy, Ushio tells Tomoya that she loves her, before dying. Consumed with grief and despair he’d not felt since Nagisa’s death, Tomoya dies shortly after, as well. However, this is not the end: the Imaginary World that had made its appearance is shown, and it turns out the brown-haired girl here is Ushio. It turns out that in death, Ushio and Tomoya’s consciousnesses were transported into another world: Ushio is able to create a pocket universe with the aim of sparing her father and mother from a terrible fate. The phenomenon that occurs subsequently is within the realm of quantum cosmology, which contemporary science is constantly developing, and where science fiction may apply fantastical constructs, like the Infinity Gems, to conceptualise. While it may seem cruel to conclude an ~After Story~ post with Tomoya and Ushio’s deaths, it is no secret that Tomoya and Ushio are about as dead as the vanished people in Infinity War. 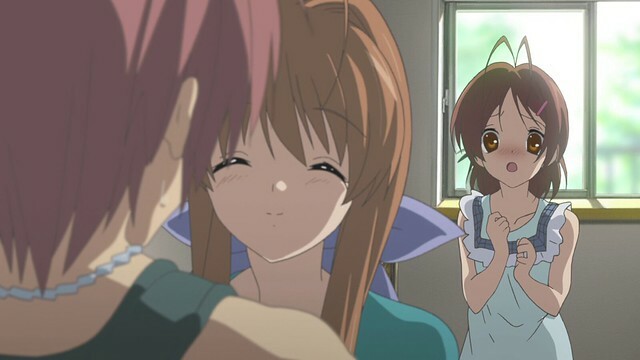 I have a one final post for the finale of ~After Story~, where I will explore why the ending viewers got was an ending they deserve, why criticisms of the ending are misguided, and how this comes together to make CLANNAD the strongest anime in the past decade. It is also a bit humbling to know that this Ten Year Anniversary Series for CLANNAD is very nearly at an end: I started things more than a year ago, and it’s been surprising as to how quickly time flies. I hope that readers will have found these revisitations to be relevant and illuminating, both for CLANNAD, as well as providing a bit of insight into why the series was so moving and meaningful for me. At its core, family is more than just people related by blood: it is a bond stronger than the likes of any other, and the willingness to support and aid one another in difficult times as much as it is about enjoying the good times together. The dramatic extremes of CLANNAD, and especially of ~After Story~, are particularly vivid for this reason. 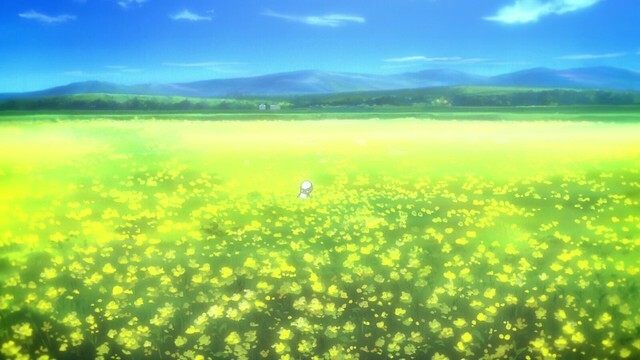 From the highest of highs to the lowest of lows, life is a journey: happiness and despair cannot exist in the absence of one another, and this is why comedy and melancholy figure so prominently in CLANNAD, showing both sides of the coin. Extreme examples are sometimes necessary for a story to have impact, and for it, ~After Story~ is remarkably visceral. 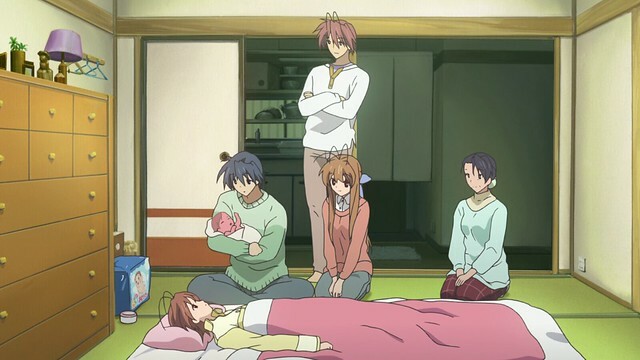 Criticisms that CLANNAD and ~After Story~ are melodramatic, then, are ill-founded; the contrasts serve a very specific purpose in painting an image of what family means, as well as the ups and downs of life. Like the coming and going of the tides that Ushio is named after, life is about cycles, of comings and goings. ~After Story~‘s penultimate episode left viewers in a great shock, and I imagine that watching someone losing so much despite their efforts distracted and dissuaded many from CLANNAD‘s core themes. However, the reality is that a kind heart and benevolent attitude will rarely go unrewarded. 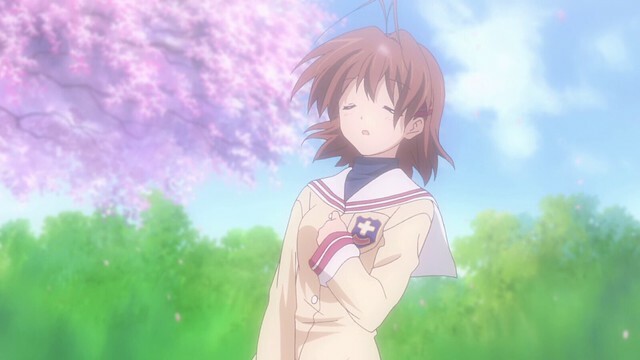 CLANNAD was written with a myriad of life lessons in mind, and in the decade that has elapsed since its airing, it should be evident that ~After Story~ has lost none of its relevance, emotional impact and sincerity. ~After Story~ is a masterpiece in my books precisely because of its ability to capture such a broad spectrum of themes so effectively. Despite its breadth, ~After Story~ also conveys each concept, from family to forgiveness, in sufficient depth such that viewers can relate to it. For me, ~After Story~ reinforced the way I came to look at family and opened my eyes to how accepting responsibility can manifest, allowing me to tangibly conceptualise what family is defined as. While the definition of a masterpiece invariably differs between people, for me, a series is a masterpiece if its execution is sufficiently powerful as to alter my world views in some way. Because I am the sort of individual who can only be convinced with well-reasoned arguments and evidence, series that can change the way I think about the world have done something exceptionally well in presenting its ideas to me, attesting to the strength of its execution. ~After Story~ ended up having a noticeable impact on my world-views in this manner, and so, is something I would count a masterpiece. Akio refuses to discuss with Tomoya the latter’s intent to marry Nagisa; he stipulates that Tomoya must hit a baseball in a manner that Akio finds satisfactory before he will even consider speaking with Tomoya, and so, Tomoya determinedly practises his hits. Nailing one after lengthy practise, he implores for Akio to accept his marriage to Nagisa. 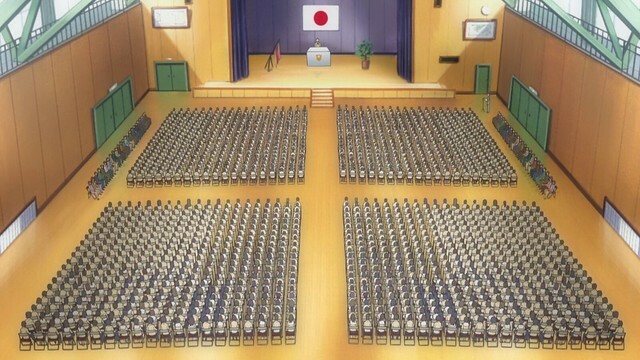 Nagisa graduates shortly after; in the company of her friends, she receives her diploma and marries Tomoya, taking a job as a waitress at a local family restaurant. Tomoya and Akio visit Nagisa while she is working, and fend off some customers accosting her. 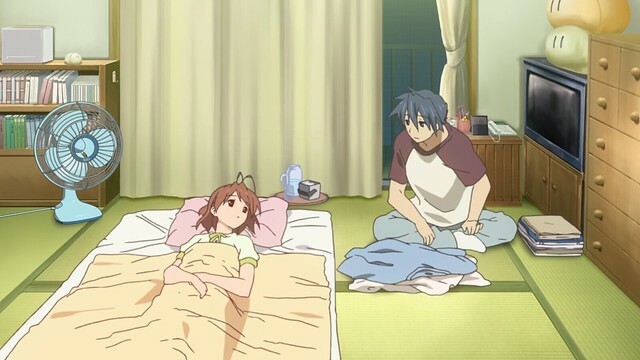 Later, Nagisa learns that she is pregnant and develops morning sickness, requiring that she take bedrest. Their friends visit, and Sanae hires a midwife to help deliver their child when Nagisa expresses a wish to give birth at home. Because of Nagisa’s frailty, there’s a risk that she may not make it, but both Tomoya and Nagisa decide to go ahead with the birth. Tomoya learns from Akio that after that one day where Nagisa lost consciousness while waiting in the snow for him and Sanae to return home, he carried her to a meadow and begged the gods to spare her. Akio recounts this story to reiterate the value of family and how he and Sanae will support Tomoya and Nagisa. Nagisa and Tomoya decide to name their child Ushio. 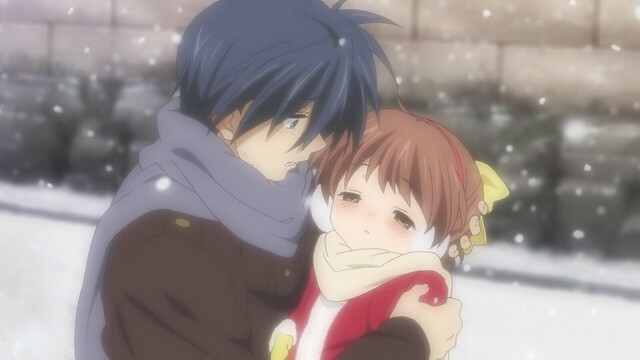 By winter, Nagisa goes into labour during a fierce blizzard; conditions preclude taking Nagisa to a hospital, and so, she gives birth to Ushio at home. The combined pressure on her body from childbirth and her illness results in her death, devastating Tomoya and ending his dream of raising Ushio with Nagisa. From the highest highs to the lowest low, this arc in ~After Story~ is a difficult one to watch. Having gone through so much, this couple reaches a point where they can make a new start, raising a child and pushing on into the future, but at the last second, this is cruelly taken from Tomoya, who is now made to endure new challenges. Weather and lighting, having long played a major role in earlier stories within CLANNAD, now come out in full force in ~After Story~. It is no surprise that the symbolism of the different seasons is utilised to its fullest effects to convey emotional tenour as Tomoya and Nagisa’s marriage occurs. 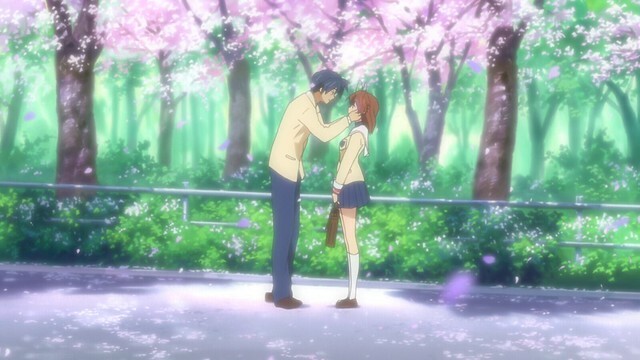 In spring, shortly after Nagisa graduate, she and Tomoya marry. Spring is a season characterised by new beginnings and renewal: vegetation and animal life begin returning into a warming world as days lengthen. 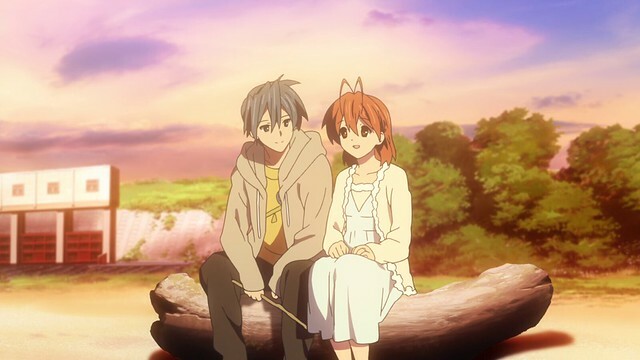 Having finally reached one milestone in her life, Nagisa is quite ready to walk a new road with Tomoya, and their marriage in the spring reinforces that something new has bloomed. This is a time of hope and optimism, to step into the future and make the most of things. Life is at its apex in the summer, when days are longest and the weather is hot. Lengthy days fill people with energy and vigour, instilling a sense of adventure. It is here that Nagisa announces that she is pregnant; a new child represents this adventure, as raising a child is a completely new journey for couples. Filled with spirit and vitality, the summer is a time of exploration and excitement, which is mirrored in the joy Tomoya and Nagisa experience when they begin preparing to welcome their child into the world. 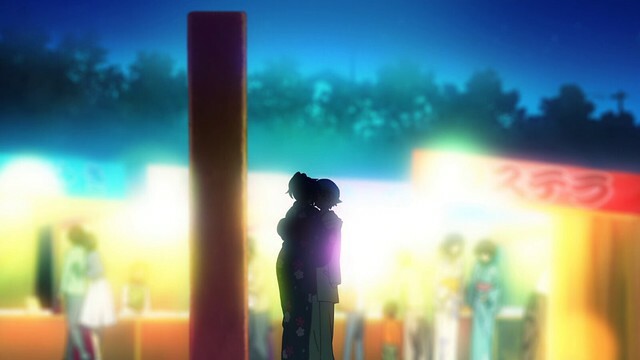 Positive imagery abounds in the early stages of Tomoya and Nagisa’s marriage: colours are vivid, and the mood light as the characters bounce off one another. However, winter sets in. With its greys and whites, winter is bleak, a time of cold and darkness. It is here that Nagisa perishes while giving birth to Ushio, unable to access medical facilities because a blizzard has rendered dangerous travelling on roads. 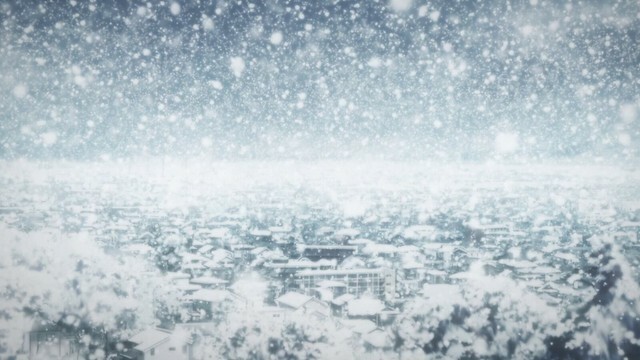 The winter contributes to Nagisa’s death, and it becomes very clear that ~After Story~ regards winter in a negative light – winter isn’t just an ending to light and warmth or about dormancy, it is the embodiment of death and suffering, of loss and uncertainty. Tomoya’s determination to make his point clear to Akio is such that he is willing to commit every free moment available to gearing up to make a hit. This is one of Tomoya’s strongest suits: when he feels something is worth fighting for, he will move heaven and earth to accomplish his goals. 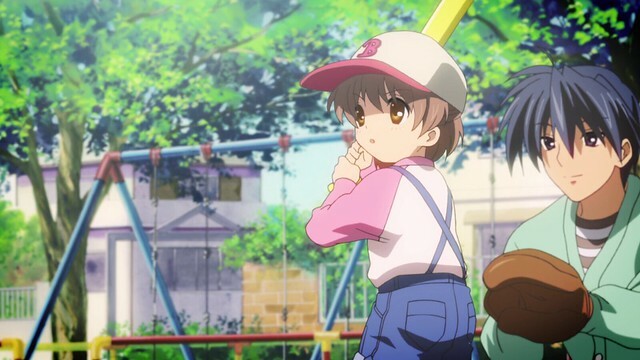 Viewers have wondered why baseball is so prominently featured in CLANNAD: besides being a national pastime in Japan, it is also symbolic, acting as a visual metaphor for effort. During one Christmas celebration, Nagisa gets hammered after one sip of sake and immediately accosts Tomoya, wondering if he would find Sanae more attractive. Tomoya is cornered, leaving audiences with a good laugh. Moments such as these do much to humanise the characters: we tend to relate to people more strongly if they demonstrate a wider range of emotions, and such moments serve to make the sorrowful moments even more poignant. Nagisa’s frailty becomes more apparent as ~After Story~ wears on, and she falls ill again. However, it is fortunate that Nagisa’s illness does not cause her to miss a protracted amount of class. As winter transitions into Spring, Nagisa finally graduates, having completed the requirements needed to earn her diploma. Under the beautiful spring skies, Nagisa receives her diploma as sakura blossoms flutter about. 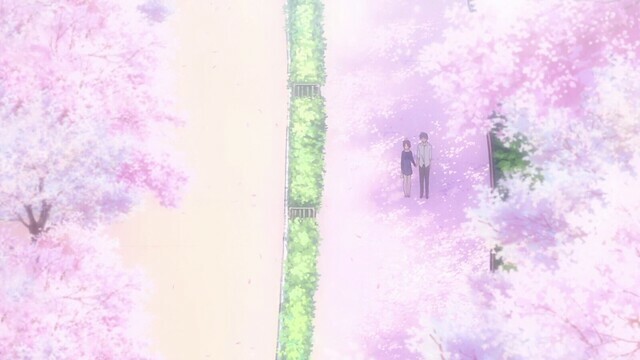 The colours of this scene parallel those seen when Tomoya first met her, and the idea that spring is a time of new beginnings; with Nagisa finally done her high school education, she and Tomoya can move ahead and embrace their future together. When I last watched ~After Story~ some five years ago, I was gearing up for an MCAT and had not even finished my undergraduate programme yet. Going through CLANNAD was a bit of an eye-opener – the series shows a world beyond the familiar environment of school and steps into the realm of what adulthood entails. In the full knowledge of what unfolds in CLANNAD, I can say that real life can sometimes be as unforgiving and unfair as CLANNAD. Such unknowns cannot always be easily foreseen, but now, armed with five years of additional experience, I can say that the real key to handling life’s problems is to triage, divide and conquer even when said problems adamantly refuse to take a number and queue up. Tomoya and Nagisa’s marriage is not depicted, and is implied to be a very simple one. One thing that I greatly respect CLANNAD for is its portrayal of love in a very clean manner. When people think weddings, expensive gowns, exquisite dinners and an exotic honeymoon usually come to mind, but ultimately marriage is the affirment that two people are committed to one another, for better or worse. Whether one takes on a fancy wedding or a simple one, the end result is a declaration of this commitment and faithfulness to one another. With Tomoya and Nagisa now husband and wife, Akio is Tomoya’s father-in-law and Tomoya becomes Akio’s son-in-law. When they address one another informally, the embarrassment mounts to the point where Tomoya is reduced to banging his cranium against the wall, while Akio writhes in agony on the table. 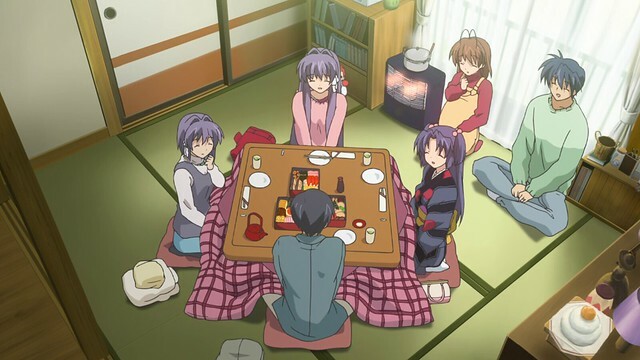 CLANNAD excels in taking ordinary moments and driving humour from them, although I’m not too sure if the equivalent in Western culture would be as funny – some jokes only work becuase they are plays on aspects unique to Japanese culture. For instance, as Taki, Mitsuha refers to herself as atashi and boku erroneously, but in English, people only say “me” or “I”, so the joke has no such equivalent. After an eventful day, the newly-weds return home as husband and wife for the first time. 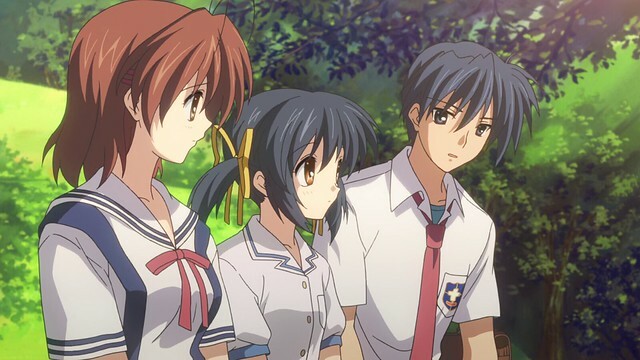 Tomoya looks as he always does, but with her hair in a bun, Nagisa looks a ways more mature. 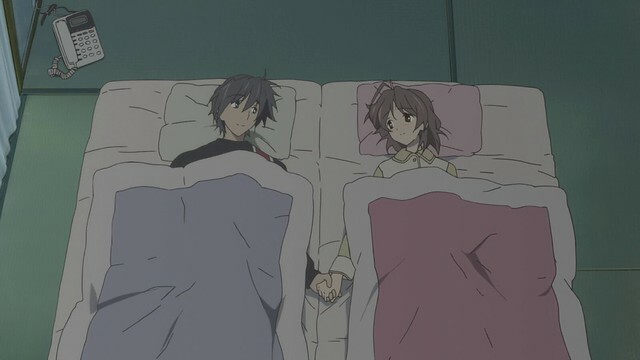 With Tomoya and Nagisa now married, I exit the part of CLANNAD that I can speak about from personal experience; beyond this point, my remarks are largely anecdotal rather than something I’d previously experienced. One thing that characterises marriage is sharing a bed, although more couples sleep apart nowadays, too. There are benefits and drawbacks to both; proponents of sharing a bed say that it encourages communication and acts as a reminder of closeness, bolstering the release of oxytocin and reduces cortisol (reduces stress), while those favouring sleeping apart cite better sleep as reasons to do so. Tomoya and Naigsa’s marriage is presented as being another stage in life, filled with the joyous, mundane and challenging: it is a broad spectrum of experiences that allows ~After Story~ to captivate audiences. Even if the series does come across as being more melodramatic in some moments, when everything is said and done, CLANNAD stands head and shoulders above most anime for its sincere portrayal of life, both in terms of the lowest of lows, highest of highs and the everyday moments folk tend to take for granted. Tomoya recounts the legend of the light orbs, which are said to represent people’s wishes and manifest when people do something benevolent. Tomoya asks if Nagisa would wish for anything, and she replies that she’d like a child. Even from this perspective, both are blushing furiously, and no more is said of the matter for the time being. Having children is a major commitment and investment for any couple; it is unsurprising that whether or not to have a child can be a very difficult discussion to have for a couple. As I’ve noted earlier, this is something I’m completely out of my depth in; beyond stating that I would be quite happy to have a child, I will also say no more of the matter. To step away from a difficult topic, ~After Story~ cleverly transitions to Tomoya and Akio dropping by the family restaurant that Nagisa works at. This particular unfolding of events represents a masterful use of flow to mimic what happens when uncomfortable topics are brought up; the anime does not yet wish to disclose what Tomoya’s response is, so it immediately pushes audiences to a scene of comedy with Akio at the helm with the intent on having them smile and laugh, while the question of whether or not Tomoya will agree with Nagisa’s wish being put on the back-burner for now. 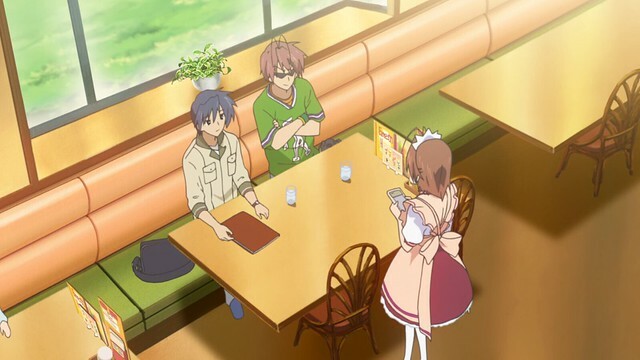 After Tomoya orders a parfait worthy of Adam Richman, two guys enter the restaurant and accost Nagisa. Without use of force, Tomoya and Akio manage to drive off these two ruffians, but then the manager asks to speak with Tomoya and Akio. Akio bolts, but as it turns out, the manager is very understanding of the situation and remarks that Nagisa is a hard worker who does her job well. During this excursion, Akio’s brought a camera and manages to capture an inordinate number of shots, citing the uniforms as being a motivator. From my perspective, those uniforms seem quite impractical despite being stylish: at restaurants I frequent, staff wear something more practical to move around in. 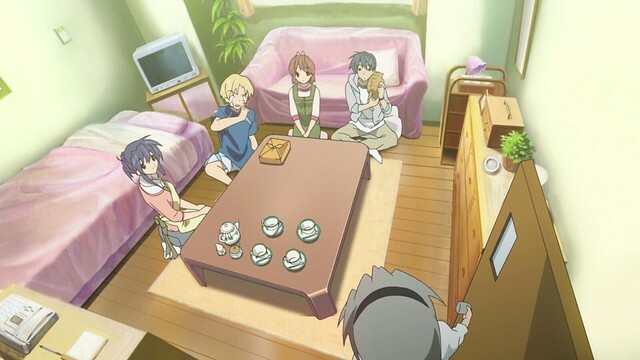 Although the Okazaki family might live in an older apartment, their regarding it as a home becomes more apparent with the passage of time following their marriage – Tomoya and Nagisa keep their quarters clean, gradually acquire more furnishings that make the apartment really feel like home. From the notes on the refrigerator, to a kettle boiling on the stove and a water filter, the changes in their home are subtle but notable indicators that Nagisa and Tomoya are settling into their new lives. Like real life, urgent and important matters are not so easily dismissed, and it turns out that Tomoya and Nagisa did end up making love: while Tomoya and Akio look through the pile of photographs, Nagisa tests positive on a pregnancy test. These work by picking agents that react to human chorionic gonadotropin (HCG) to produce a pigment; while reliable, there are cases where interference from other chemicals or circumstances can create false positives. In ~After Story~, we accept that the test results are a true positive so the story can proceed. Akio is simultaneously disgusted and impressed that Nagisa is pregnant (with the not-so-subtle implication that Tomoya needed to get down with Nagisa freshly baked into his mind) – he is torn between congratulating and throttling Tomoya, while Nagisa looks on in pure embarrassment. This marks the beginning of another stage in life for the Okazaki family: through everything thus far, Akio and Sanae have been present at each step for the young couple, offering support, guidance and humour. It is not lost on me that it’s been six-and-a-half years since I last watched CLANNAD in full, and in that time, I’ve passed through several milestones in life, but meeting someone special has not been one of them. The reality is that I am becoming old: most folks at my age are married, and here I am, with only the faintest idea of how to begin meeting those people who might be willing to tolerate or accept my numerous limitations and eccentricities. While it’s fine to enjoy my current liberty, I would eventually like to meet someone, settle down and the other things that come with family. With Nagisa expecting a child, a midwife is hired help out with the process. Yagi fulfils this role: her appearance conveys experience and professionalism, providing the young couple with reassurance that stands in contrasts with the risks of birth. 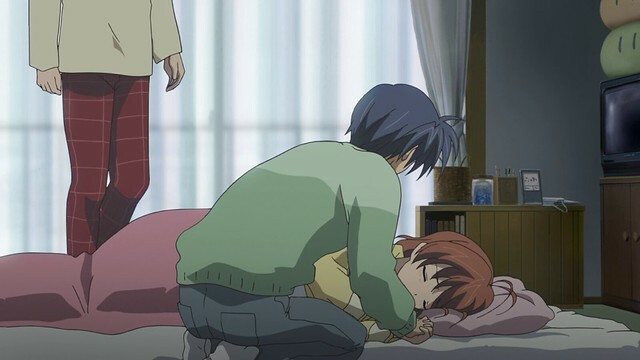 CLANNAD has placed numerous obstacles down in front of Tomoya and Nagisa: even after all of their efforts, delivering their child is not expected to be an easy task. The profession is a regulated one: in Japan, midwives must pass a certification exam, and Canadian midwives hold a medical license. Some series portray marriage as the end-goal, a destination to be reached, rather than a milestone. Love Hina is one such example, with Keitaro’s efforts to gain admission to The University of Tokyo and marry the girl he’d made the promise to years previously as the core narrative. Being a romance comedy, Love Hina is a world apart from the likes of CLANNAD and admittedly, represents a genre that I’ve not viewed too many series from. Here, we have another beautiful screenshot capturing the details present in ~After Story~; elements in the environment give a sense of hope, with the choice of colours creating an optimistic feeling even as news becomes increasingly difficult. Because of Nagisa’s health, Sanae expresses to Tomoya her concerns about Nagisa’s decision. In spite of this, she leaves the decision to Nagisa and Tomoya, respecting their choices. Nagisa decides to proceed, a flash of her old resilience and stubbornness coming through. Assessing risk in the situation and then making a decision with the knowledge available brings to mind the sequence in Apollo 13, where Flight Director Gene Kranz ordered a circumlunar option over the direct abort because of uncertainties surrounding whether the command module’s main engines could still be safely used. While a free-return trajectory would take longer, it gave ground crews more time to assess the situation and not subject the command module’s crew to risk of explosion from a faulty engine. Akio expresses frustration at the destruction of a wooded area at will be developed into subdivisions and retail. Change is one of the themes that are a part of CLANNAD – the series suggests that change is inevitable save for family, the one absolute pillar of support and love that individuals need to get through challenges. 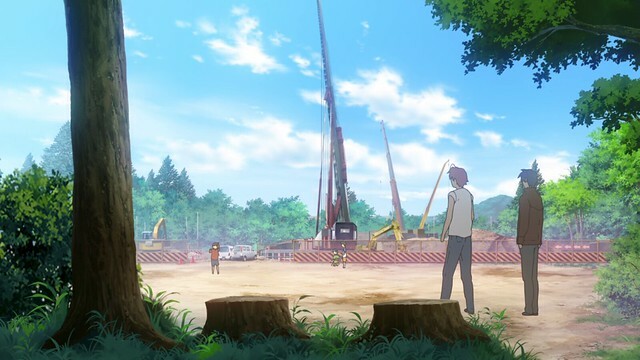 It is hinted that changes to the landscape are correlated with Nagisa’s illness, and Akio explains to Tomoya what happened that fateful day – it appears that in exchange for Nagisa’s life, her very life-force is bound to the world such that changes will disrupt her health. By binding Nagisa’s health to the presence of natural spaces, ~After Story~ subtly mirrors J.R.R. Tolkien’s lament for the loss of natural areas as people continued to industrialise: as the town in CLANNAD grows, forests and meadows are covered over to make way for developments, and the land that once held a magic suddenly becomes mundane, unremarkable. Tolkien viewed the desecration of nature as an evil, and this theme is prevalent in his works: Mordor and Isengard, as well as the Scouring of The Shire represent this. In ~After Story~, the loss of nature has a more subtle but present impact on Nagisa, foreshadowing her fate. 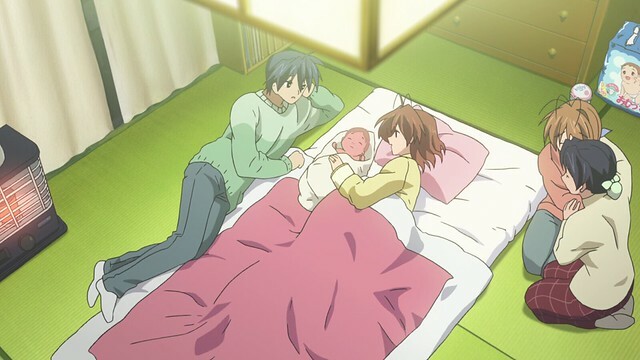 In a tender moment, Tomoya and Nagisa decide that their child’s name is to be Ushio. Ushio (汐, jyutping zik6, “tide”) was chosen to share the same radical氵(representing 水, derived from the Oracle bone script for the shape of a river) as Nagisa’s (渚, jyutping zyu2, “beach”). The choice of naming is deliberate: Ushio is meant to represent the waves on a beach, connecting her to her mother. I share a personal story here: per my parents’ recollection, when I was born, I was premature and therefore, my parents did not yet have a name for me in either English or Chinese. As another Christmas nears, the Okazaki family prepare for Ushio’s arrival. The passage of time is relentless, and as ~After Story~ wears on, time intervals widen. 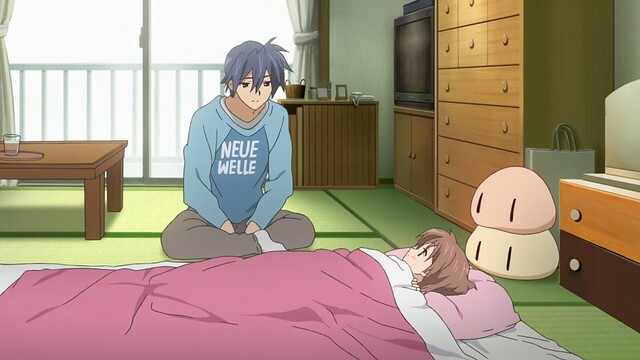 While time may have seemed constant during Nagisa and Tomoya’s time as high school students, things suddenly pick up after both graduate, begin working, get married and gear up to welcome Ushio into the world. This is precisely the feeling I’ve been getting since I’ve graduated: days blaze by in the blink of an eye, and time seems to be accelerating as I grow older. After Christmas, old friends show up in town to visit the Okazakis for the New Year. Time has evidently been kind to everyone: Kyou, Ryou, Kotomi and Youhei have not aged a day since we last saw them, and everyone’s doing well. With everyone together, it’s like old times again as conversation begins. Of note is Youhei, who is sporting his natural hair colour: he’d dyed it blonde as a student, and returning to his original hair colour seems to signify that he’s gotten his game together. Tomoyo is noticeably absent from the events, but she’s sent a card and appears to be doing well. After the small talk, Youhei wonders what Tomoya must be feeling to be a father, and Tomoya’s response, that he’s really still not thinking about it, seems to be the norm. I’ve long felt that my parents simply had their game together and knew precisely how to be parents, but it sounds like for most families, parenthood is a learning experience, as well. In Calvin and Hobbes, Calvin’s parents remark that they’re essentially ad libbing parenthood: Kyou and the others feel that Nagisa and Tomoya are pulling ahead in life, as they have a home and family now, but everyone is also focused on their own futures, too. While their gathering is a warm one, the anime uses the incidental piece “Snow field” as background music, foreshadowing what’s to come. Kotomi suggests the existence of parallel universes and alternate dimensions, supporting Ryou’s remark that life is mysterious. In Steven Hawking’s The Universe in a Nutshell, the notion of branes are used to describe the existence of other dimensions, and that the reality we are familiar with is merely one of these branes (with higher dimensions being such that we cannot perceive them). This foreshadowing also seems to indicate ~After Story~‘s eventual outcome, but back in the present, the presence of low saturation and washed-out lighting, plus overcast skies, indicate that things are about to become more difficult. In February, Tokyo averages around 5 centimetres of snow. A snowfall of this level is quite rare, and in ~After Story~, shuts down enough of the roads so Nagisa cannot be taken to a hospital, right as she goes into labour. I’ve long hated snow, and I still do: despite blanketing the landscape in a gentle white blanket and covering familiar features to create a wonderland of sorts, but it also disrupts transportation. In literature, snow represents mortality, indiscriminately covering everything as mortality affects all life, and visually, snow is used to visually denote hardship, suffering and desolation. With no other options available, Yagi prepares to help deliver Ushio at home. It is an agonising day for Tomoya, who never leaves Nagisa’s side: time seems to slow to a crawl for him as Nagisa writhes in pain. 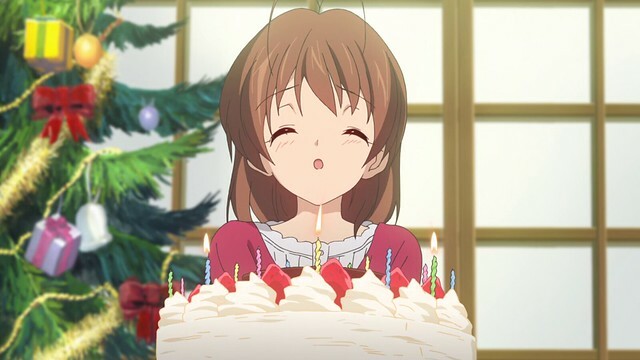 Finally, at one in the morning, Ushio is born, and Tomoya is elated: the worst seems over for Nagisa, and she is able to gaze upon Ushio with her own eyes for the first time. The page quote is chosen from a promise Nagisa makes to Tomoya, but shortly after giving birth to Ushio, Nagisa perishes from the toll on her body. Audiences are left to pick up the pieces with Tomoya, whose dreams for starting a family are decimated: in this moment, the world around Tomoya vanishes. With this post in the books, I will be returning next month to write about a world five years later, and how Ushio returns to Tomoya’s life in a big way that helps him finally come to terms with everything he’s experienced. 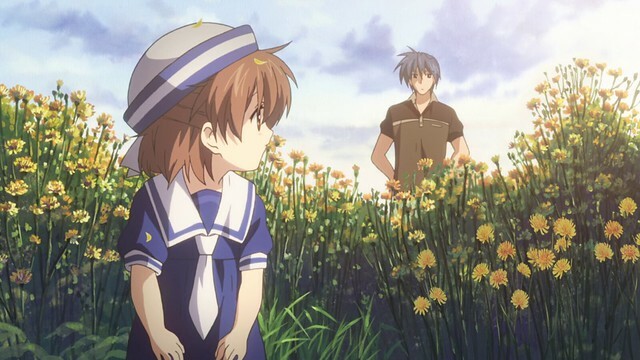 Ushio’s arc in ~After Story~ is what made CLANNAD a masterpiece in my books, and upon watching it for the first time, I had no words to describe how moving and meaningful it was. In my next post, I will be articulating why Ushio’s arc was so powerful; covering so much ground in such a short time, Ushio’s arc is directly responsible for giving ~After Story~ the impact that it did, and I wish to do it justice. As ~After Story~ steps away from clearly-defined arcs and delves into Tomoya and Nagisa’s marriage, the series enters a realm that is exceedingly difficult to write for. 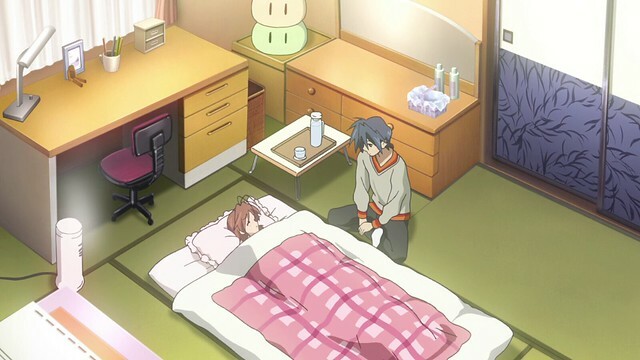 Marriage is a completely different world for people, and there are so many aspects to consider that CLANNAD would doubtlessly have needed another twenty episodes to adequately portray it faithfully. Instead, ~After Story~ masterfully utilises imagery and the symbolism inherent to the seasons themselves to concisely and succinctly convey to audiences the emotions and feelings, the unspoken things that can happen in marriage. 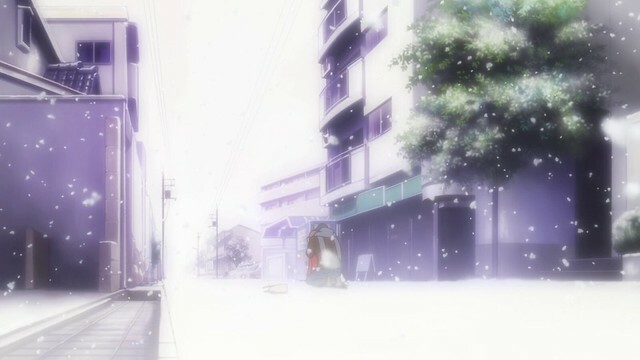 CLANNAD has long made use of weather and lighting to convey emotions in a moment; the seasons themselves take on a much more substantial role in ~After Story~ to further communicate the atmosphere of a given moment to viewers. Spring is about new beginnings, summer is a time to explore what a new family entails, and winter is viewed as a season to be hated, bringing death and suffering to those caught in its frigid confines. Viewers can tangibly feel the cold as Nagisa succumbs, and are made to understand just how devastating this is for Tomoya, having seen every step in the journey he has taken, and the efforts he has made towards building a future for Nagisa and Ushio. While it seems unnecessarily cruel to put Tomoya in such a situation, Nagisa’s death has a critical role to play for Tomoya; he’s spent much of ~After Story~ forging ahead into the future. 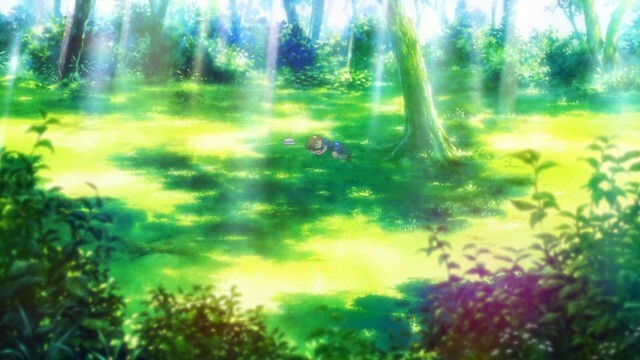 It is therefore clear that his intentions is to forget his past, but this loss now forces Tomoya to look inwards: winter is also a time of self-reflection, and light eventually returns to the world ~After Story~ takes this route to remind audiences that, unless one is able to make peace with their past, there is no future to pursue. Thus, Nagisa’s death is necessary to pull Tomoya back and force him to understand his past. There is no other easy way of putting this, even if it is callous to suggest such a thing – beyond this suffering, there is more that ~After Story~ strives to convey to readers. 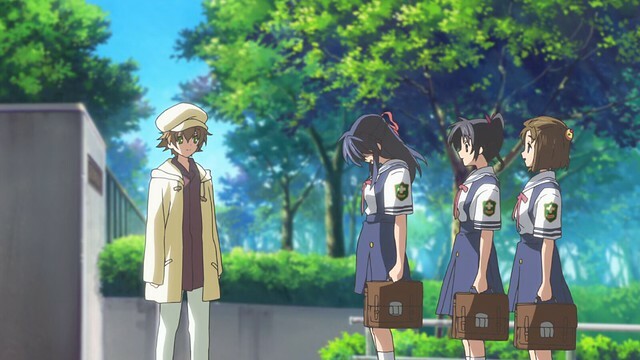 After helping Yukine resolve a long-standing feud with gangs in town, graduation for Tomoya and the others near. Kyou aspires to be a kindergarten teacher, while Ryou decides to become a nurse. Kotomi plans on studying abroad, and Youhei aims to be a model. However, Tomoya is uncertain about his future. When Nagisa falls ill during Christmas Eve, he spends time with her. 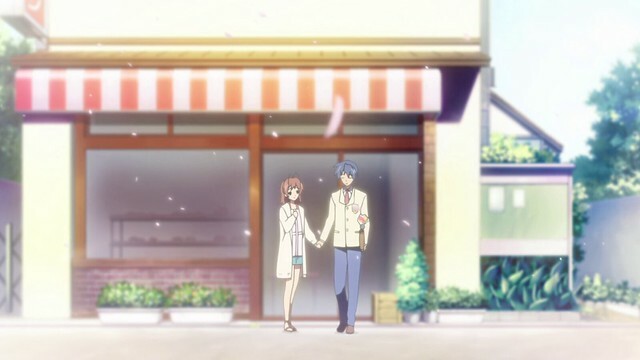 After graduation, Tomoya takes a job with the Furukawa bakery, and Nagisa returns to school. 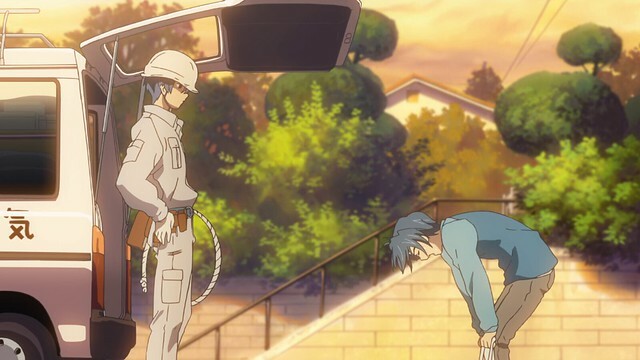 He moves out into an apartment with Nagisa, and accepts a new job as an electrician. Determined to prove his worth, Tomoya works diligently with Yusuke, who promises to withhold that Tomoya has a shoulder injury. 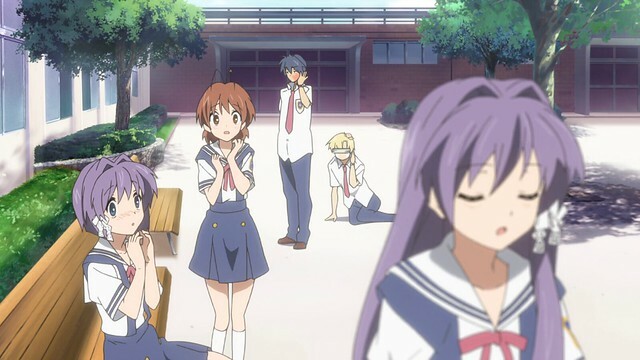 While Tomoya earns the respect of his coworkers with his effort, he also begins to spend less time with Nagisa, missing most of the day at the school’s Founder’s Festival. One day, while working with Yusuke, Tomoya learns from him that he was once a songwriter who descended into depression. He returned home and encountered Kouko again, regretting giving up his dreams of singing for her. Back in the present, Tomoya has been presented with a new job offer, but this is rescinded when Tomoya’s father is arrested. 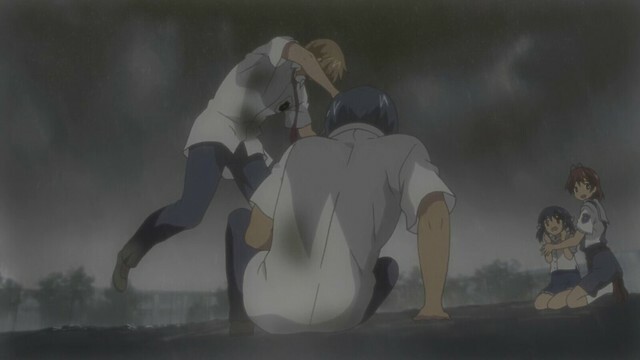 Tomoya is consumed with frustration that his past is inescapable, but Nagisa intervenes and calms him down. In the aftermath, Tomoya proposes to Nagisa under a hot summer’s day, who accepts. From his final days in high school to the transition point where he becomes a full-fledged member of society, Tomoya’s journey has been a tumultuous one. His kind heart dominates his apathy, and spurred on by friends, Tomoya’s closes off one chapter of his life, moving onwards in the world ahead. 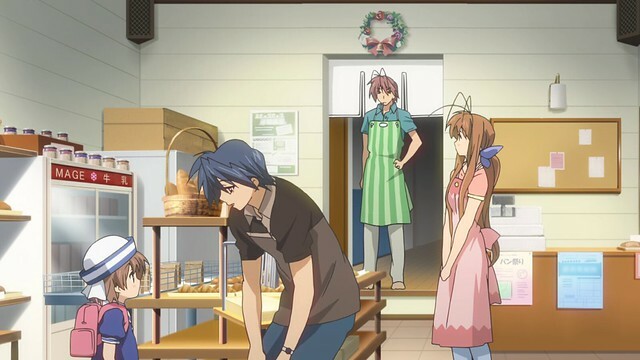 However, as he learns, the real world is not forgiving; lacking any direction, Tomoya initially decides to regroup and occupy his time by working at the Furukawa bakery, keeping himself from idling. Despite not having a clear plan for the future, Tomoya has always been skillful at making the most of things. 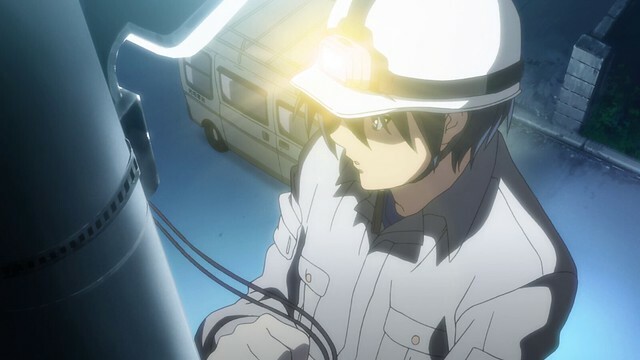 Keeping busy while he works out a plan, Tomoya eventually becomes an electrician and finds it a job he enjoys. However, in taking up a new job, Tomoya is faced with the task of proving his worth, and so, struggles to find his work-life balance. This becomes evident when he begins dozing off during dinner, and later, misses his promise to be with Nagisa at the Founder’s Festival. Spending time with loved ones is a vital part of life, and of late, work-life balance has been discussed more widely, since working too diligently has been attributed with a decrease in performance at one’s job. There is another cost in one’s personal relationships; working more means spending less time with the important people in one’s life, and this is evidently has taken a toll on Tomoya, whose time with Nagisa has been decreasing. 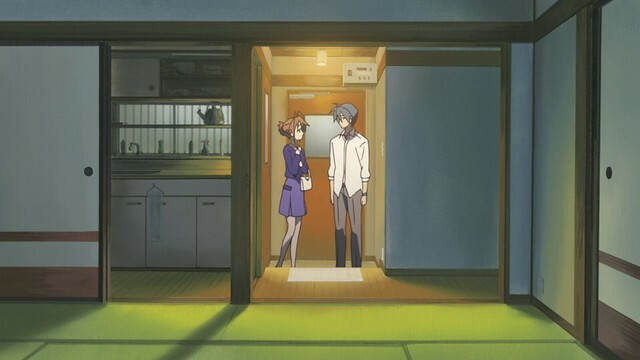 In the real world, this can be a point of contention amongst couples, and the couples that are similar to Tomoya and Nagisa, who are willing to accept one another and work things out, are usually those that end up sharing their futures together; Nagisa is very understanding of Tomoya and does her best to accommodate him. By presenting Nagisa as patient and accepting, ~After Story~ makes it clear that Nagisa is the person for Tomoya, being a gentle and compassionate foil to his energy and determination, constantly looking out for him even when things become difficult. 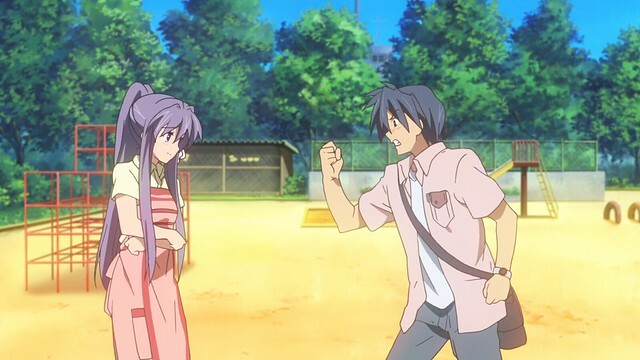 After learning his offer to work at a larger company was rescinded because his father was arrested, Tomoya’s reaction is a forceful one, and Nagisa’s actions here, to physically stop Tomoya from injuring himself, show that she’s willing to do what it takes for Tomoya’s interest. Realising that Nagisa has gone to these lengths for him, Tomoya decides here to propose to her. While the moment is not likely to be counted as the most romantic proposal of all time, it’s certainly moving and fitting for the challenges the two have survived thus far. Originally, I was thinking to write about ~After Story~ earlier this month, following Tomoya’s graduation, but it felt more appropriate to showcase his graduation, the transition into society from high school and then his decision to propose to Nagisa in a single post. Before we can get there, however, there’s also Yukine’s arc. The caretaker for the reference room, Tomoya and Youhei visited here after Tomoya dropped by to find resources for Nagisa. Yukine was originally intended to be a primary character, but difficulties in writing her story led her to be reassigned. It turns out that Yukine is well-acquainted with delinquents in opposing gangs because her brother, Kazuto, had been a part of one of the gangs. Yukine later finds a young boy who worries about his older sister’s association with such individuals and decides to help him out. Tomoya and Nagisa join in, learning that the delinquents that Yukine knew were kindly individuals even if they were rough around the edges. Eventually, the violence between the gangs escalated, and with the threat of law enforcement intervening, the gangs agree to settle things in a mano a mano with Kazuto squaring off against the opposing gang’s leaders. Not knowing that Kazuto’s been dead for some time, and worrying about the consequences associated with this, Tomoya agrees to step in. He shows incredible resilience in the fight, enduring for hours until Yukine appears and attempts to stop the fight. 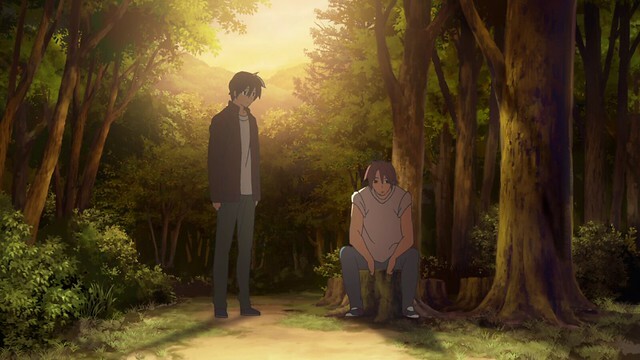 Because Kazuto’s death is known, the gangs agree to set aside their animosity and pay their respects to Kazuto. A globe of light appears and floats into the sky afterwards. Having long established that Tomoya is willing to go to great lengths to see things through, his role in helping Yukine is not particularly useful in providing more insights into Tomoya’s character. However, the arc does establish that the town Tomoya lives in has its share of problems as well, and that the right person, in the right place, can help set things right without escalating the conflicts. For me, Yukine’s arc was a side story that I would consider to be the weakest in ~After Story~, and after revisiting things, my thoughts have not changed dramatically. 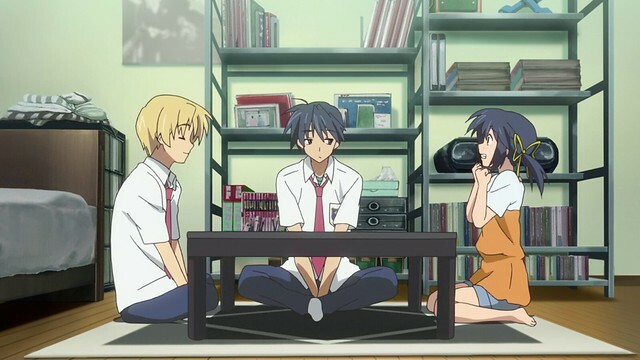 This is why discussions on the arc is so short: we move swiftly into Tomoya’s final days as a high school student, where he struggles to determine what to do with his future upon graduation. The remainder of his friends have concrete aspirations, and even the unreliable Youhei has decided that he wishes to be a model. Back in high school, picking a future and sticking with it was always a challenge for me: this has come back to haunt me occasionally, but I’ve found that with my experiences in university, I’ve finally found something I enjoy doing. Nagisa’s birthday is on Christmas Eve, and her friends swing by to visit, lightening the mood up. Tomoya gifts to her Dango plushies that she takes an immediate liking to; the Dango Daikazoku have a much smaller presence in ~After Story~ owing to the fact that there is no drama club to re-establish, but their reappearance here shows that Tomoya’s not forgotten what Nagisa is fond of. Subtle but meaningful, these elements contribute much to the human aspects of ~After Story~. 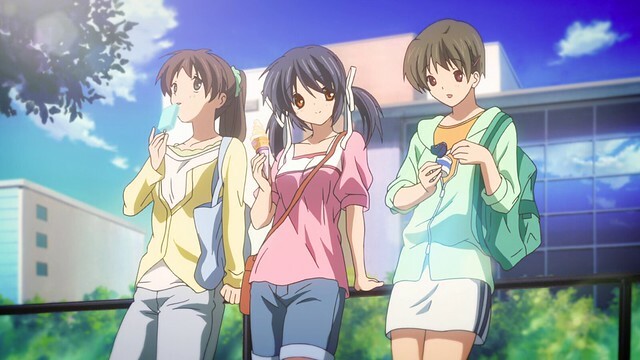 The Dango Daikazoku song is one of the most famous songs from CLANNAD, being immediately recognisable to those who hear it, and is also the subject of numerous remixes and covers. Its magic comes from a combination of its lullaby-like composition and association with CLANNAD. The forward lyrics indicates Nagisa’s innocence and belief in good; while a naïveté, Nagisa’s persistence in finding the positives in everything ultimately describes CLANNAD‘s message. 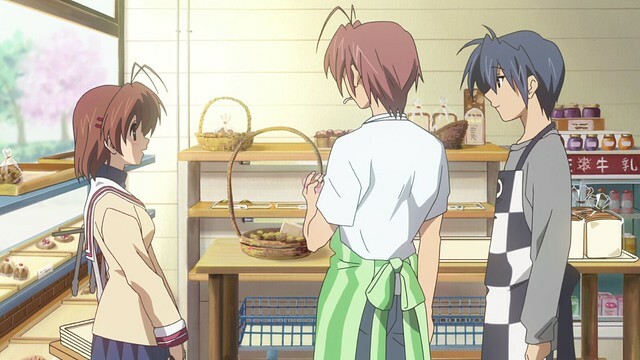 Through the events of CLANNAD, Nagisa and Tomoya have gained lifelong friends: the strength of their friendship is so that even after Nagisa and Tomoya become a couple, Kotomi, Ryou and Kyou do not seem bothered and openly support them as friends would. It’s a different reaction than what I’ve known: in every case after someone rejected me, they also chose to burn bridges, as well. I move on fairly quickly and aren’t really bothered, but being less versed in these sorts of things, I turn to the reader to see if there’s an explanation for why this occurs. 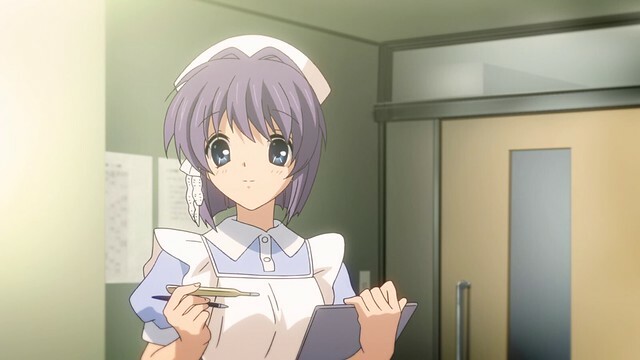 Nagisa has an illness of an indeterminate nature, and while some folks at Tango-Victor-Tango were quick to diagnose her with a viral autoimmune disorder, then proceeded to argue that since CLANNAD is set in the nineties, such a disease would not be well-characterised, hence why it cannot be identified. The reality is that the virus responsible for this disorder was identified in 1983 (whereas CLANNAD is set in the early 2000s) and there are antibody tests that can be done; further to this, other observations in CLANNAD quickly dispel that it’s an autoimmune disorder. I won’t bother directing more time towards this discussion, since the precise nature of Nagisa’s illness is irrelevant to the story. Graduation ceremonies from high school in Japan are not so different than the ones here in Canada, although we tend to have a celebration in addition to the ceremony. It’s a major turning point in people’s lives as they transition into adulthood, a time to be excited about seizing the future. That Tomoya and Youhei have reached this point despite their prior challenges speaks volumes about the impact that friendship has had on them: to support others and be supported have allowed the two former delinquents to get their game together and embrace the future. 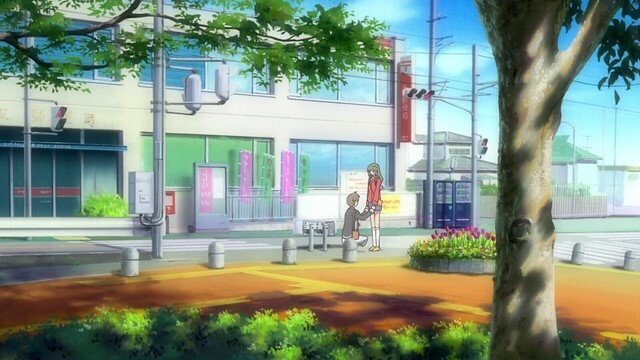 After graduation, Tomoya spends time with Nagisa on a walk, hand-in-hand. My previous experiences with graduation was a nice dinner after the ceremony, as well as farewells with peers and instructors alike. Representing the true turning point in life, graduation in ~After Story~ is where the story truly turns from a great one to one that is unparalleled. Most stories end with high school, leaving characters’ fates open as they step into the future, but ~After Story~ presents what futures may hold with honesty – it is not “happily ever after”, but a world filled with both new promise and difficulties. Nagisa’s illness eventually causes her to miss enough classes to be held back another year. 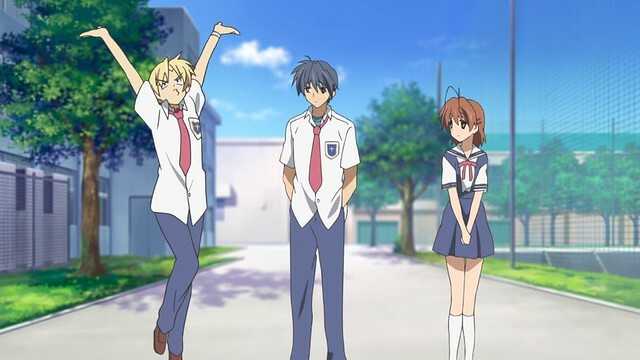 Tomoya pushes ahead in his life, while Nagisa is left to continue high school on her own now that everyone’s graduated. The very prospect of this is immediately melancholy to viewers, but at the same time, Nagisa’s also become far more motivated than before. Even if Tomoya and the others are not in her corner physically, their time together gives Nagisa the resolve to continue with the drama club. Tomoya’s past with the Furukawas allow him to earn a position here to help out. While not exactly a career with a bright path ahead, working somewhere allows Tomoya to have focus. Idling in high school was what led to his days of unprofitable boredom, so his seizing the opportunity to do something while working out his future shows that with the right people in his corner, Tomoya is motivated and determined. Nagisa’s time in high school is marked with her making few friends and being unsuccessful in continuing the drama club. 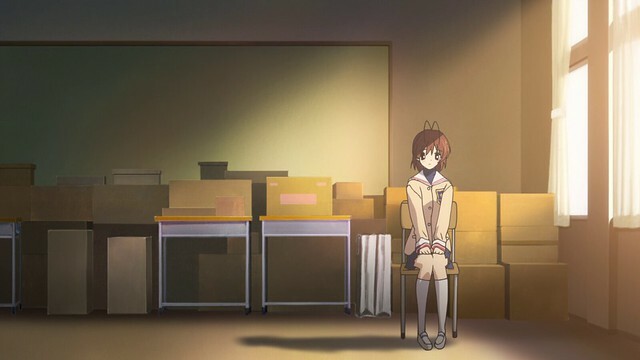 Her difficulties are mirrored in the composition of this still: Nagisa is not the central subject and is alone in the drama room under lengthen shadows of a sunset. Being alone on school grounds after hours creates a sense of melancholy. I recall those days on campus during the summers after research, when I would walk around the grounds to relax: empty halls and classrooms elicit a sense of loneliness. Tomoya rushes out to meet Yusuke and entreats him for a job as an electrician. While ~After Story~ deals with the world outside of school in a highly detailed manner, its focus means that some aspects are passed over: I’m certain that getting a job is not as simple as asking a friend as a referral, since there are still formalities that must be dealt with, for instance. With this being said, ~After Story~ is about family, not the job search; since Tomoya finding a job is integral to the story, audiences accept that he is able to find work and have an income, allowing the story to focus on other things. Tomoya decides to move out, and with a suggestion from Ryou, finds a place nearby with low rent. 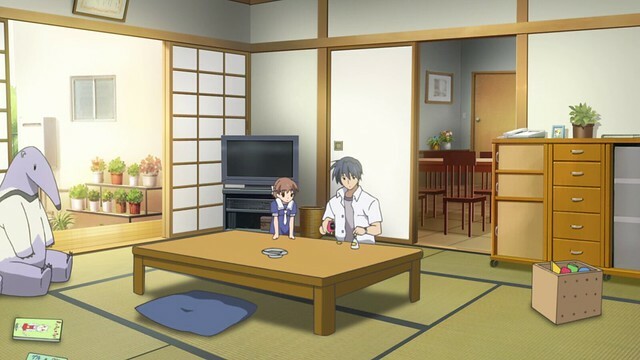 Tomoya’s apartment was based off an apartment in Suita, Osaka, which was demolished the same year that CLANNAD was aired. 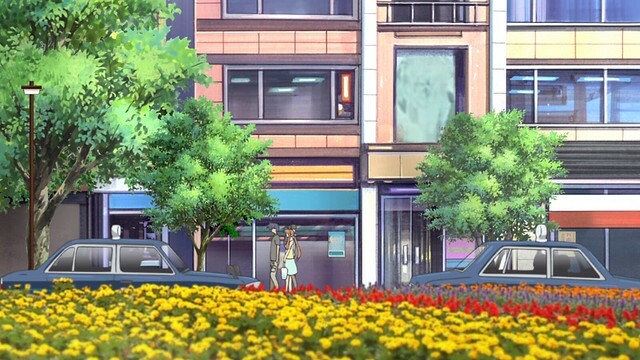 CLANNAD itself is set in a location inspired by Mizuho, Tokyo, and while the anime is not a hundred percent faithful to the real world locations, the similarities are quite visible. I imagine that this location is near the Tama River. Tomoya is offered a job with the company that Yusuke works for, and immediately sets about learning the ropes of being an electrician. I’m not sure how it works in Japan, but back home, there’s a four-year apprenticeship program that one must take, then complete the Journeyman Certificate programme and work under an employee. Some institutes offer programs, but high school students in my province can be hired into a company as an apprentice after graduation, as well, taking the same route that Tomoya takes. Early in his career, Tomoya would make just enough to support moving out and living independently, and after his first day of work, he comes home to a home-cooked dinner Nagisa’s made. When I think about it, I see in an ideal partner someone whose priorities are trust, commitment and honesty, someone who accepts handling tough times together and accepts that not every step of our journey together is going to be sunshine and rainbows. In the knowledge of this, they’d be willing to stick it out. I grew up with old-fashioned values, and it seems that this is largely incompatible with what most people expect. Nagisa embodies the sort of mindset that I’ve come to value and respect – no matter how tough things get for Tomoya, she continues to see the good and support him. For these two, an evening stroll together is as enjoyable and meaningful as a couple’s vacation overseas; the former might not be an Instagram-worthy moment, but that doesn’t stop it from being a good way to relax. 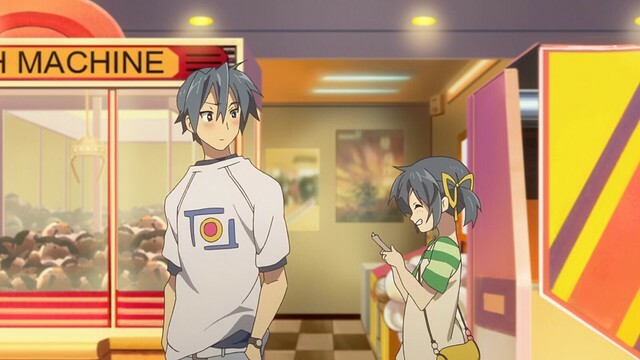 While Tomoya might be working hard to support his new family, things with the Furukawas are still as much as they once were: one particularly memorable prank involves a lizard that Akio’s acquired from a shop owner after a fierce toy lightsabre duel. 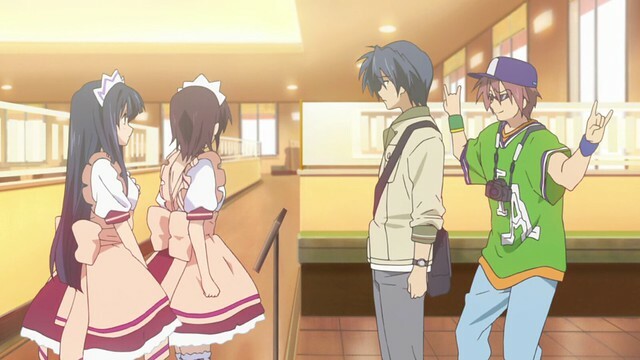 Unlike Tomoya, who’s working his rear off, the Furukawas have managed to find that work-life balance in their lives, and here, the cost of their prank is a heavy one: Sanae tackles both Tomoya and Akio on her way out of the shop in a panic. Getting used to a new job is a challenge; when I first watched CLANNAD ~After Story~, I did not have the experiences to really appreciate what Tomoya was experiencing. With this being said, I knew that there would come a day when I would finish the MCAT and graduate, so I wondered what working would feel like. I can now honestly say that it is a world apart from being a student, and that Tomoya’s effort to excel at his work is very real as he strives to prove his worth to his new employer. For me, an honest effort to do the best job possible, and the humility to ask for help are two of the most vital traits in someone worth working with. On the topic of transitions in life, it takes about a two weeks to adjust to a new environment, and then a month to settle down and make the most of the routine. This first while is always the trickiest, and the closest analogy I have is trades in sports teams like in the NHL: although one might be wearing a different jersey, they are still playing the same sport, and so, once one adjusts to their new team, things become more routine and familiar with time. Tomoya’s initial efforts come at the expense of his relationship with Nagisa; he ends up missing most of the Founder’s Festival and arrives late, but Nagisa does not mind, understanding Tomoya’s effort to earn his keep. It’s one of the surest signs that make Tomoya and Nagisa such a good couple: every couple I know that is in a strong, healthy relationship understands that relationships are give and take, about weathering tough times together as much as enjoying good times together. 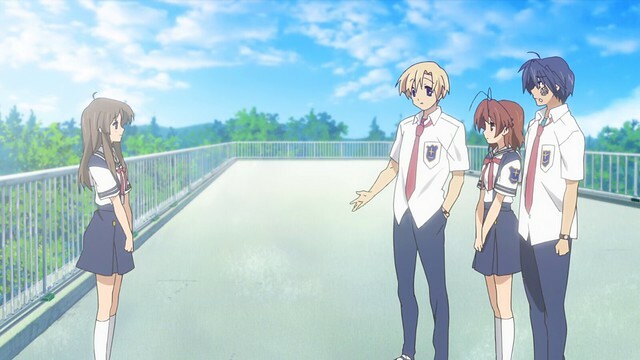 By talking it out, Nagisa and Tomoya reach a proper understanding with one another: although Nagisa has always tacitly supported Tomoya with his career, their communicating with one another means that nothing is left unspoken. Even though they are still a couple at this point, ~After Story~ uses the subtle to convey how close the two are. It is not often that things like trust, commitment and compromise are used in fiction to portray a strong, healthy relationship – more often than not, romantic gestures and dates are used. While more visceral for fiction, the reality is that in a good relationship, there is more communication than there is kissing, despite what social media might otherwise suggest. When Tomoya is offered a new position at a larger company, he is conflicted as to whether or not he should take the offer. Yusuke recounts his past as a musician to Tomoya, explaining that he was once a musician who was unable to keep up with his work, and fell into despair after one of his fans committed a crime. Losing sight of why he wanted to perform, Yusuke turned to substance abuse and hit rock bottom. He returned home and met Kyouko, realising that she was his reason for performing. Although no longer a musician, Yusuke learned that as long as one has a focus in life, they will make things work out. Tomoya decides to take on this new position, feeling it to be a path to the future. Life is ever-changing, and to pass on opportunity may come with a cost. Youth is a time for exploring new avenues, and Tomoya is excited about the change of scenery. However, at the worst possible time, Tomoya learns that his father’s been incarcerated for possession of controlled substances, and this causes his offer to become rescinded. Feeling his home town is nothing but a place of suffering, Tomoya asks Nagisa if she’d leave with him and make a fresh start elsewhere. Nagisa feels that this town remains special because they’d met here, and it’s how they handle the future that matters, more so than the past. Visiting the correctional facility where his father is, Tomoya has no words and mirroring his sense of loss, the scenes are a faded out grey: even with Nagisa by his side, it seems as though there is no colour and hope in the world, where the past continues to haunt him despite his best efforts to break free. It might’ve been a beautiful summer day, but Tomoya sees none of this. He finally lashes out and strikes a wall in frustration, but before he seriously injures himself, Nagisa stops him. Another couple passes by, wondering what on earth happened. Besides the sound of cicadas, the scene is quiet until The Place Where Wishes Come True begins playing. A sense of calm is injected into the moment, and here, after seeing Nagisa exert herself to protect him, he comes to realise that his feelings for Nagisa warrant an 愛してる, the strongest expression of love in Japan. 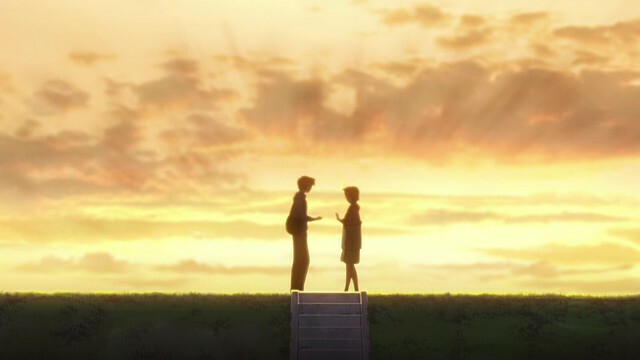 Again, ~After Story~ defies convention: Tomoya’s proposal to Nagisa is done without a ring, in one of the most unromantic locations possible, but nonetheless creates one of the strongest impacts in an anime. It continues to underline that the ordinary can be extraordinary, and that there is a magic in the everyday. For me, it makes sense to put a way-point here; it marks the beginning of another journey for Tomoya and Nagisa, and a glance at the calendar shows that I will be returning at the end of January for the next post on ~After Story~. I steel myself for this particular post, knowing it will be a difficult one to write for. It is here in ~After Story~ that the narrative takes a shift from high school to that of adulthood, of a world marked with responsibility and challenges. Immediately relatable is Tomoya’s resolve to keep active even while working out what he wishes to do with his future, and then the struggle Tomoya encounters in finding work-life balance during the early days of his work. By stepping out of school and into the real world, ~After Story~ ventures into a new direction that shows just how uncertain and uncomfortable being an adult is. However, for these difficulties, adulthood also comes with its own joys, as well. Effort in one’s career is rewarded, and people come to appreciate one another’s company even more strongly. 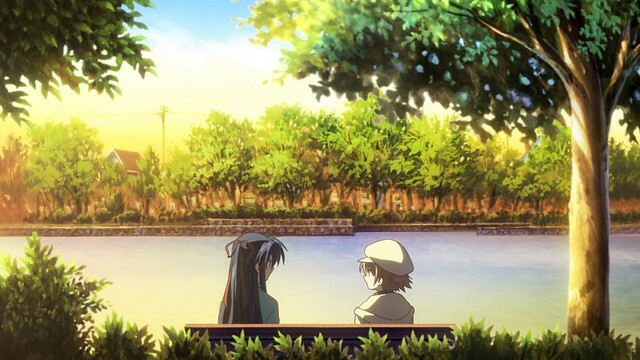 In its portrayal of Tomoya and Nagisa, ~After Story~ means to suggest that, far more than romantic gestures and activities associated with relationships, the endgame of the most meaningful relationships is that one finds a partner to stay by their side, acting as a source of support and confidant, while simultaneously, also be someone that one can support and confide in. No matter how difficult things get, knowing that there will be someone reliably in one’s corner is a major boost to one’s morale, and ~After Story~ shows that with the right partner, almost any seemingly-insurmountable problem can be addressed. 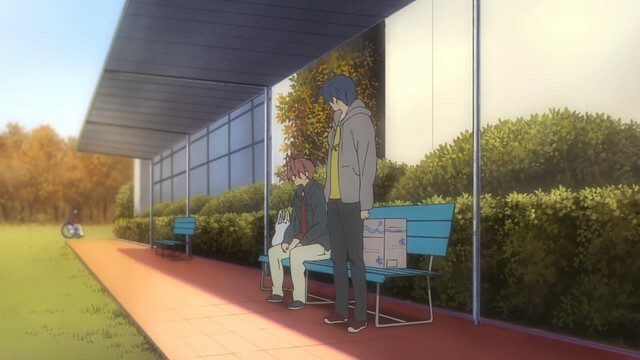 Seeing all of these things progress, from that day where Nagisa and Tomoya first met, to the present, creates incredibly human characters that audiences empathise and connect with. As they mature, Tomoya and Nagisa seem more life-like, prompting viewers begin to invest more into their story and hope for their happiness as they face the future together. This is what compelled players to continue with CLANNAD‘s visual novel, and why so many became engrossed with CLANNAD‘s animated adaptation. When Mei decides to stick around after Youhei shows no sign of having a concrete course of action following high school, Youhei attempts to find someone to pose as his girlfriend so Mei will stop worrying about him. He is unsuccessful until Sanae decides to help out, presenting herself as Nagisa’s sister. Sanae’s gentle and reliable demeanour causes Mei to continue worrying, and she reveals to Tomoya that the Youhei she remembers was once dependable and caring of those around her. She attempts to go out with Tomoya to draw old Youhei’s old nature, although Youhei seemingly remains unmoved. Youhei begins to withdraw from the others, and Tomoya learns that Youhei was once a soccer player who quit after hazing from more senior players. Mei wishes for Youhei to rejoin and agrees to pick up stray soccer balls as a result, but finds herself bullied by the soccer team. Youhei and Tomoya begin fighting the soccer team, causing their members to disperse. Emotions boil over – Youhei and Tomoya slug it out, stopping when Mei and Nagisa intervene. In the aftermath, Tomoya and Youhei, upon seeing their respective battered visages, recall how they’d first met and share a good laugh. Youhei is terrified to learn that Sanae is actually Nagisa’s mother, and flees from a violent Akio. 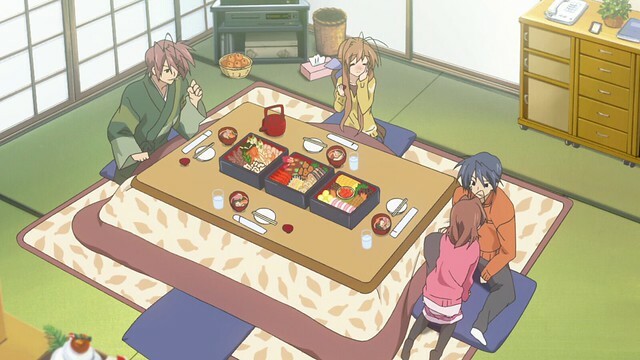 Mei returns home, while Tomoya and Nagisa continue to spend time with Youhei. Autumn sets in, and with it, the Autumn Festival: while speaking with Misae, Tomoya dozes off. He learns that Misae met an unusual boy, Katsuki Shima, in her final year of high school. Despite being annoyed by his presence initially, Misae comes to spend more time with him after her heart is broken upon learning her crush has a girlfriend already. With his earnest attitude, Misae begins falling in love with him and invites him to the autumn festival. However, Katsuki learnt earlier that his existence is owed to the original Katsuki’s wish to be with Misae. On the night of the festival, Misae admits that she’s in love with Katsuki, and he dissolves into tears, knowing he won’t be able to fulfil his promise to her. 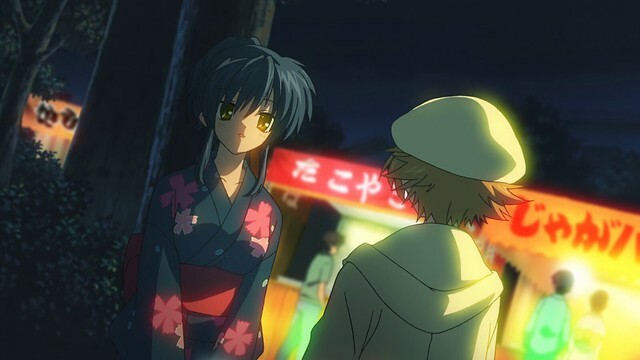 Tomoya awakens, and attends the autumn festival. They run into Misae here, and Tomoya recounts Katsuki’s story to Misae, who realises that Katsuki is still with her after all this time. By pushing Tomoya into considering his friends’ future and the pasts of those senior to him, ~After Story~ provides audiences with greater insight into the directions that Tomoya must take as time passes. In having him resort to putting on a façade to drive Youhei forwards, and eventually physically fighting him, Tomoya shows that while he prefers indirect action to motivate people, he is not afraid to get his hands dirty and be direct. A real friend is someone who is open and honest, even when what they say is not pleasant to listen to. A real friend similarly can listen to this and come away stronger for it. Thus, when Tomoya encourages Youhei to find focus in his future, the resulting fight and resolution does eventually have an impact on Youhei. In the immediate future, Youhei remains the source of comic relief, but subtle changes can be seen, as well. Besides the future, the past is also explored: listening to Katsuki’s story and recounting things to Misae shows that Tomoya is perceptive. He sees commonalities between the lessons and experiences of his seniors, and those of his own experiences. In this case, Tomoya understands what falling in love is like and the strength of these feelings, as well as what can happen when these feelings go unacknowledged. Acting on what he feels is right, Tomoya is able to help Misae attain closure when he learns Misae’s cat is actually Katsuki; in doing so, Tomoya also shows that he is aware of Kyou and Tomoyo’s feelings for him to some extent, further illustrating that despite his appearances, Tomoya is a complex, multi-dimensional character whose experiences, especially with Nagisa, have begin bringing back the side of him that genuinely represents his personality and beliefs. While seemingly unrelated to the main events in ~After Story~, Youhei and Misae’s stories serve to give Tomoya a chance to interact in a context where romance is not a possible outcome. His experiences in both show that regardless of who it is at the receiving end, Tomoya is ready to listen or fight his way to a solution. While I deal with Flickr’s upcoming plan to eliminate half the life in the universe everything except my thousand newest images, I still have a few posts that I can continue using Flickr for, such as this post for ~After Story~. Readers looking through my older posts may find the images to be a bit fuzzier than they were before: this was because I used a tool to quickly resize images and publish them to Imgur for hosting. Once I’m done the migration, I’ll consider different avenues or methods to host new screenshots. It’s been a while since I’ve written about ~After Story~, and last we left off, Tomoya had won a baseball game. Immediately, ~After Story~‘s first episode gaves off a melancholy vibe, and in doing so, sets the expectation that Youhei’s backstory has a similar weight as that of anyone else’s, even if he is the comic relief character. 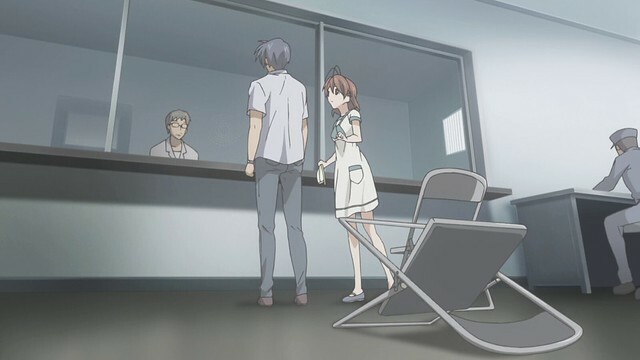 However, like CLANNAD has done previously, things open up with a humourous tone, allowing audiences to laugh as Youhei gets bested by his circumstances at every turn. Here, he runs afoul of Kyou after trying to get Ryou to pose as his girlfriend. Ahead of Mei’s appearance, Youhei decides to find someone willing to pose as his girlfriend in a bid to convince Mei that all is well with the world. There are some that posit one has their game together if they are in a relationship; while it is true that a relationship can be indicative of maturity (it takes maturity to reach compromises, solve problems and work together), a hastily thrown-together relationship of the sort that Youhei is looking for here will lack the elements of a real relationship, and as such, audiences are left to wonder if Mei will see through Youhei’s ruse. Making only brief appearances until now, Mei is the opposite of Youhei, being motivated, determined and attuned to the environment around her. Mei is voiced by Yukari Tamura, whom I know for her roles as Onegai Teacher‘s Ichigo Morino, Mai Kawasumi of Kanon, Remon Yamano from Ano Natsu de Matteru, Kiniro Mosaic‘s Isami Omiya and Rika Furude in Higurashi When They Cry (yes, I watched Higurashi some years ago). It’s stated that the Sunohara family resides in the inaka, so Mei’s travelling to visit Youhei is a big deal. Sanae agrees to pose as Youhei’s “girlfriend”, and a part of the dramatic irony is wondering how long the ruse can be kept before Mei suspects something; after all, she’s very observant. However, for the most part, Mei seems unaware of anything out of the ordinary, attesting to Sanae’s ability to sell it and play the role of Nagisa’s “older sister”. I’m not sure how easy or hard it is to spot these things in real life, but in Tom Clancy’s Threat Vector, NOC Adam Yao is described as being able to play a second role convincingly to allay suspicion from those who would tail him. When Mei sees Sanae, she worries that Sanae is the sort of person to dote on Youhei and inhibit his growth. 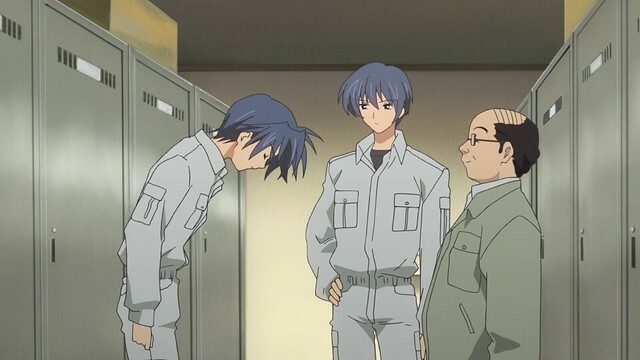 One of the things that CLANNAD excels at over its predecessor, Kanon, is that even the comic relief character has a worthy backstory: Kanon‘s equivalent of Youhei, Jun Kitagawa, is relegated to a minor role and does not gain much development. 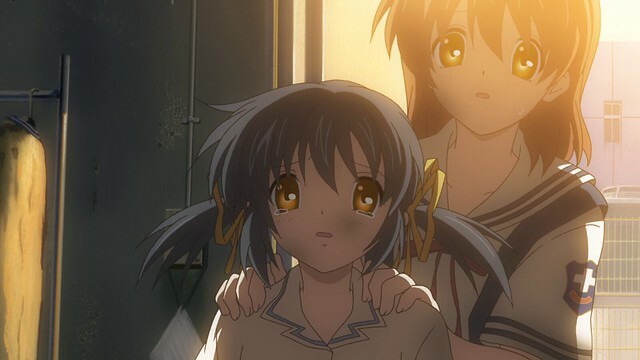 In many ways, CLANNAD feels like the successor to Kanon, utilising very similar elements to tell a much more nuanced, compelling story by applying all of the learnings from Kanon. While on their “date”, Mei calls Tomoya “onii-chan“, sending a chill up his spine. While used typically amongst siblings, women will occasionally use it to refer to older men in an endearing fashion, and given the application of honourifics in Japan, this is typically used only amongst people who are close, hence the embarrassment factor. 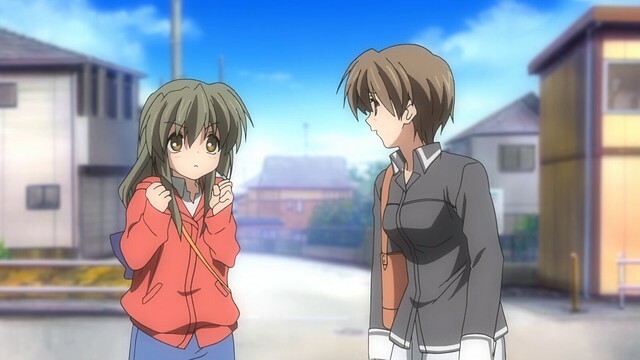 Here, Mei manages to evoke an expression I don’t think we’ve seen from Tomoya up until this point in CLANNAD. Kyou, Ryou and Kotomi run into Tomoya while he’s under the influence of Mei’s onii-chan, and the three run off in terror. The joy of the moment is quickly lost, but it is typical of CLANAND to create these one-off moments that lighten the mood up. Subsequently, Tomoya and Mei do the things that one might do on a date; Mei acts more akin to a younger sister than a date, and in retrospect, her mischievous mannerisms bring to mind those of GochiUsa‘s Maya. Such characters previously were not particularly noteworthy for me, but since GochiUsa, this feeling has dissipated, and I do find it fun to see what kind of dynamics that such characters bring to the table. 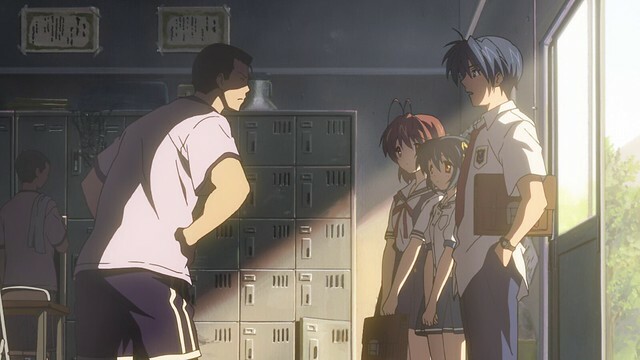 Exemplary use of lighting in CLANNAD continues into ~After Story~: when Mei reveals to Tomoya and Nagisa Youhei’s past as a soccer player, the lengthening shadows create a sense of hopelessness and distance. 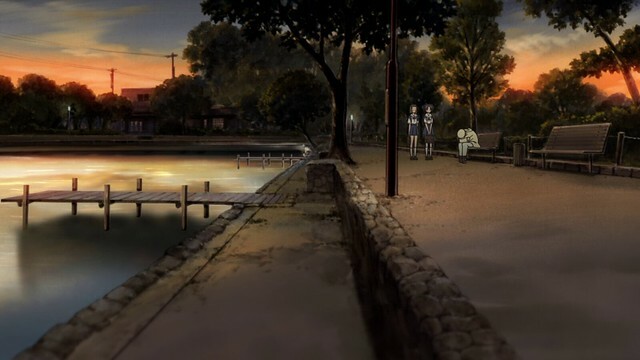 Application of colour in CLANNAD allows Kyoto Animation to convey emotions and feelings that dialogue and aural cues alone cannot, and with this in mind, Kyoto Animation does tend to rely more heavily on lighting in drama than in comedies: series like Violet Evergarden and Sound Euphonium similarly use time of day and weather patterns to accentuate a mood, while more comedic works like Amagi Brilliant Park and Miss Kobayashi’s Dragon Maid tend to go with facial expressions to convey comedy. Eventually, the decision is reached, that Youhei might need to rejoin the Soccer Team. It’s admittedly a short-sighted solution to a much bigger problem, and while we are a society that holds quitting is for losers, there does come a point where one can only endure so much before it becomes a better choice to seek different avenues. I would tend to argue that Youhei’s solution would not be to rediscover his interest in soccer, but to find another path to walk with conviction. ~After Story~ paints this in a very blunt manner: the Soccer Club evidently does not want Youhei back, and they make it clear by setting a Sisyphean task for Mei. 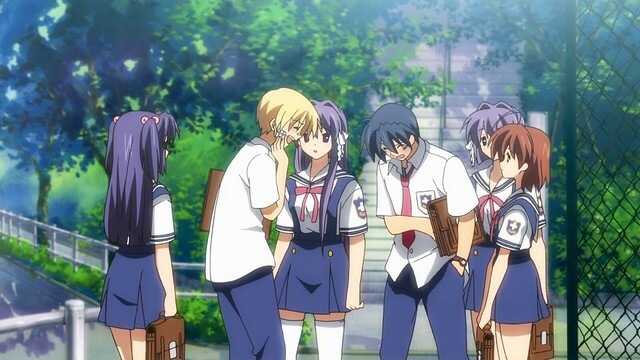 Seeing enough, Tomoya confronts the club’s leader, and when they begin bullying Mei openly, he makes to fight them. In CLANNAD, hostile characters have deliberately small, narrow eyes that make them immediately detestable. One admires Tomoya’s restraint in not engaging them immediately on the basis of appearances alone. Youhei appears at the last, last second and opens the fight after the Soccer Club members begin bullying Mei physically. While often at the receiving end of a beating, Youhei and Tomoya manages to fend off the entire soccer team, causing them members to flee. 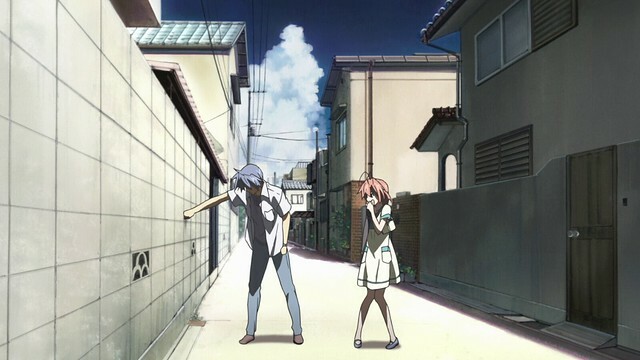 The mechanics in CLANNAD are very inconsistent; Tomoyo can defeat entire gangs on her own, and Kyou’s capable of throwing books that punch through concrete, while Youhei can survive encounters with both without lasting damage. However, against the likes of the soccer club, real damage is caused. 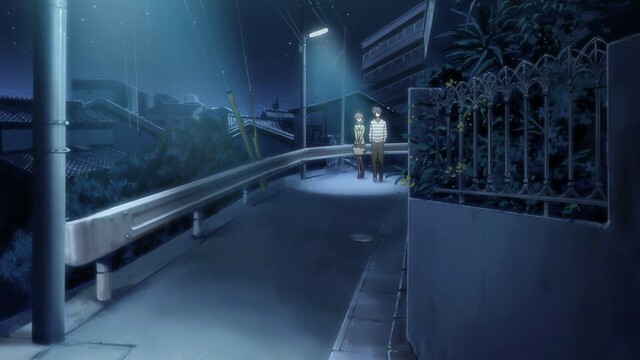 The sense of melancholy at day’s end gives way to a rain shower: the dark skies and heavy rain mirrors the grim mood that Tomoya and Youhei both feel. Exhausted from their fight with the Soccer Club earlier, Tomoya and Youhei’s own fight shows their exhaustion, with each punch and throw exposing just how physically tired both combatants are at this point in time. However, driven on by their feelings, and sense of what is right, they exchange blows until Mei and Nagisa implore them to stop. While seemingly pointless, Tomoya and Youhei’s fight serve to show the other the conviction each has in their respective beliefs, as well as the absurdity of their choices. While no more words are to be had here, it is implicit that Tomoya and Youhei come to an understanding here on both what needs to happen as the move ahead. They leave the soccer field battered and bruised, in the company of those who care about them. The next day, under beautiful skies, Tomoya and Youhei realise the comedy of their situation and burst out laughing. Summed with their tacit agreement from the day before, it’s clear they’ve made up. 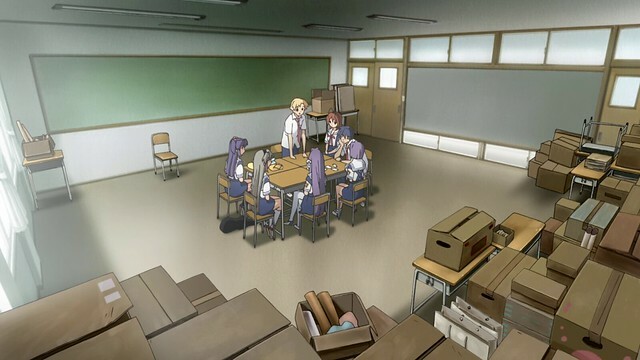 The weather reflects this in full, and as the two share a laugh, Nagisa, Kotomi, Kyou and Ryou show up, clearly puzzled as to what’s going on. Much as how friendships between women can be a bit of an enigma for men, the way men interact with one another can similarly be confusing for women, as well. To make it absolutely clear that a new status quo is reached, the question on everyone’s mind, of whether or not Youhei ever learns that Sanae is actually Nagisa’s mother, is answered at the end of Youhei’s arc. It is absolutely hilarious, resulting in Akio chasing down Youhei for having messed with his wife. 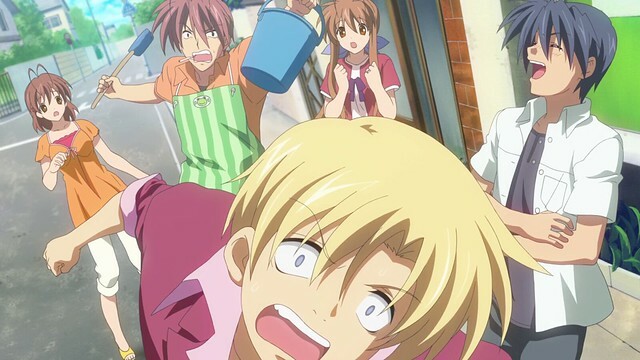 Nagisa and Sanae are shocked, while Tomoya is busy laughing at Youhei’s predicament. With this, Youhei’s arc comes to an end, affirming Tomoya and Youhei’s friendship to audiences. While it is important to look ahead and plot one’s course for the future, there are lessons from the past that can also be relevant. 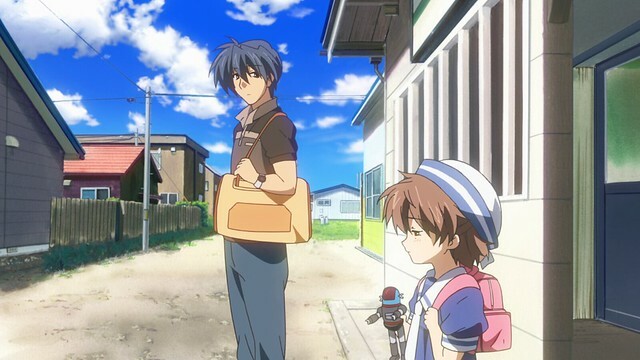 The contrast between future and past foreshadow the role that both will have in Tomoya’s life later down the line, but at present, these stories primarily serve to illustrate the way Tomoya handles his challenges and also further the sense of depth and connection present in CLANNAD that makes this series particularly memorable and timeless. Before delving any further, Misae’s arc and story with Katsuki is entirely told in a dream, being detailed enough so that one could reasonably surmise that it is faithful to what Misae experienced. This story is recounted to Tomoya while he dozes off at Misae’s place, and because of how time perception in dreams work (as well as just how limited our understanding of dreams generally is), it is not implausible that Tomoya would have heard the entire story over the course of a 10-15 minute span. Katsuki’s involvement is simple: he appears out of the blue to grant Misae one wish in exchange for having helped restore his spirits some years before, while he was recuperating in the hospital. Misae sees him as little more than a nuisance: when he learns that Misae holds feelings for one Igarashi, he tries to help her advance things along in fulfilment of his promise to her. However, Katsuki’s naïveté works against him. Misae is this generation’s Kyou and Tomoyo rolled into one, having a bit of a temper and is quick to violence whenever annoyed. She also happens to be the student council president, and is best known for managing to encourage perfect attendance for a full week amongst her students. This similarity is likely deliberate, showing that while things change, there are also things that remain quite similar. I imagine that this is one of the things that teachers will appreciate – having taught cohort after cohort of students, similarities between different students will become apparent. At Katsuki’s insistence, Misae attempts a kokuhaku to Igarashi, only to learn he already has a girlfriend. While she’s heartbroken, Katsuki is inconsolable, feeling that it is his fault for having brought pain to Misae. It takes a bit of convincing for Katsuki to lighten up, and it is also here that Misae opens up to Katsuki. While the day is ending, the colours of the scene are also richer, more saturated; audiences are left with the sense that even though something is ending, something new is beginning, as well. Misae’s feelings for Katsuki emerge as the two spend more time together; while he might not be forward and confident, his gentle and kind mannerisms are his strong points. Fiction often has a second love be successful, and I know of a few stories in reality where folks became happy couples after one or both suffered recent heartbreak. I’m happy that people can find their promised people in this manner, but for me, romance and the prospect of finding someone special remains consigned to the realm of fiction. Since that event of four years previously, things simply have not been working. One day, while waiting for Misae to finish her duties, Katsuki runs into Misae’s friends. They decide to pull off some fieldcraft with the aim of allowing Katsuki to see Misae while she’s on her student council work, and the result is quite amusing; he manages to pull off the disguise effectively and fools most everyone, save Misae. ~After Story~ continues making use of blood reds and oranges in an environment filled with shadows to signify a particularly foreboding or difficult moment. One could guess what will happen even without dialogue owing to the colours. 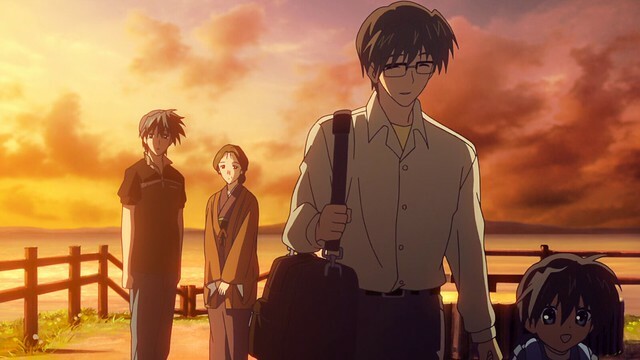 Here, Misae’s friends take him back home after he confesses to forgetting where he lived, and learn that Katsuki Shima had been deceased for quite some time. Katsuki learns here that the original was a young boy who’d died, and that the boy’s feelings had been strong enough to manifest in human form to pay back Katsuki’s gratitude to Misae. Because the blacks and reds give way to a gentler palette of evening colours, viewers immediately feel a sense that the revelation, while shocking in the moment, is something that isn’t meant to be taken as a game-ender. Misae’s friends attempt to reassure Katsuki here, and audiences familiar with Kanon will be reminded of Makoto’s arc, where Yuuichi similarly remembers that he’d once befriended a fox whose gratitude was strong enough to manifest in a human form for a time. This is a recurring theme, and suggests that Maeda considers love to transcend species, being something that is quite wonderful. On the night of the autumn festival, Misae and Katsuki share a moment together: by now, Misae is in love with Katsuki, but Katsuki regrets being unable to reciprocate her feelings. Despite her promise to be with him forever, the magic that allowed him to retain a human form expires, and Katsuki vanishes. In spite of him returning to his original form, Katsuki’s feelings remain, and he manages to find Misae once again. From Misae’s perspective, it would be fate that the stray cat she encountered happens to be Katsuki. I’ve long heard that the things one experiences in life, and the reason why they happen, remain an enigma. Supposedly, this is why some people go through many occupations and prospective partners before finding the right ones for them, while others seem to make their first choices work out of the gates. Fate and free will has long been a subject of debate, and with my experiences, I find that reality will present individuals with both. Others have characterised the relationship between free will and fate as being one where neither can exist without the other: fate creates a decision, and free will is consciously choosing which decision to take. While it’s subtle, I wonder if Nagisa and Tomoya being together at the autumn festival could qualify as foreshadowing of what is to come; after all, Katsuki and Misae were separated here, reuniting again later. Tomoya decides to tell Misae of what his dream showed him and helps Misae reach closure at the very same festival where she discovered her love for Katsuki. ~After Story~‘s opening arcs take a very similar approach as CLANNAD, although the focus has shifted towards world-building. Supernatural elements and everyday elements are explored to further humanise the characters – Maeda’s use of the supernatural is intended to provide a tangible explanation for why things in life happen the way that they do, attesting to how complex and mysterious life is. With these two arcs over, the next stage in ~After Story~ will deal with the balls of light and the world outside of school. Besides building out Tomoya’s character further, ~After Story~ capitalises on its earlier episodes to further develop the other characters and the universe to build a truly well-thought out, captivating world. From a narrative perspective, having Tomoya deal with Youhei and reigniting Youhei’s motivation shows the strength of their friendship. Audiences now understand why Youhei and Tomoya remain friends in spite of Youhei’s flippant attitude and Tomoya’s penchant for pranking Youhei: their friendship holds weight after what audiences have seen, and we thus come to appreciate that in spite of the comedic, even idiotic interactions between the two, the reality is that Tomoya and Youhei do support one another when the moment calls for it. 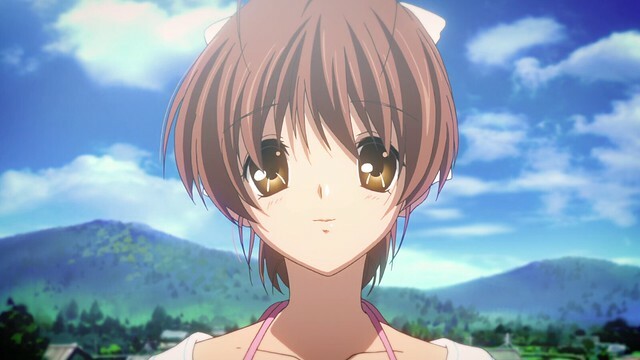 Similarly, exploring Misae’s story and introducing an element reminiscent of Makoto’s arc in Kanon reinforce that there is a supernatural component in CLANNAD. While the supernatural had always been subtly present in CLANNAD (and in Fuuki’s arc, not-so-subtle), that it is making a more noticeable appearance now means that there are forces at work in CLANNAD that should not be so quickly dismissed. The sum of these two stories in ~After Story~ thus act to set the expectation that every story Tomoya experiences have weight, and that it is the sum of his actions, in conjunction with the supernatural aspects of his world, that will come to impact and shape his future. Subscribe to receive email notifications of our content if you're interested in seeing more content similar to this. Your email must check out: it is not sufficient to have a syntactically valid email, the inbox must also exist and not belong to a disposable service. There are ways of checking, so don’t test us. If you’re commenting to offer a correction, you must also provide your thoughts on the topic discussed in the post. We’re always curious to know what you thought of something, well beyond the technical aspects of a show.